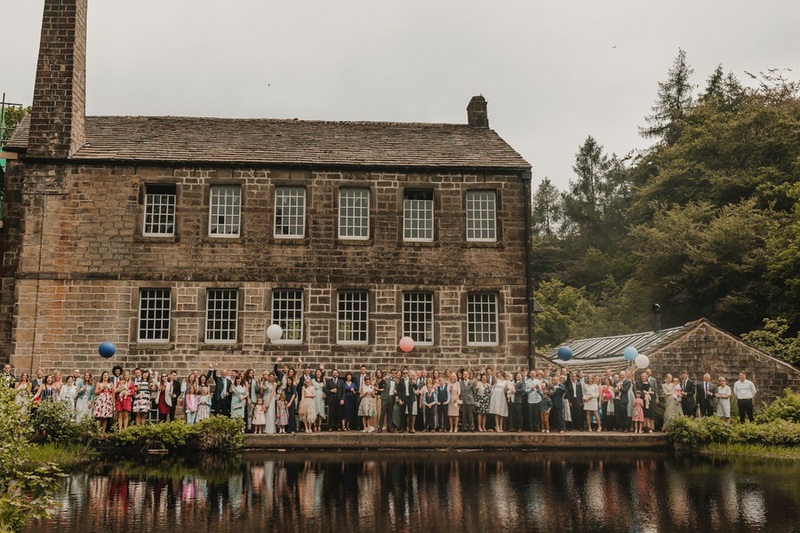 Jamie and James’ gorgeous botanical inspired wedding, took place at Gibson Mill, a National Trust site situated in the valley of HardCastle Crags, Hebden Bridge. 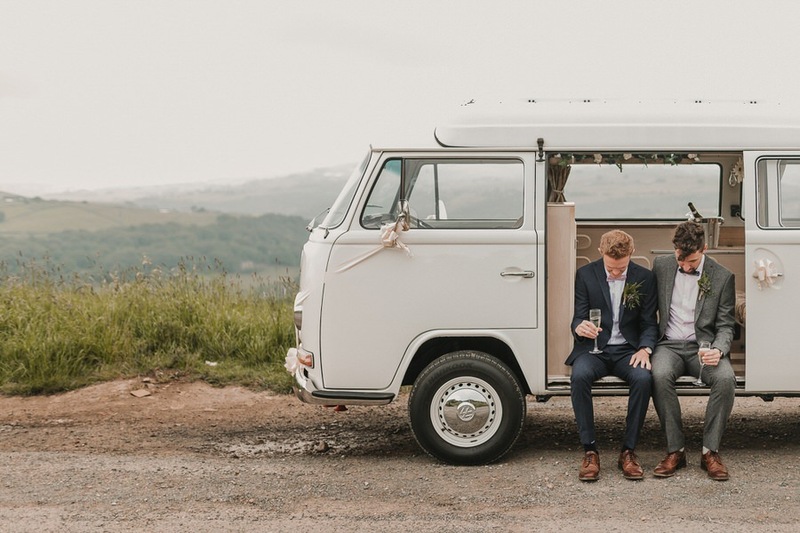 The reception part of the wedding was over in Halifax, so I went with the two grooms over onto the moortops for beautiful photographs with their campervan before making an entrance at Dean Clough’s ‘The Arches’. 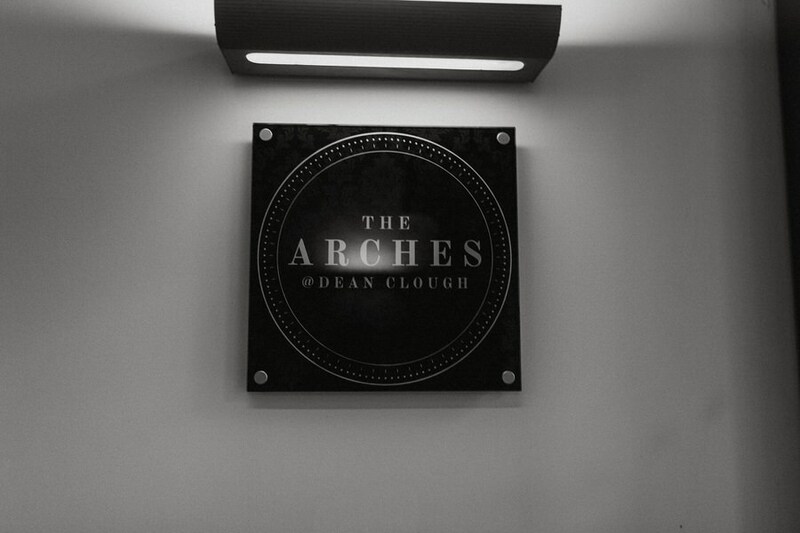 The Arches has a perfect blend of modern and industrial with long tables, white walls criss-crossing fairy lights across the ceilings. 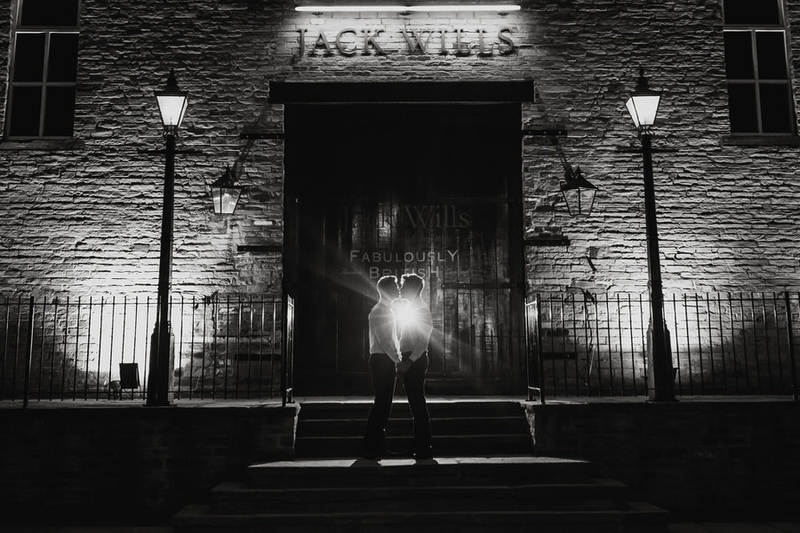 The boys wanted some photographs to show off the local architecture, so we had more photos of the modernised mills before heading back inside to dance the night away. 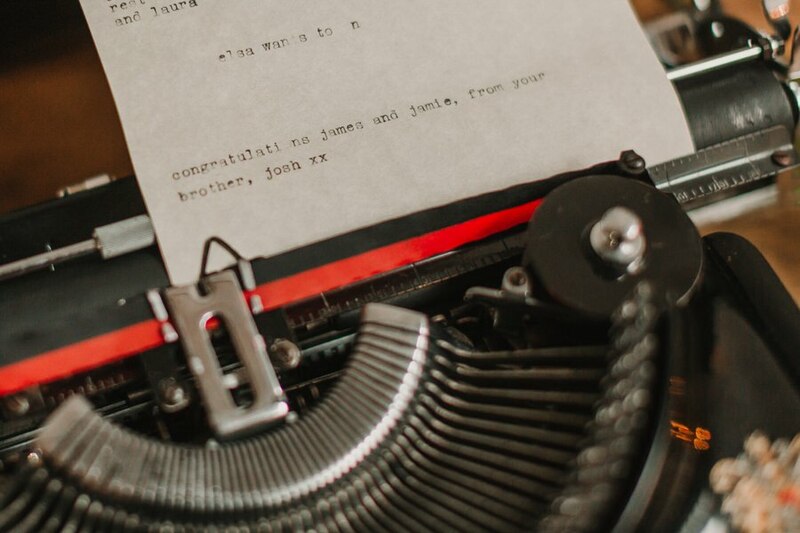 I, personally, never saw myself getting married and nor did James. 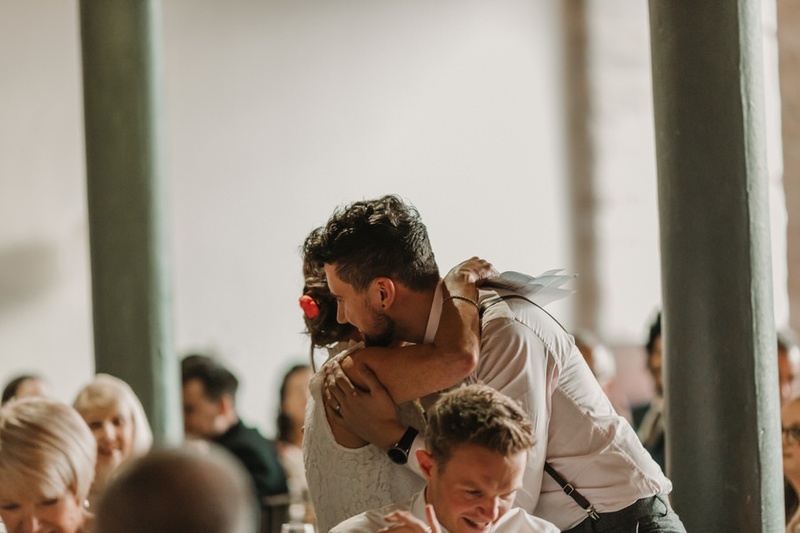 What a lovely thing that we found each other, first, and, secondly – panic – where do we start? 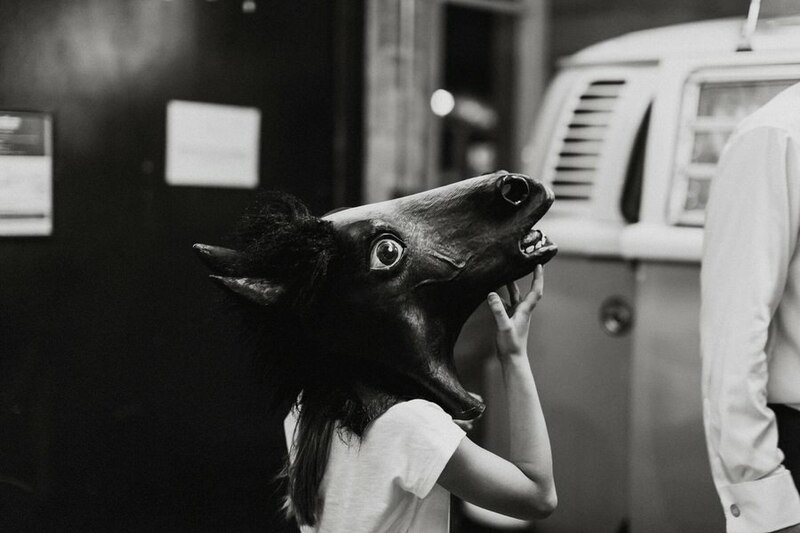 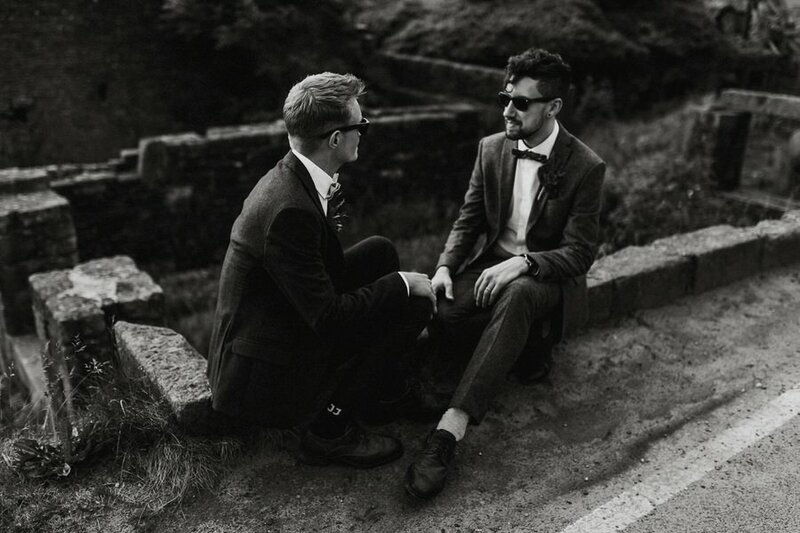 We asked some friends for advice and everybody said the same thing – venue first. 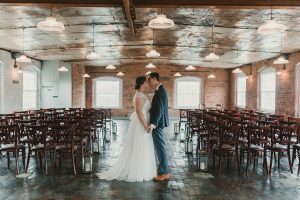 We searched online, knowing the type of setting we wanted: industrial, green, outdoors, old/vintage, exposed brick, maybe? 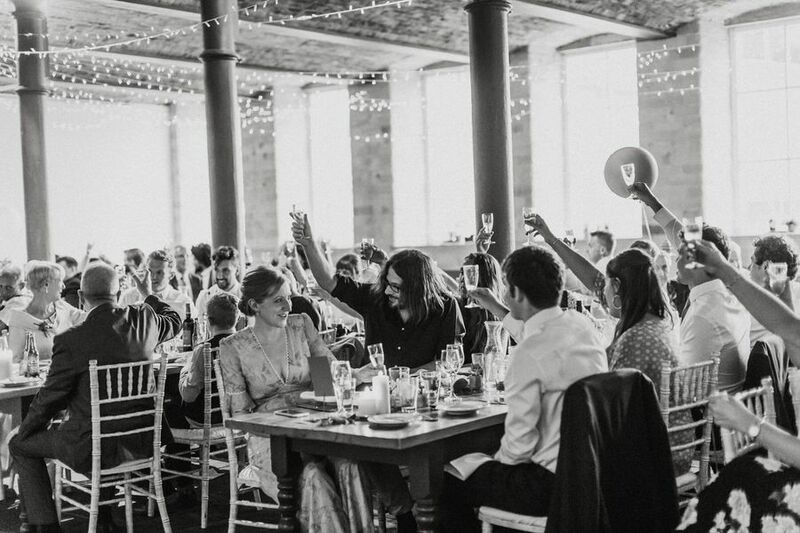 We wanted a venue that suited us and would also look like a bar we’d like to drink in; a place where friends and family could dance past midnight and sleep nearby; an equally impressive but cosy venue where all our loved ones could be together. 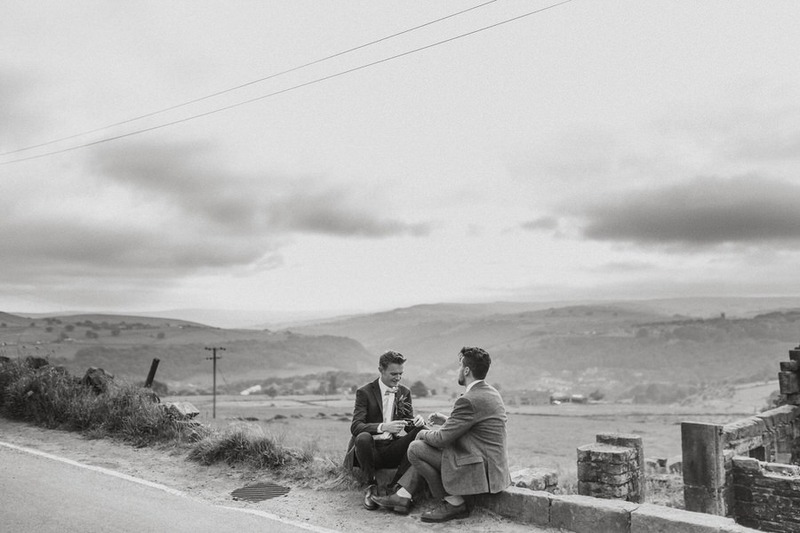 We looked at two venues quite some distance away and liked them both. 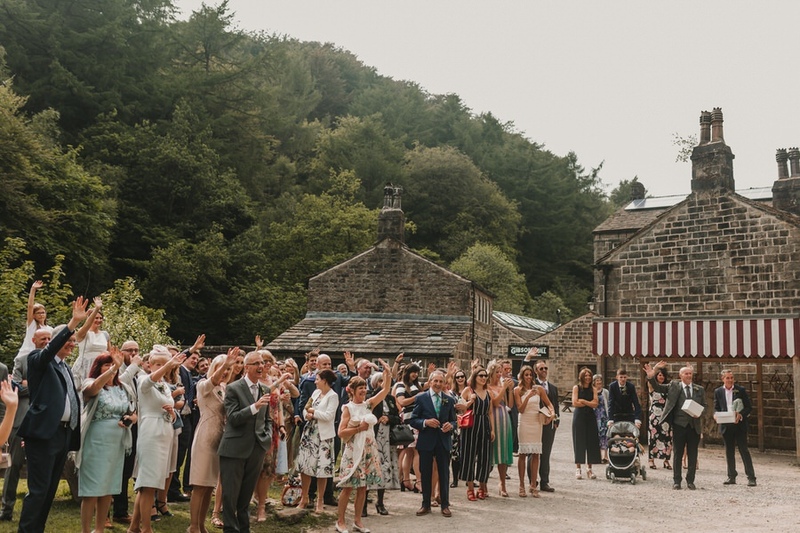 Then, by chance, we found the reasonably local setting of Gibson Mill at Hardcastle Craggs, Hebden Bridge for the ceremony. 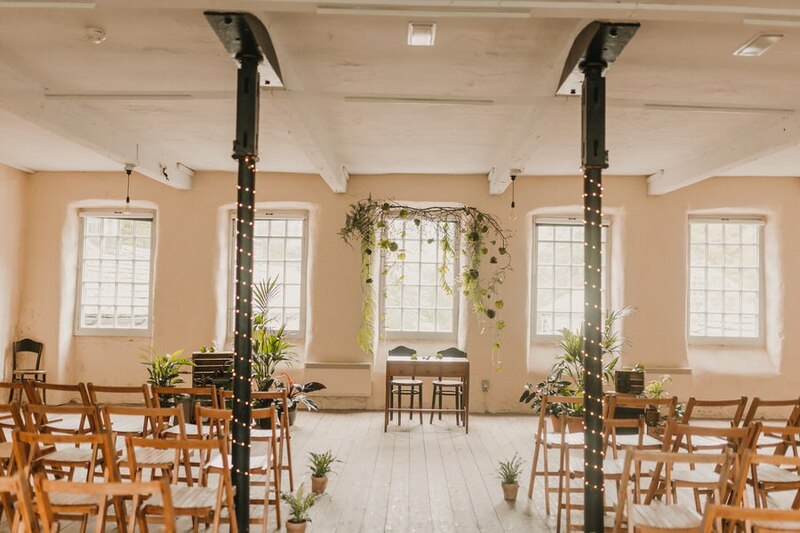 With an eternal fondness for the bohemian town (Jamie) and a love of all things eco (James), the electricity-free, wifi-free, off-the-grid venue quickly went to the top of our list. 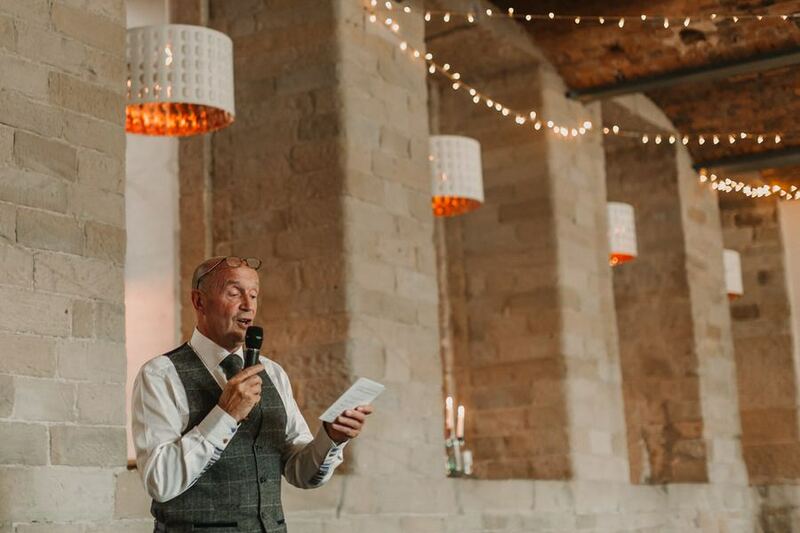 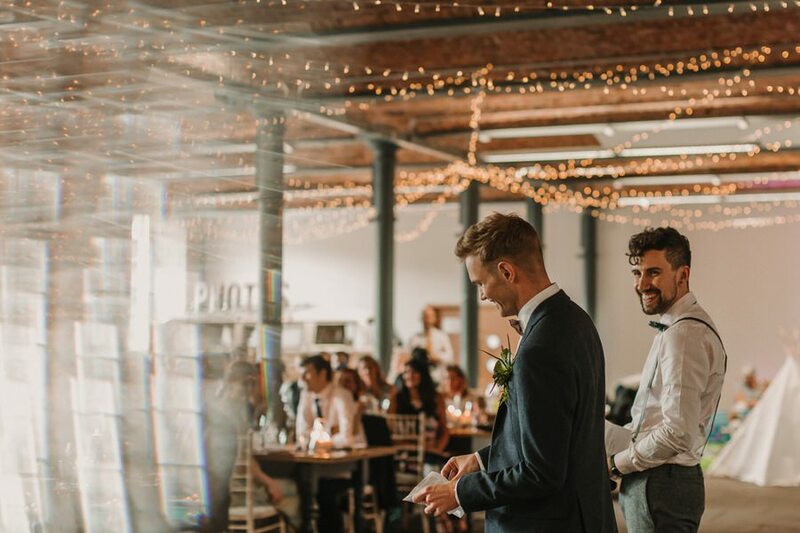 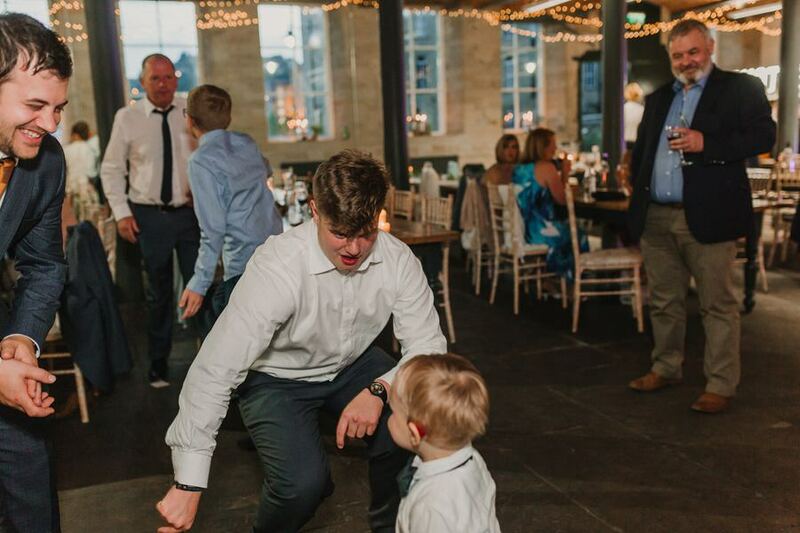 Similarly, The Arches at Dean Clough Mill was a perfect match, – it had the industrial feel we liked, gorgeous barn doors, beautifully strung fairy lights and lots of room to play with for a wedding breakfast and evening space. 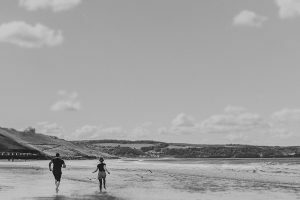 We sent out Save The Dates quickly, asking people to keep the weekend free. 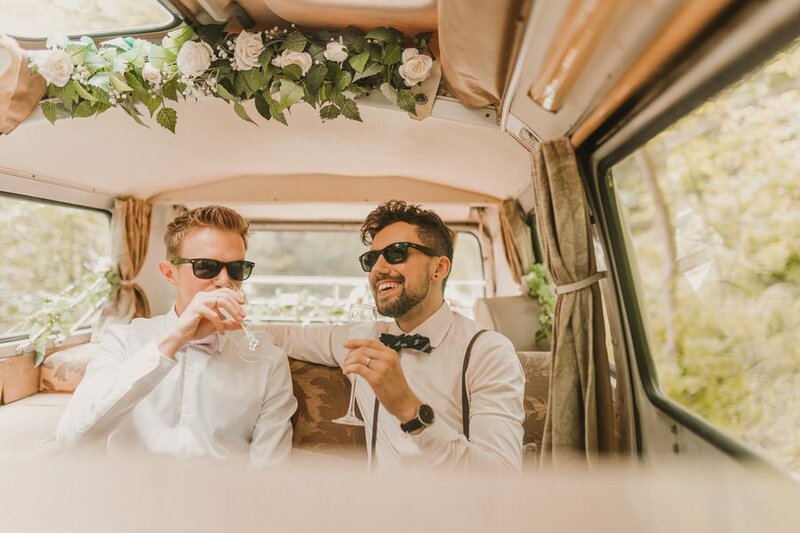 One of the first things James and I did together was build a Lego campervan that Joanne, my sister, bought me for my birthday. 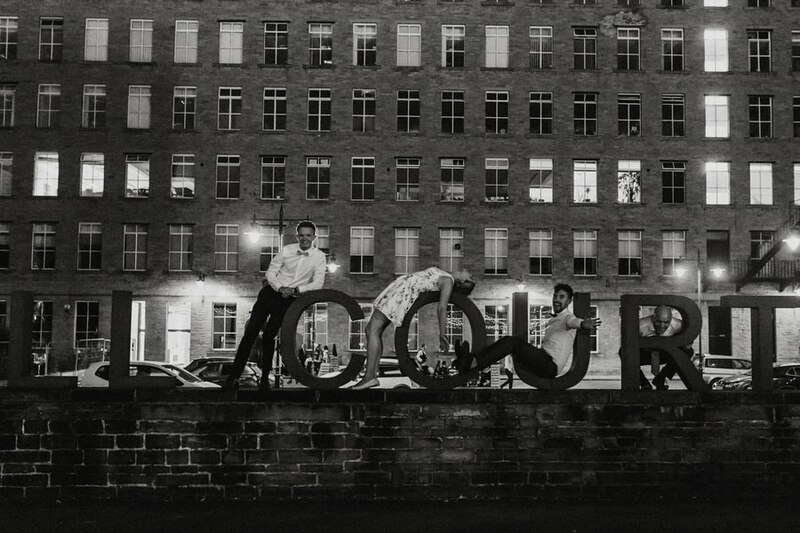 It only seemed right, then, that it would feature on our Polaroid-style memos. 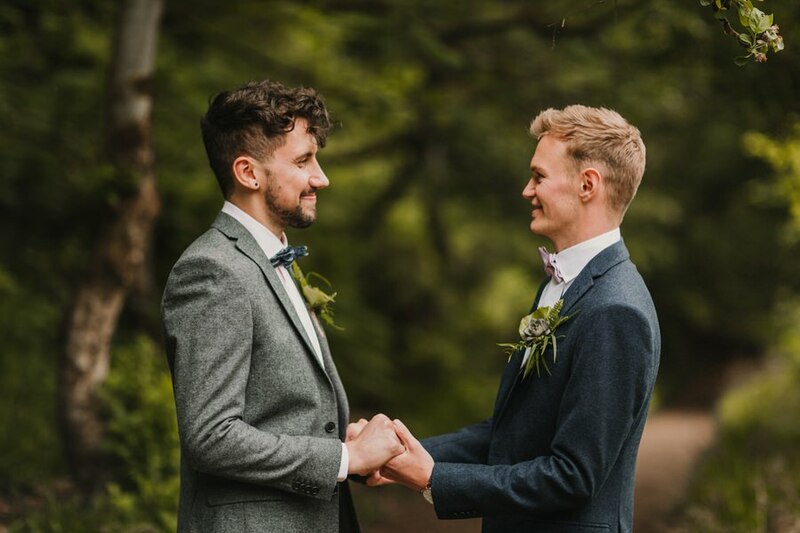 That, plus our Lego lookalikes (the blond hair! 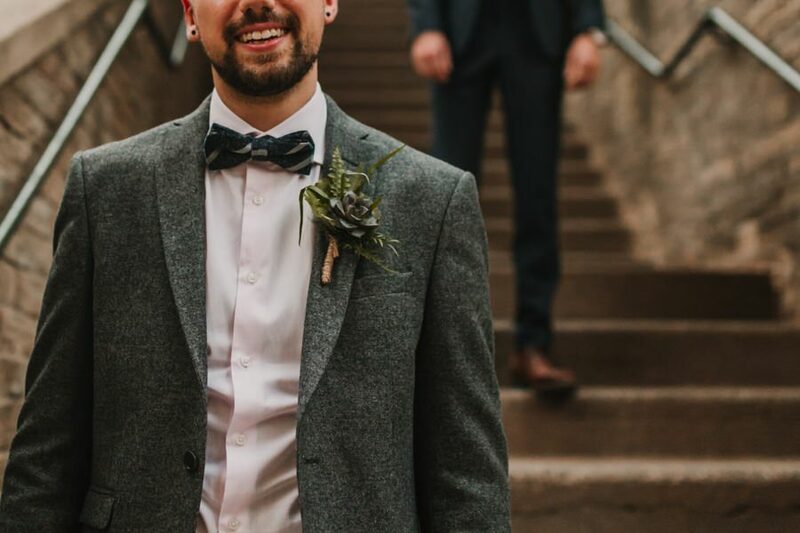 The beard! 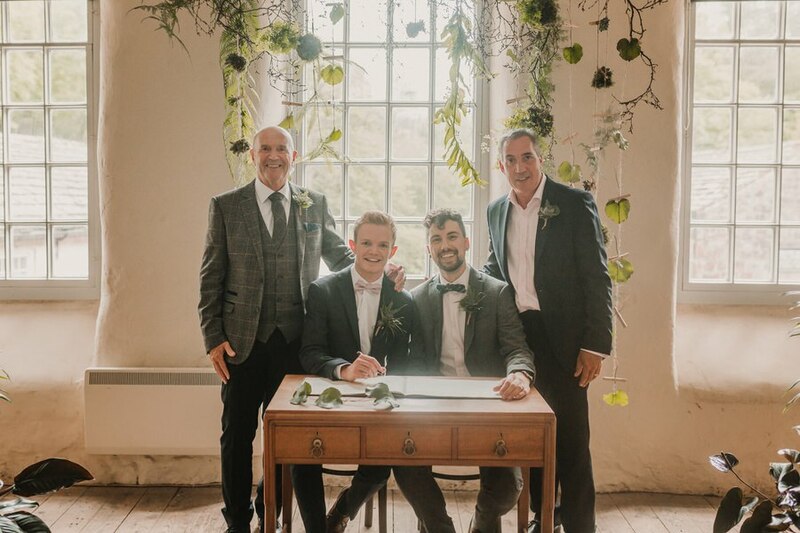 ), and, of course, a leafy background (spoiler alert: nice wrapping paper BluTacked to a wall) completed the look that, at the time, we didn’t know would become key themes of the day. 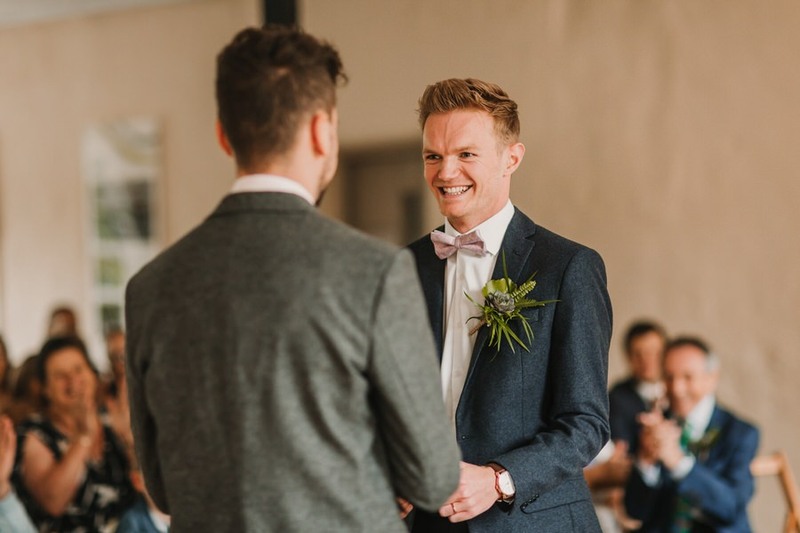 The final sentences above would be my overarching advice to any couple currently planning a wedding – simply, do what you like. 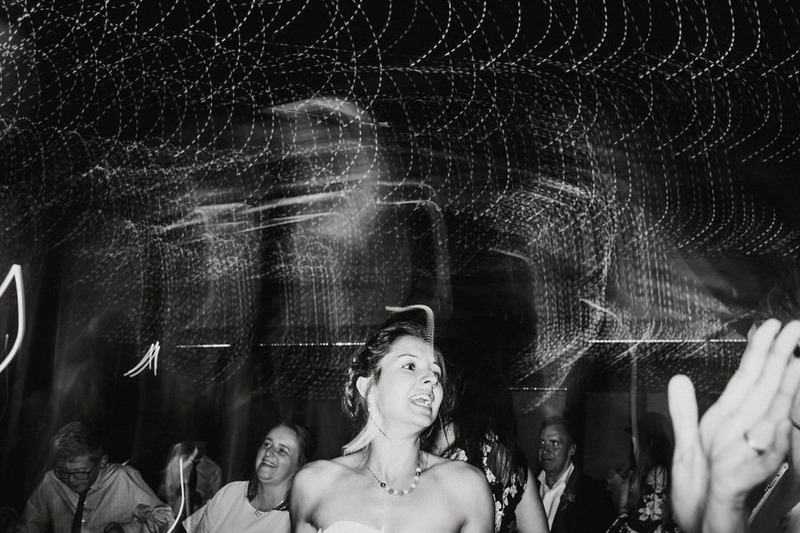 The wedding should be fully you, screaming at the top of its lungs that it is your day. 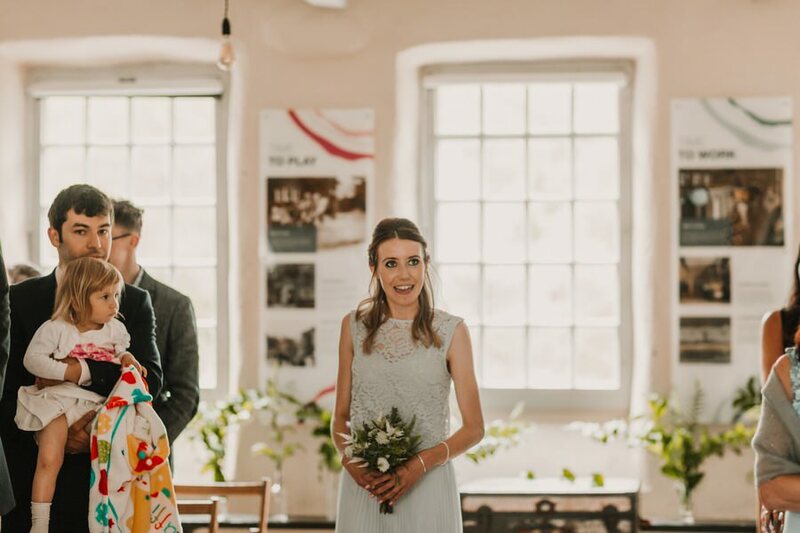 Our wedding was a big, elaborate version of us, our interests and our home together, just on a grander scale… only with (slightly) more cake. 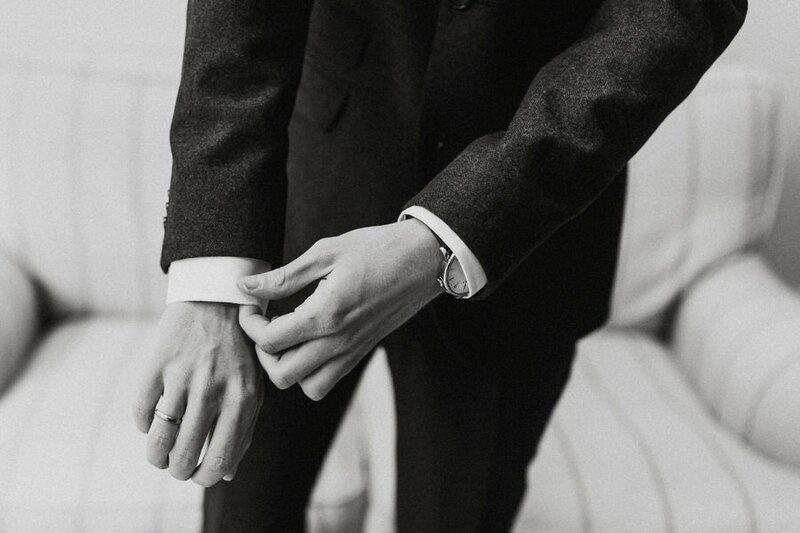 Next, we got our suits. 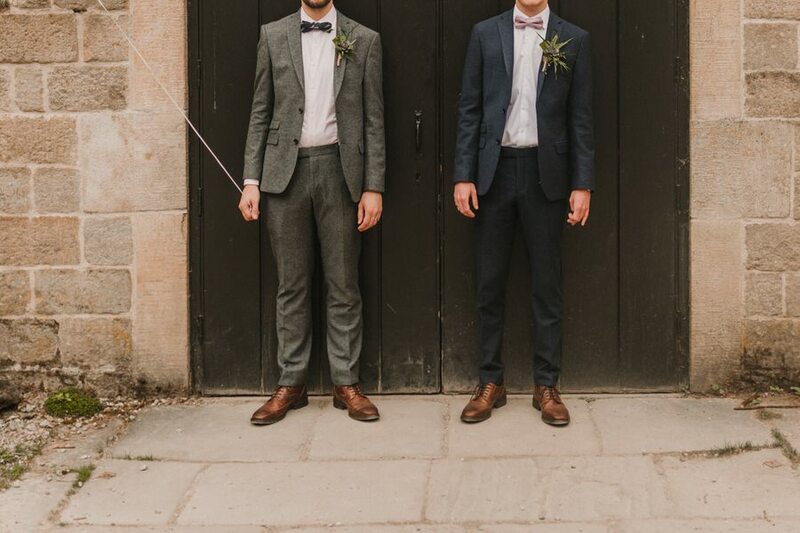 We chose two identical Alexandre Of England two-piece suits – one a dark navy blue and one speckled grey, two pairs of brown Bertie brogues and two Reiss shirts (pink and white). 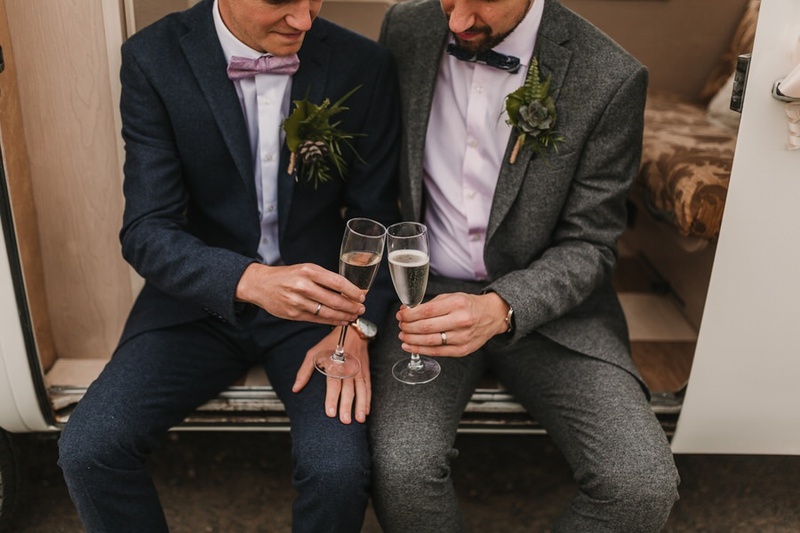 My pink bowtie was from Ted Baker, and James’s blue and grey striped bowtie was from Paul Costelloe. 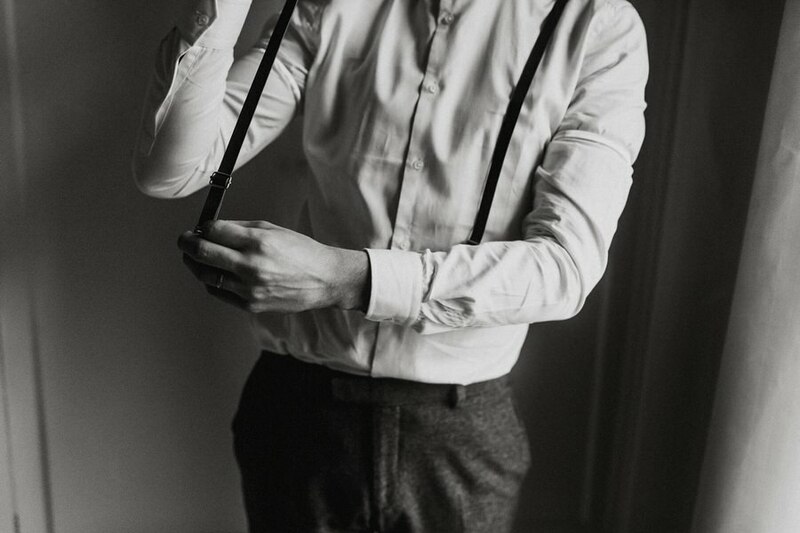 A note to all guys out there – purchase some shirt arm bands and you’ll instantly feel extra smart. 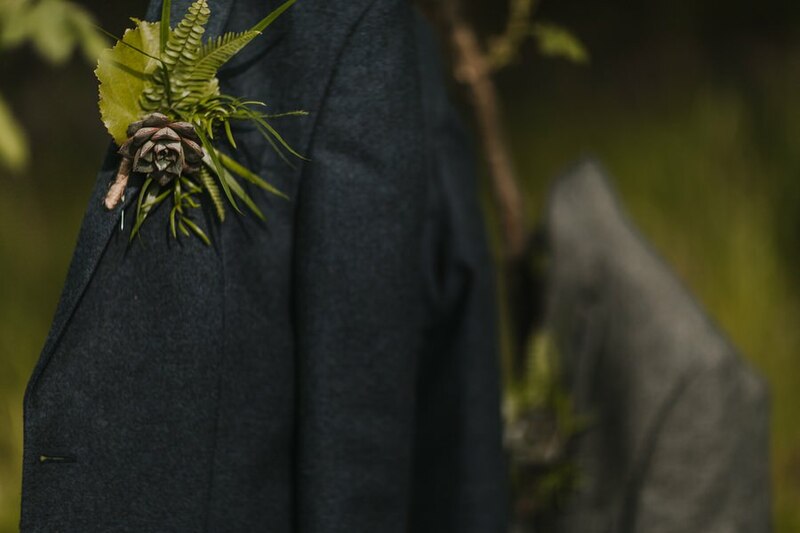 Returning to our thoughts on flowers, we really do have none but what we do have is leaves and green: cactuses, ferns and succulents. 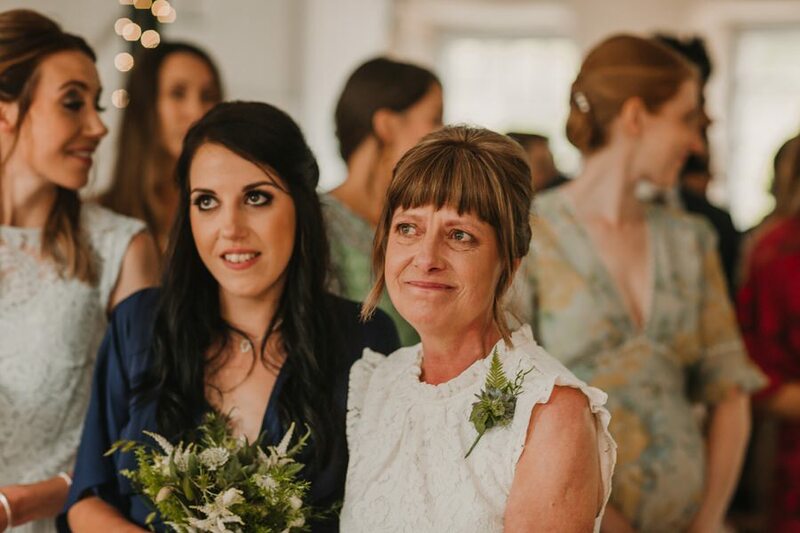 Our button holes and the bridesmaid bouquets were made by The Willow Garden, and we adored them. 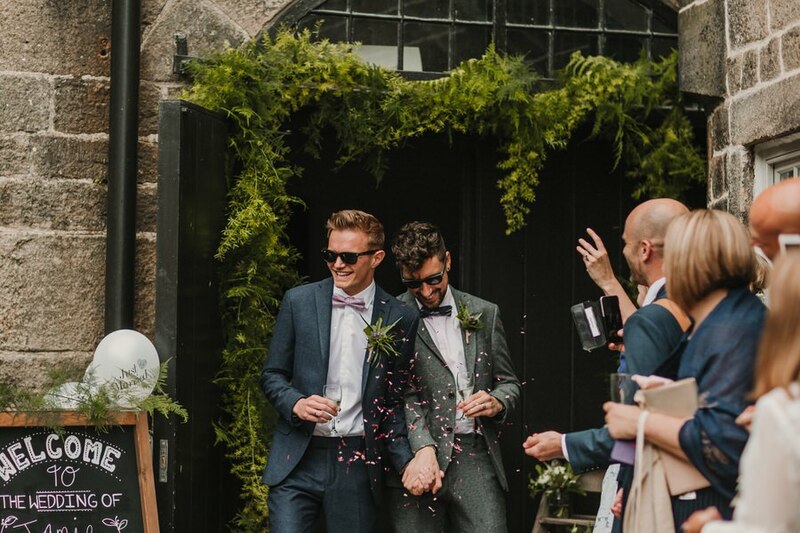 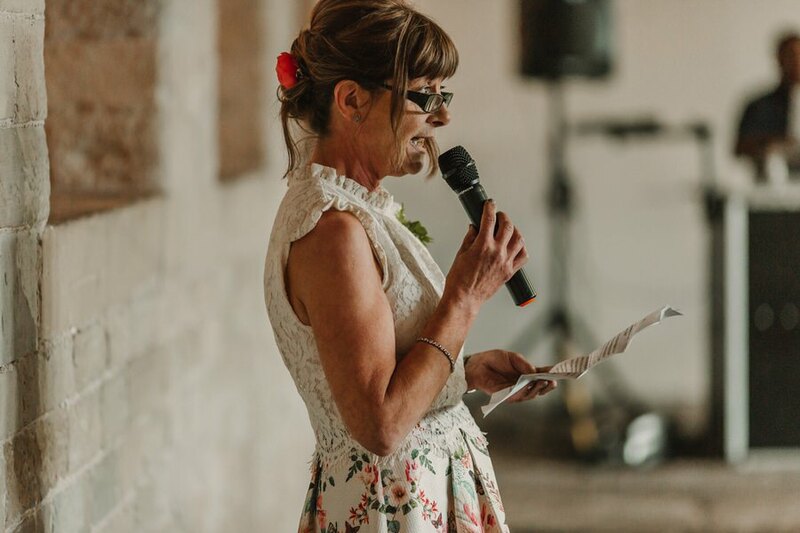 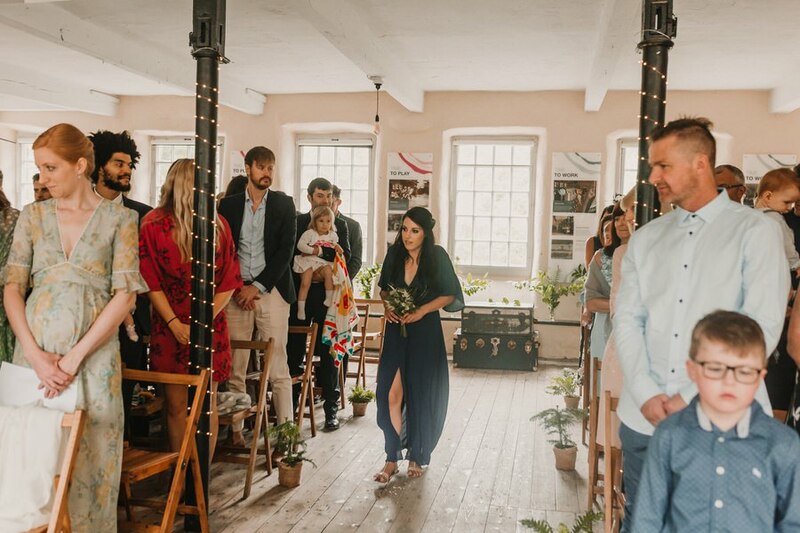 The Hebden Bridge florist also made the hanging backdrop behind us for the ceremony with everything we wanted – succulents, moss, leaves on pegs; a really great way to bring the outside, indoors, and the arched doorway to Gibson Mill. 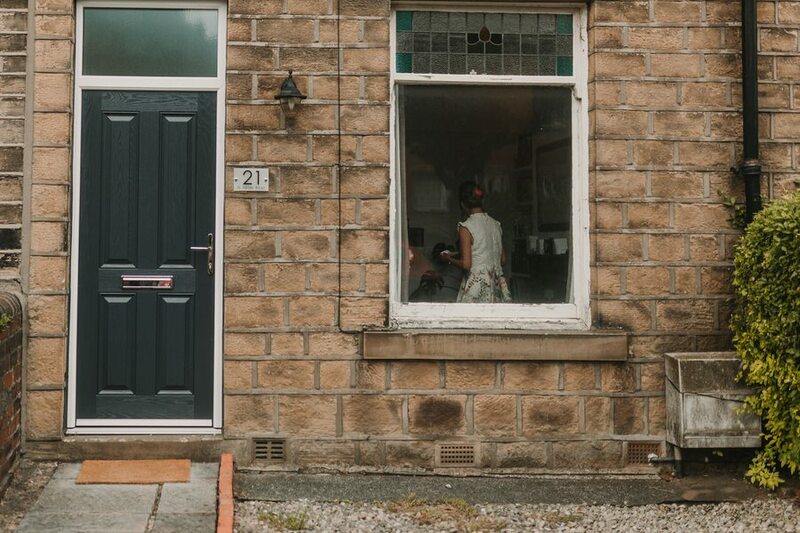 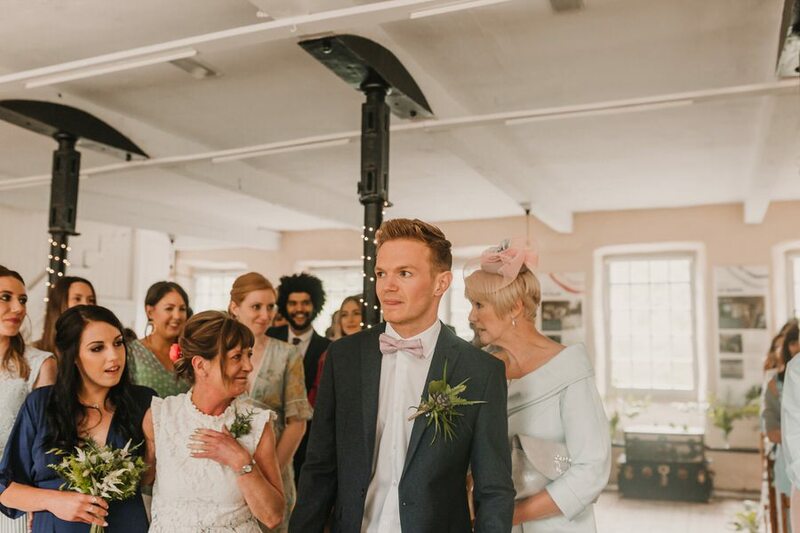 On the day, our bridesmaids – Rachel and Lucy (James’ sisters) and Amelia (my oldest niece) – went for hair and makeup at The Vinery in Huddersfield. 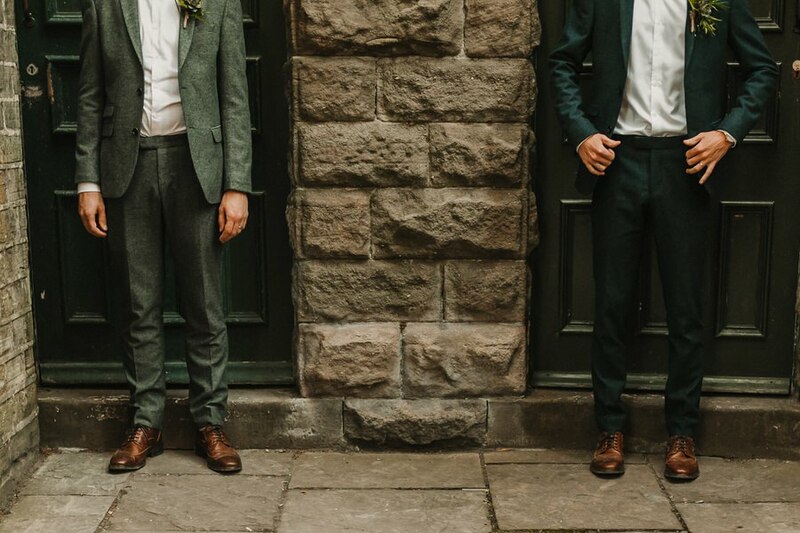 Together, James and I spent a little time with them, then got dressed for the day separately. 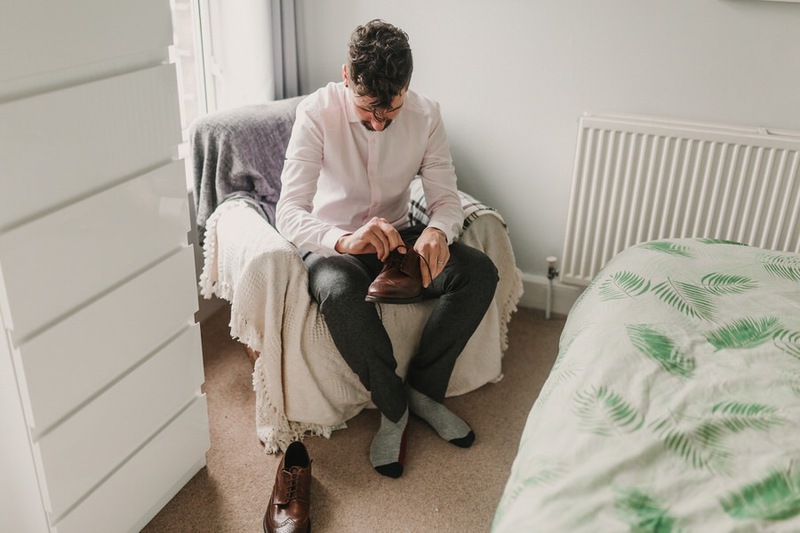 James got ready with his mum and sisters, and I had a great laugh with my friends and Best Women (Anastasia, Lucy and Alex). 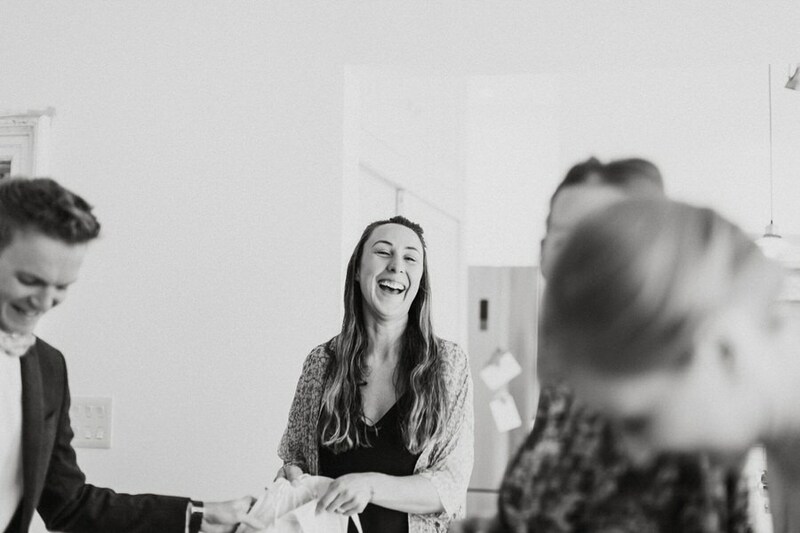 Lianne, our amazing photographer, arrived and the excitement quickly built. 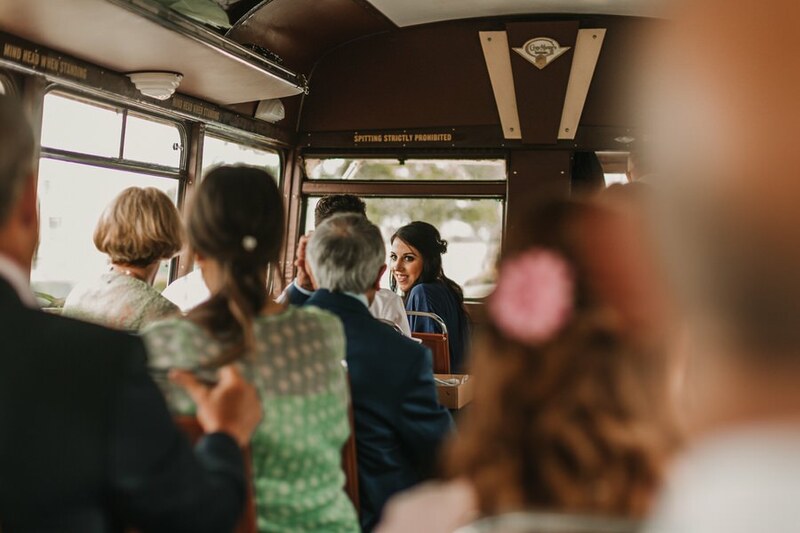 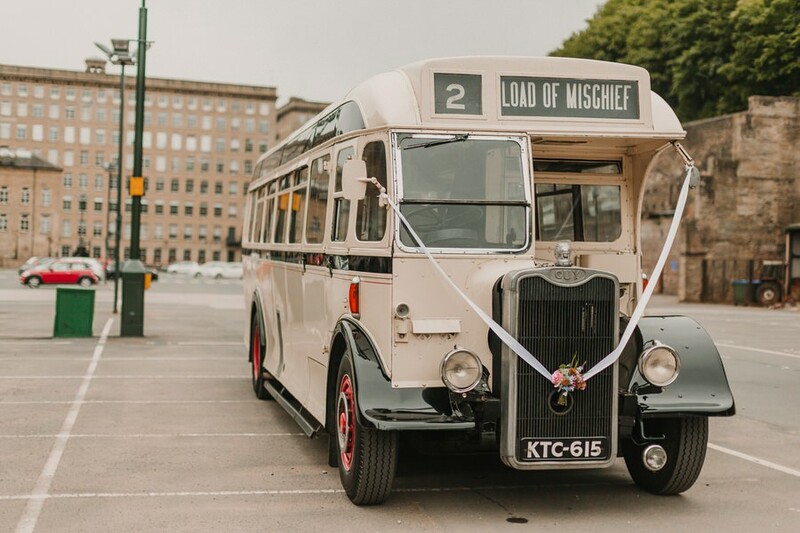 We hired an eye-catching bus from Yorkshire Heritage Bus for the wedding party and family. 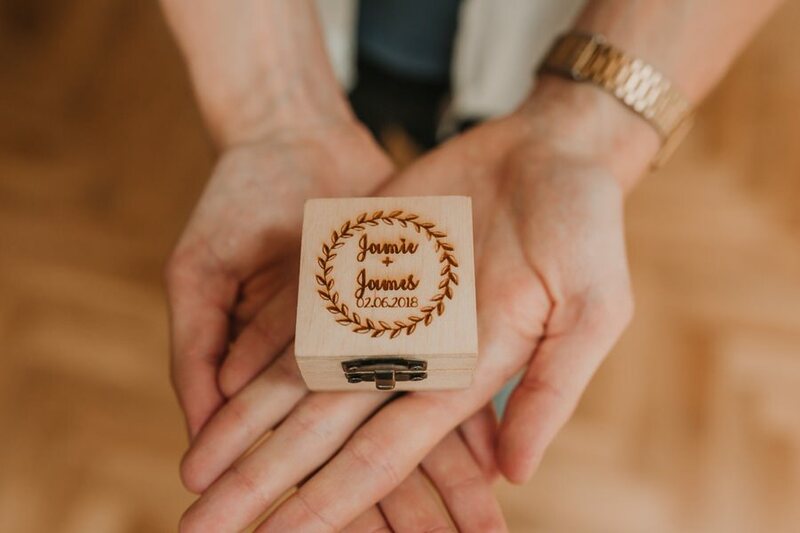 James and I travelled with everyone, which was really lovely – it distilled the stress of the big ‘first reveal’ and allowed us to hug our friends and chat all day long – not just from a certain time onwards. 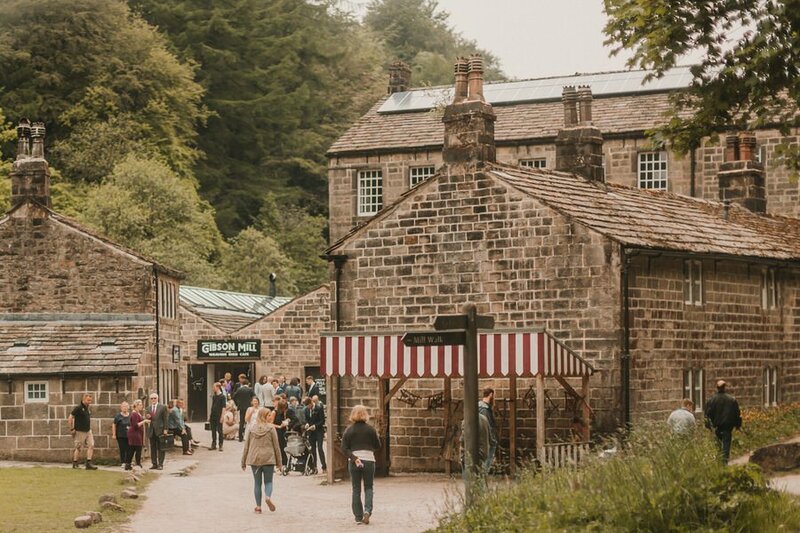 I cannot explain how gorgeous Gibson Mill is, nor can I begin to detail just how remote it is (built in 1800, it is a mile from the nearest carpark). 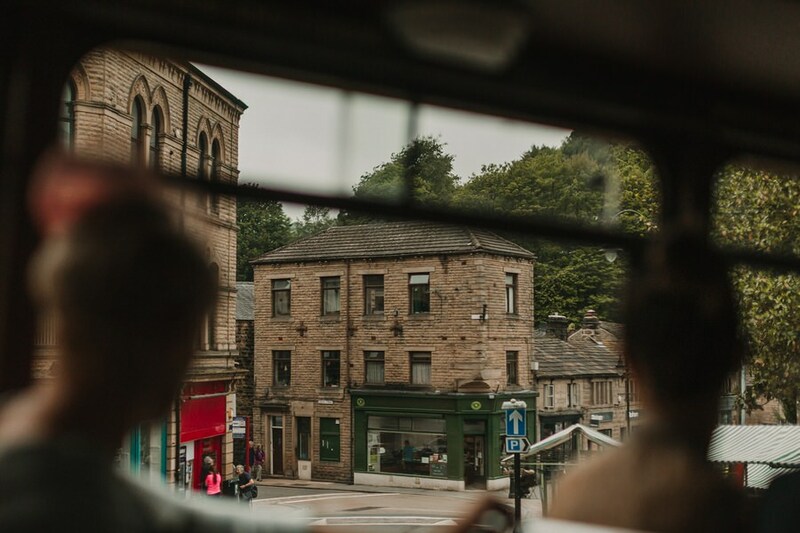 For that reason, we hired four minibuses from local schools to transport all our guests for the day. 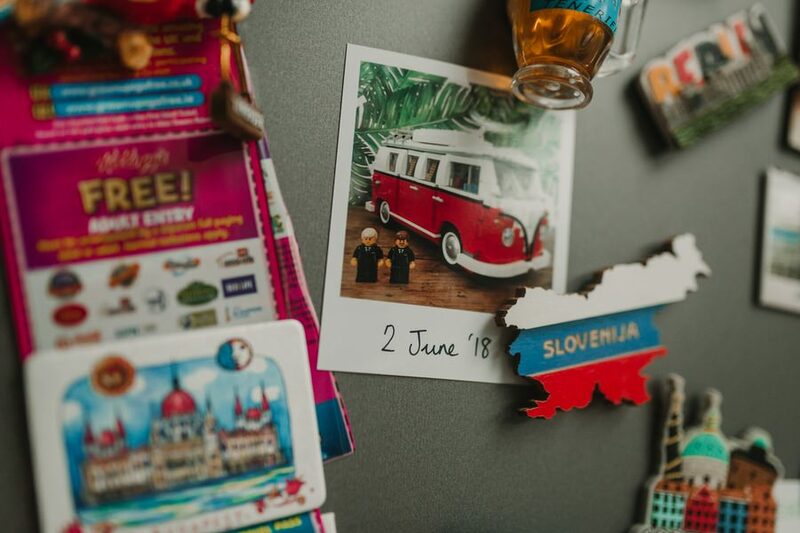 Each bus was themed after a city we have visited and, from reports, some of the buses sure knew how to party! 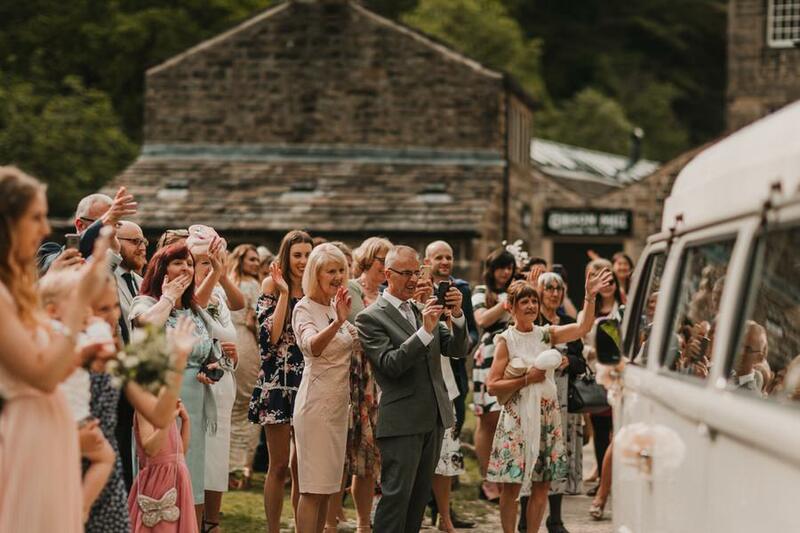 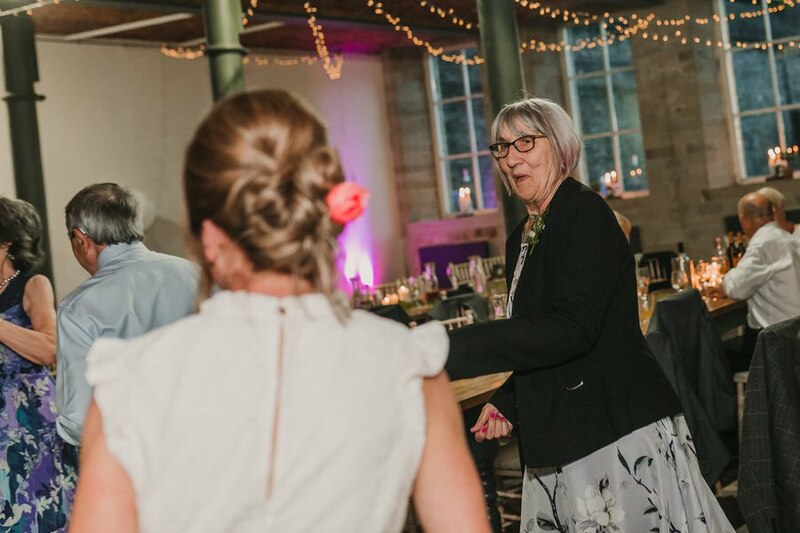 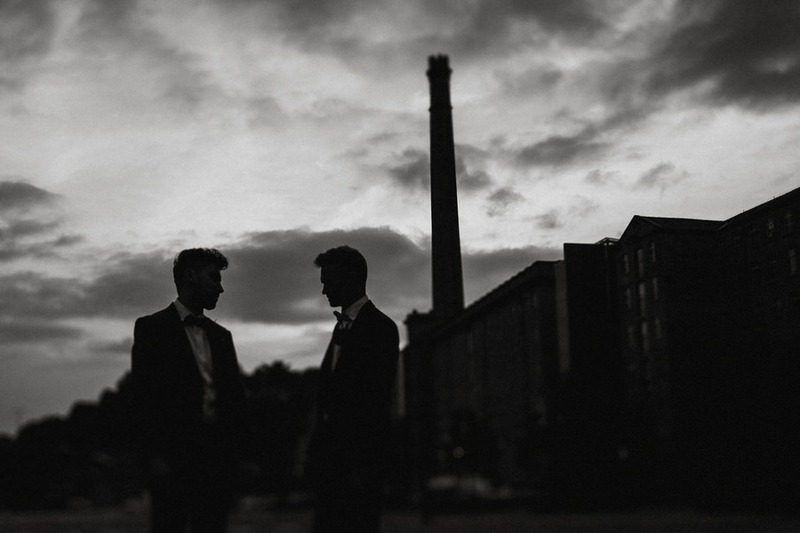 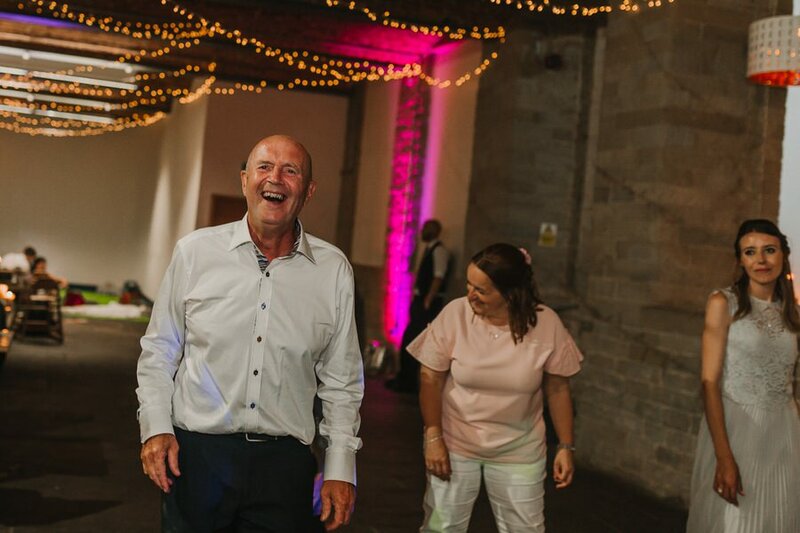 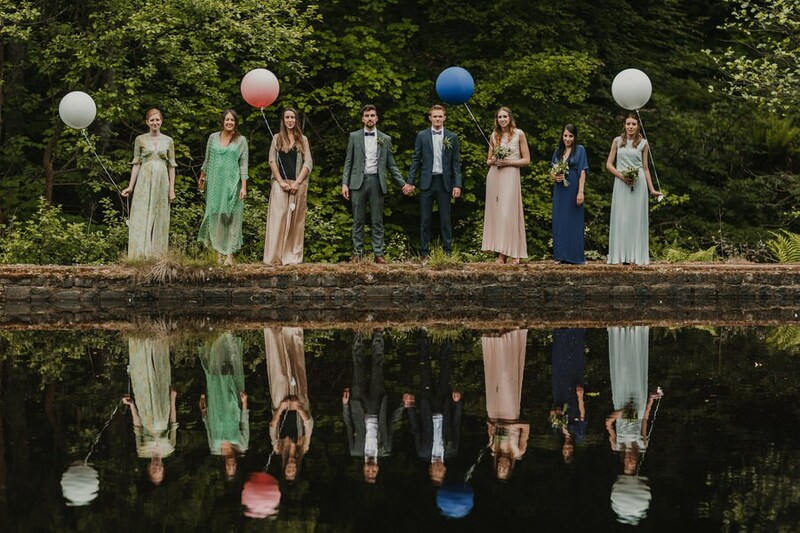 Guests enjoyed arrival and pre-ceremony drinks at Gibson Mill before we said our ‘I Dos’. 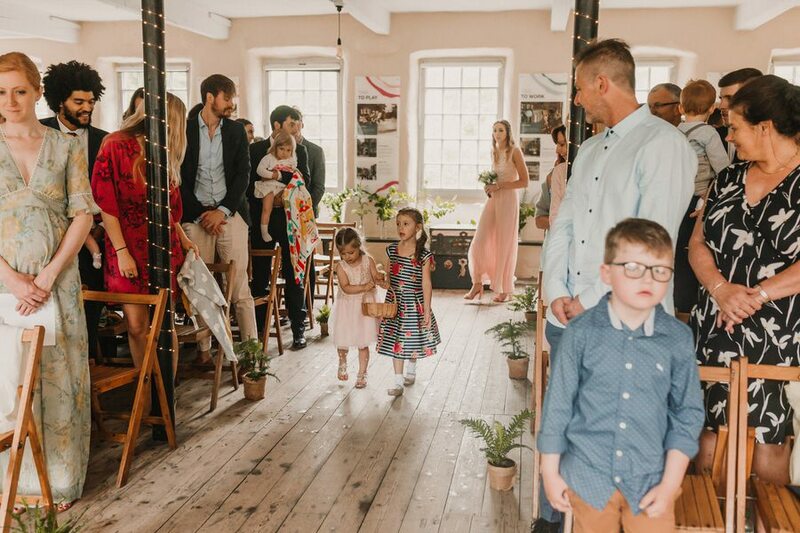 We recruited some family and friends to help us decorate the room the day before and it looked beautiful. 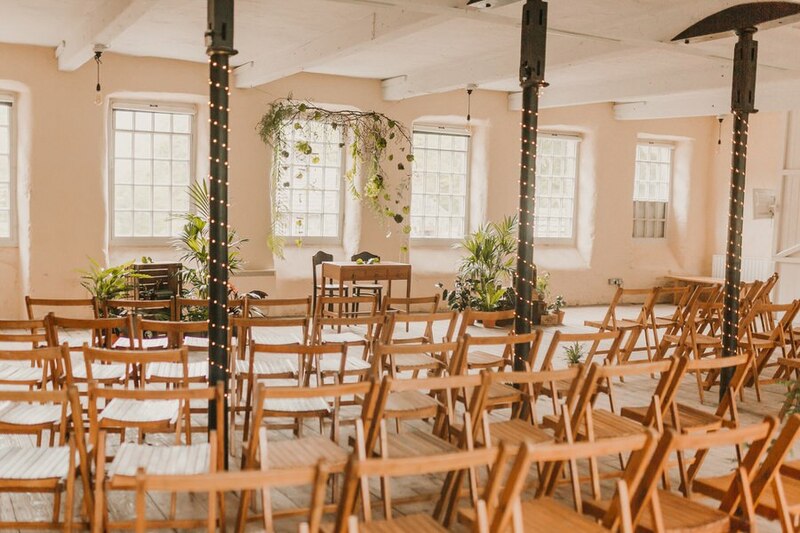 We hired rustic chairs from All Things Borrowed and decorated it with fairy lights, plants and objects we had found at local antiques shops. 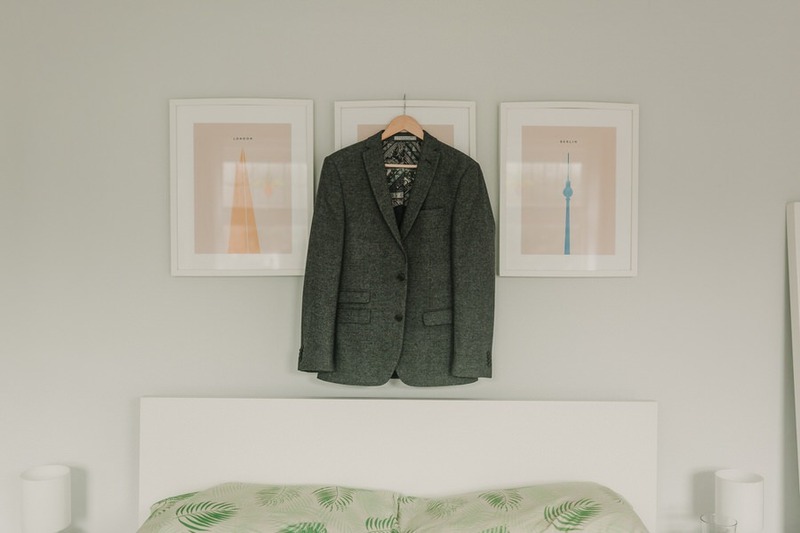 The vision for the room was for it to be masculine – greens, dark wood, vintage – and I think we accomplished that. 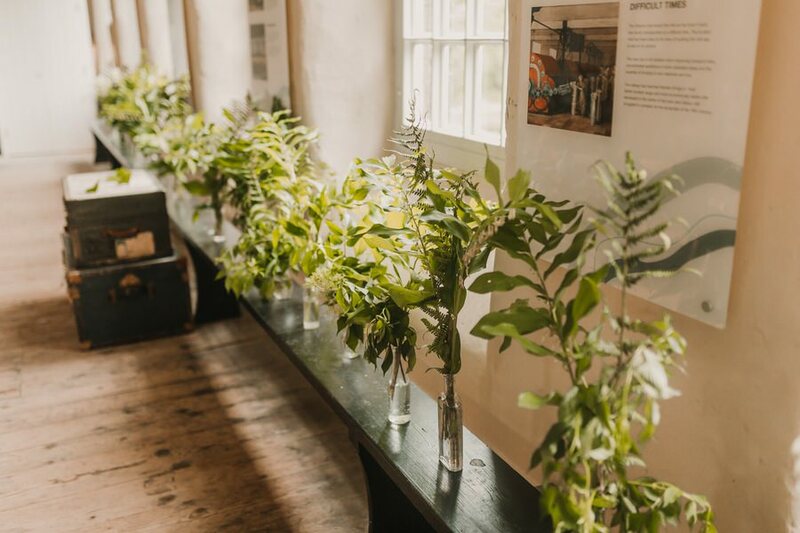 Stems and leaves ran along the back of the room with some vintage luggage stacks, ferns drew your eye down the aisle to an antique desk with two large arrangements of plants at either side (which are all now all fighting for space in our reasonably small terraced house!). 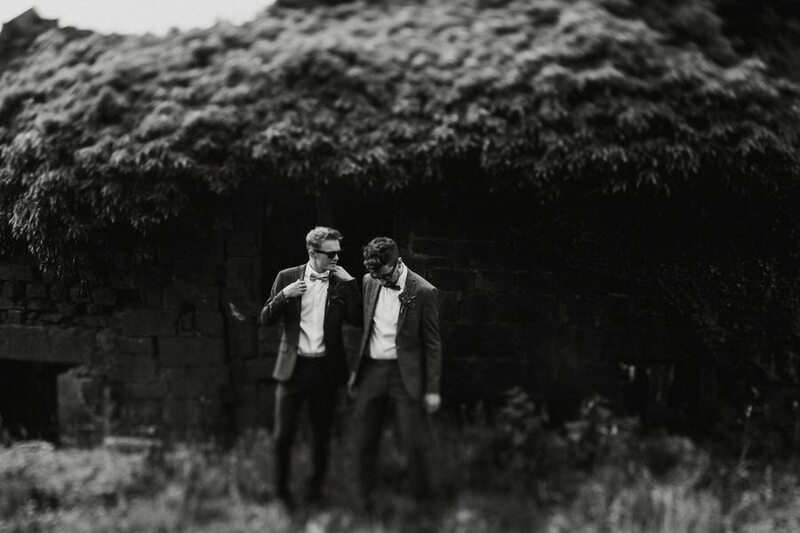 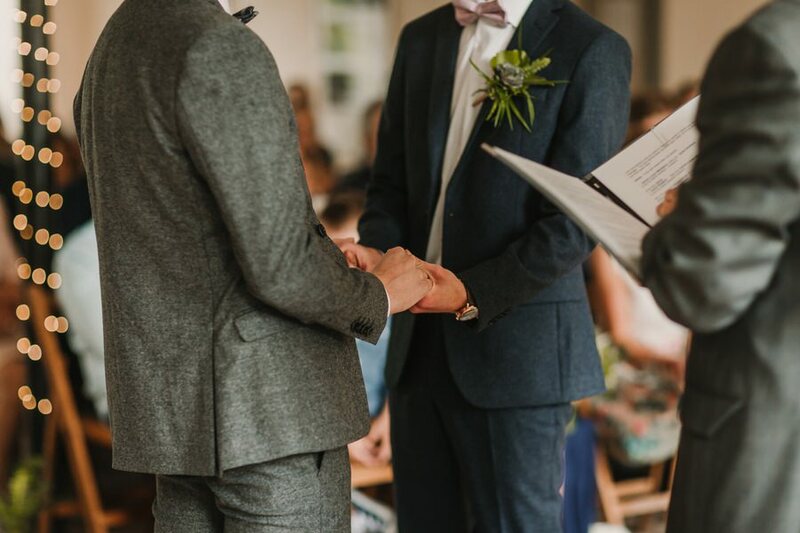 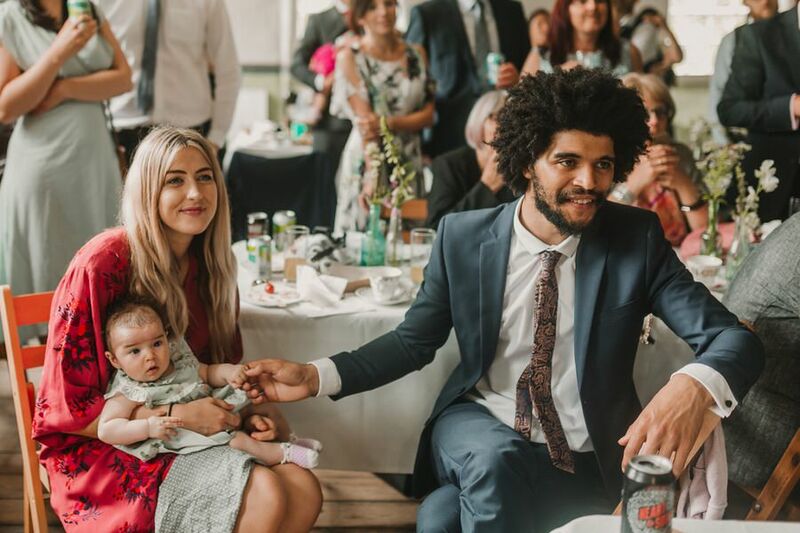 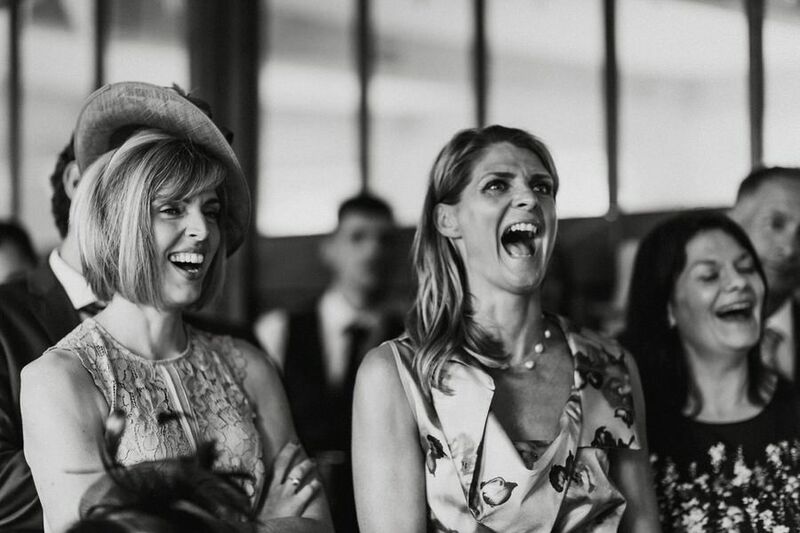 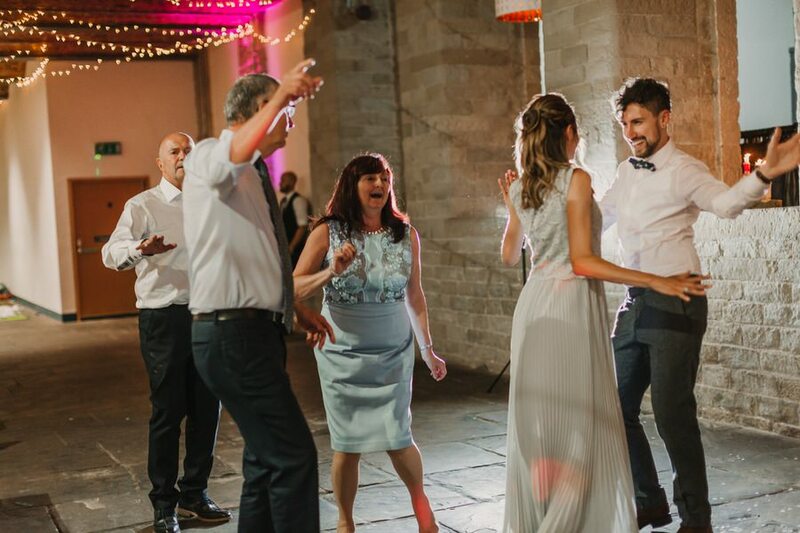 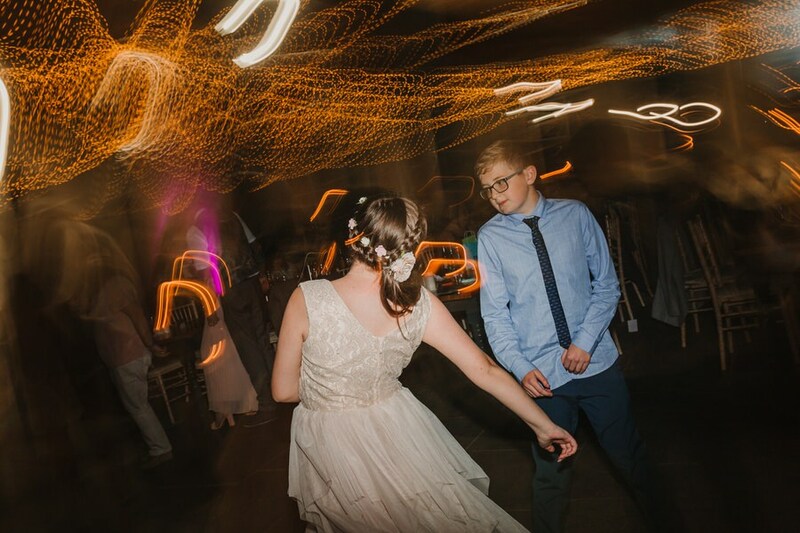 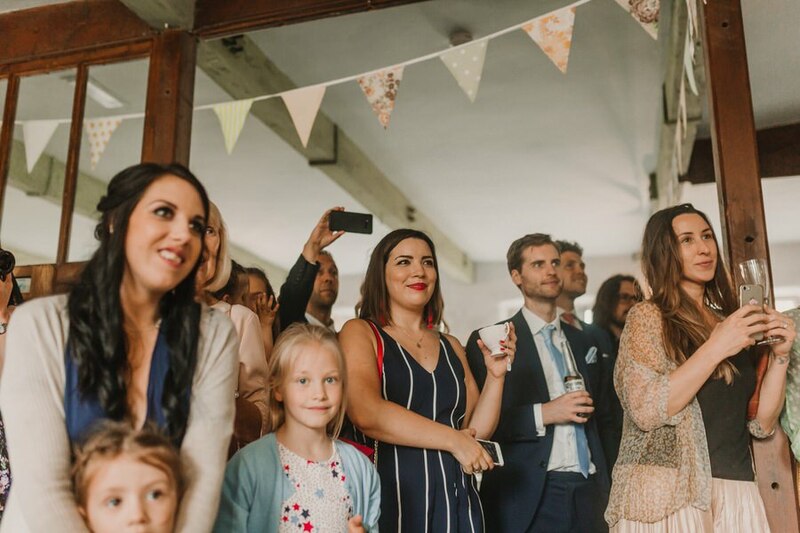 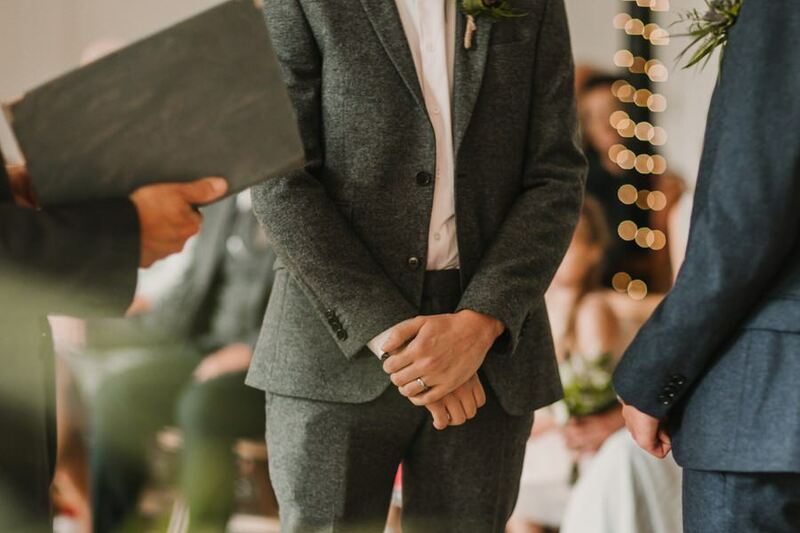 We spent a long time choosing ceremony music but eventually settled on four songs that both fit the venue and meant a lot to us – from Yeah Yeah Yeahs’ ‘Hysteric’ to Jessie Ware and Kishi Bashi. 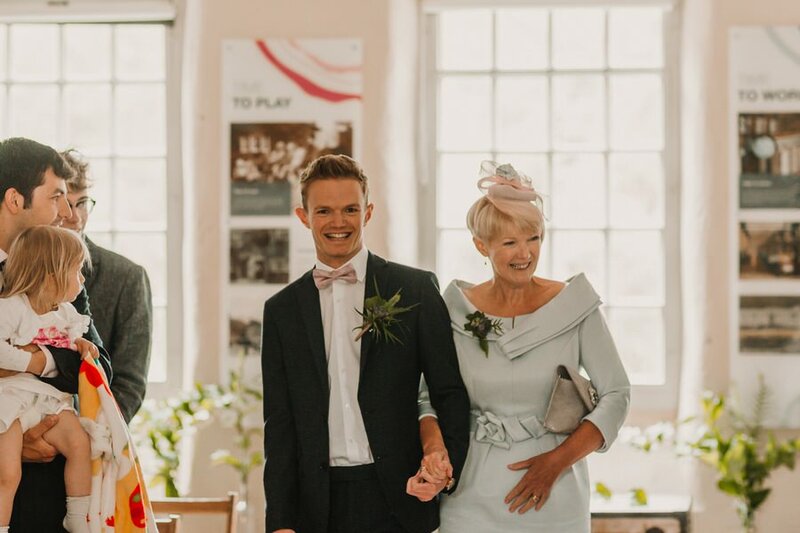 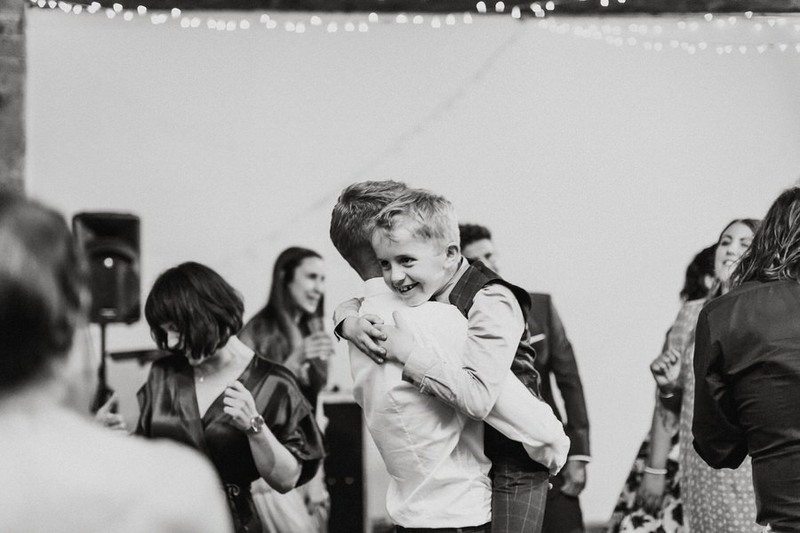 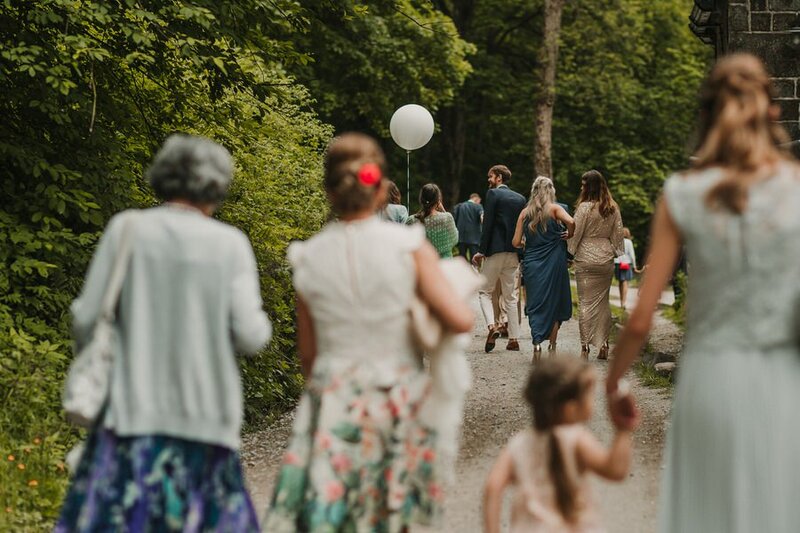 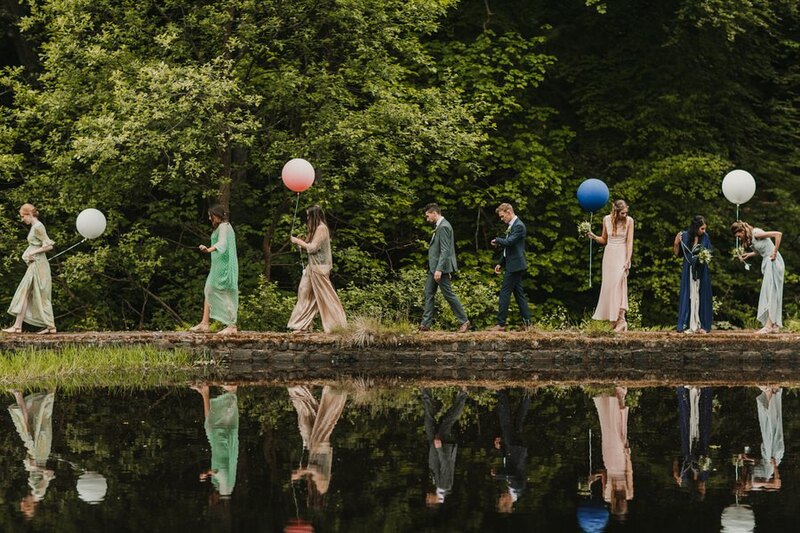 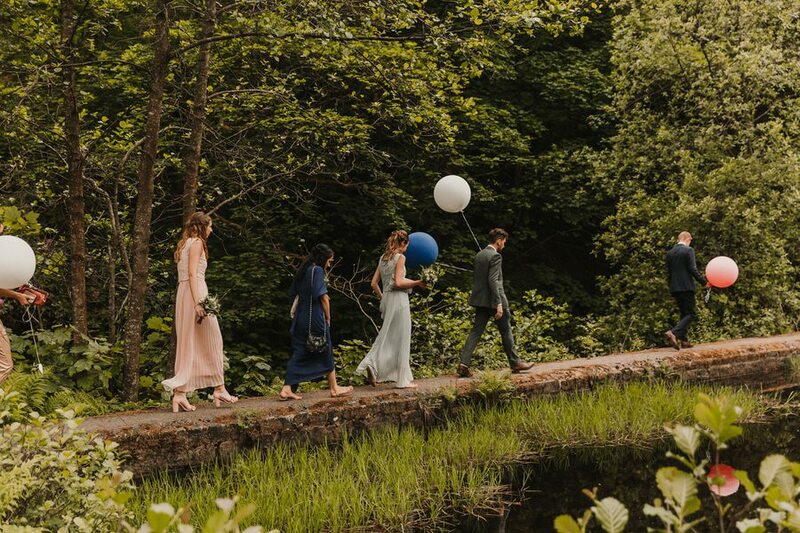 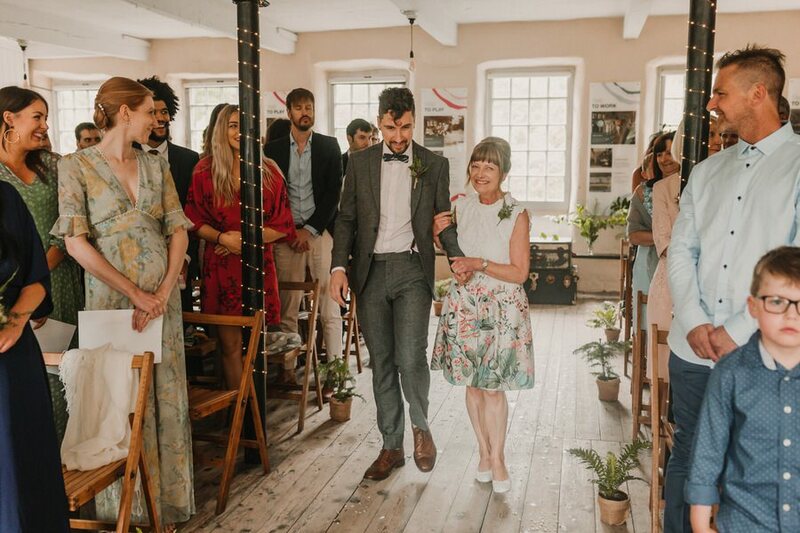 We walked down the aisle to Alt-J’s ‘Warm Foothills’ (key lyric: “I’d tie my life to your balloon and let it go”) with our mums and there was not a dry eye in the mill. 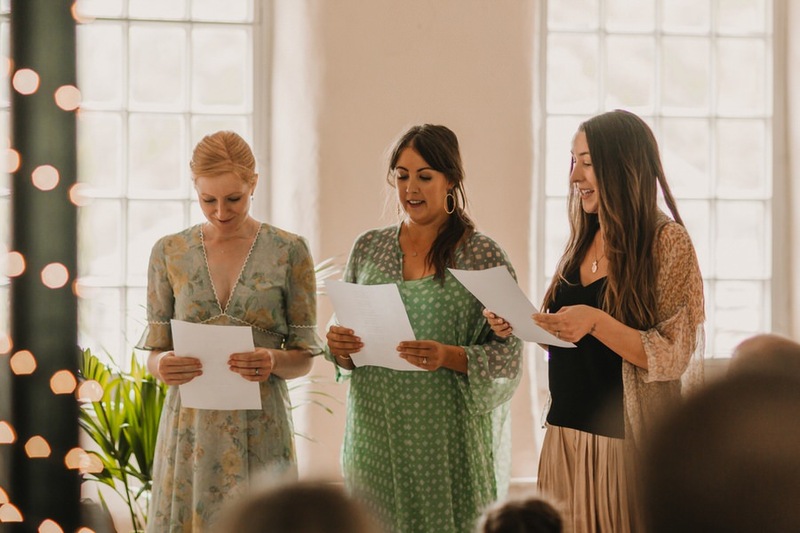 Our Best Ladies wrote a cute poem for us, my sister tearfully read The White Stripes’ ‘Dead Leaves And The Dirty Ground’ and James’ granddad Jim chose ‘My Delight and Thy Delight’ by Robert Bridges. 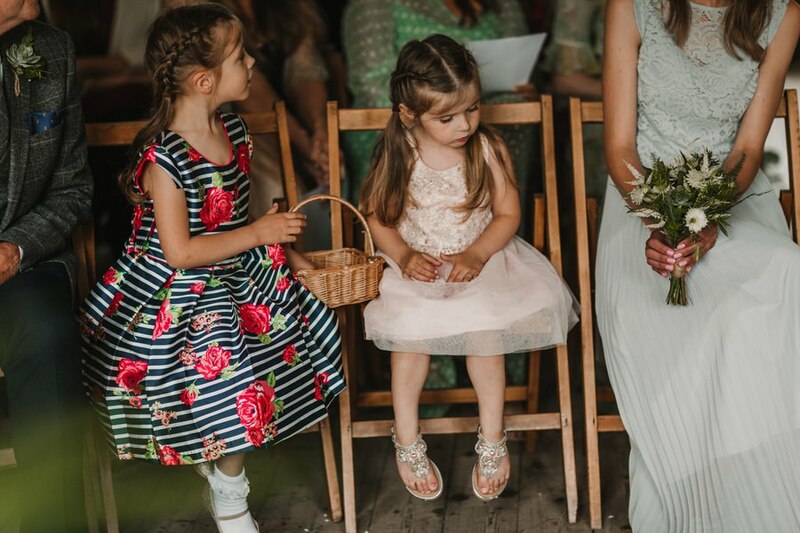 We asked our four nieces (Abigail, Freya, Lily and Emily) to be flower girls and our three nephews (Ben, Josh and Dylan) supplied the rose gold and platinum rings – including a fake Haribo moment! 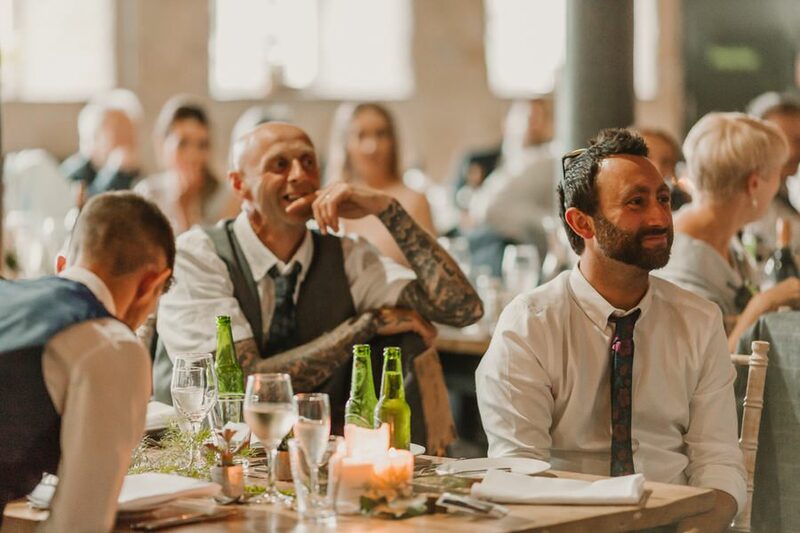 More drinks followed the ceremony (shout out to local brewery Vocation) as well as photographs. 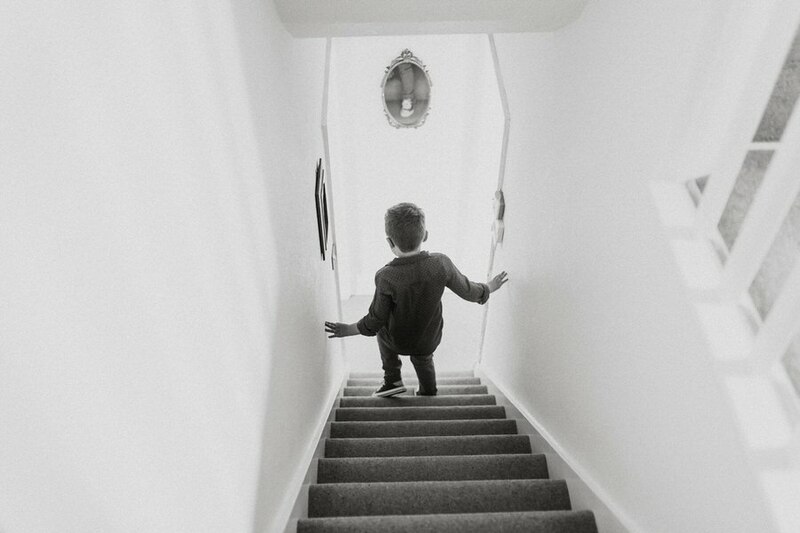 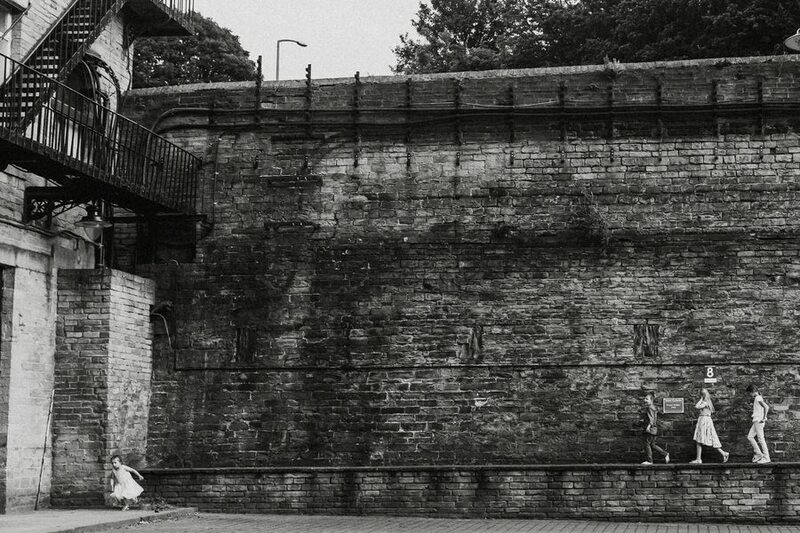 Lianne has a great eye for locations to capture the perfect shots. 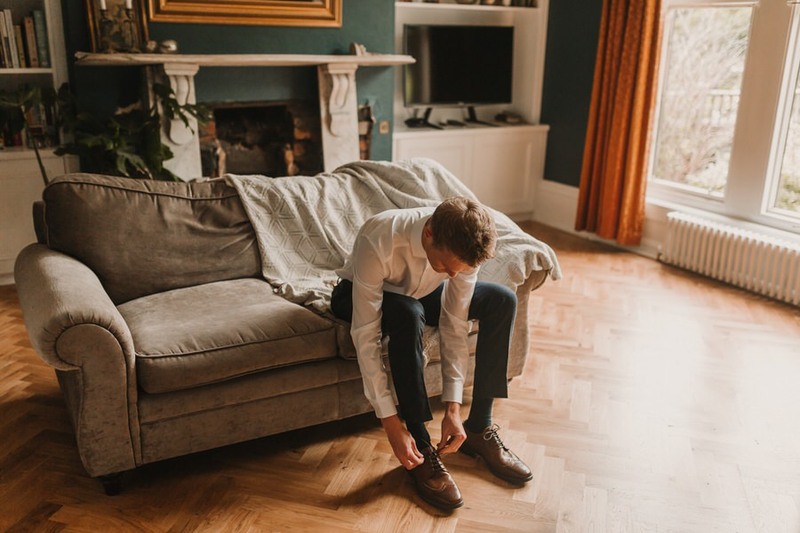 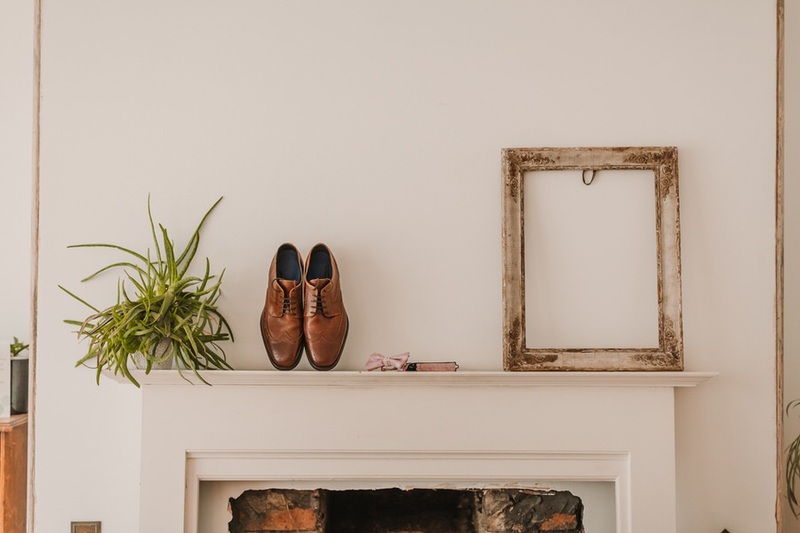 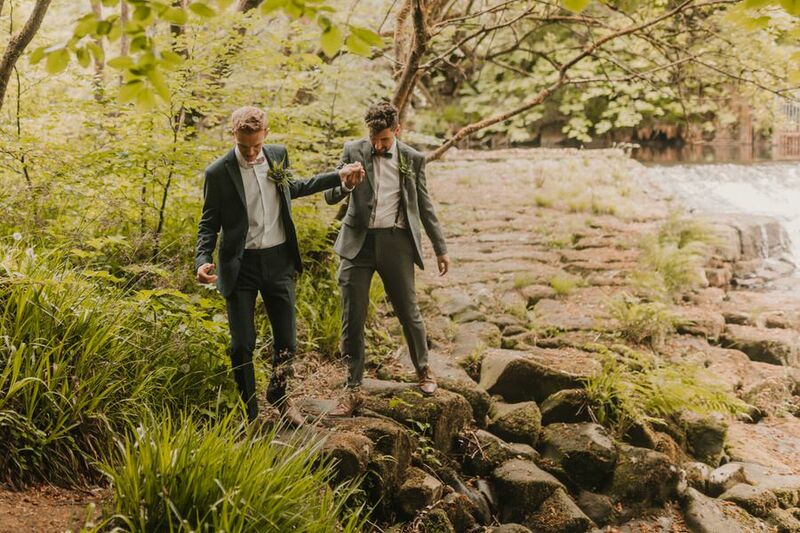 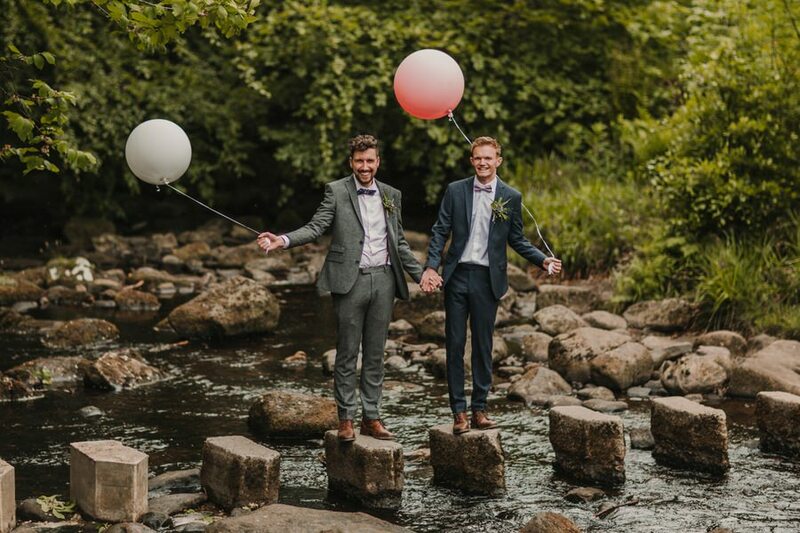 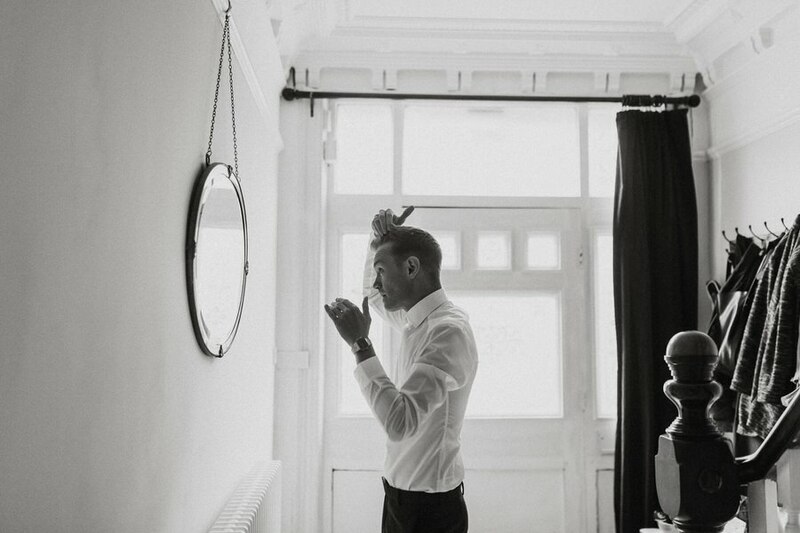 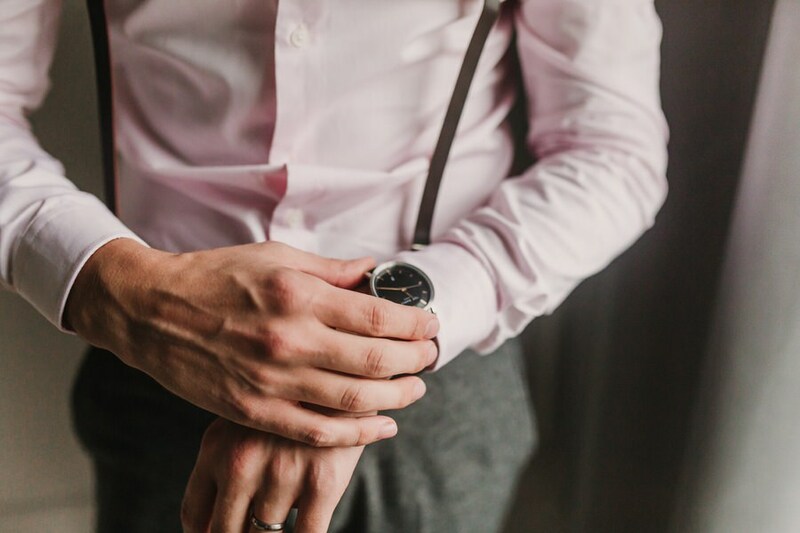 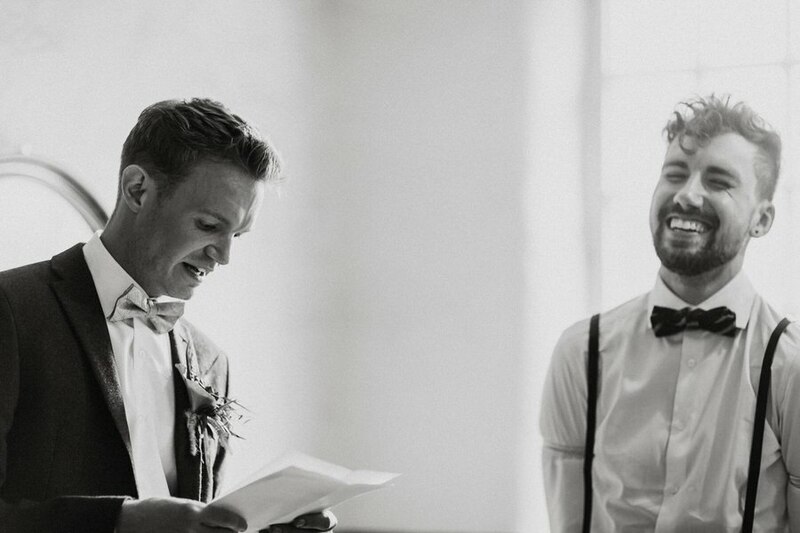 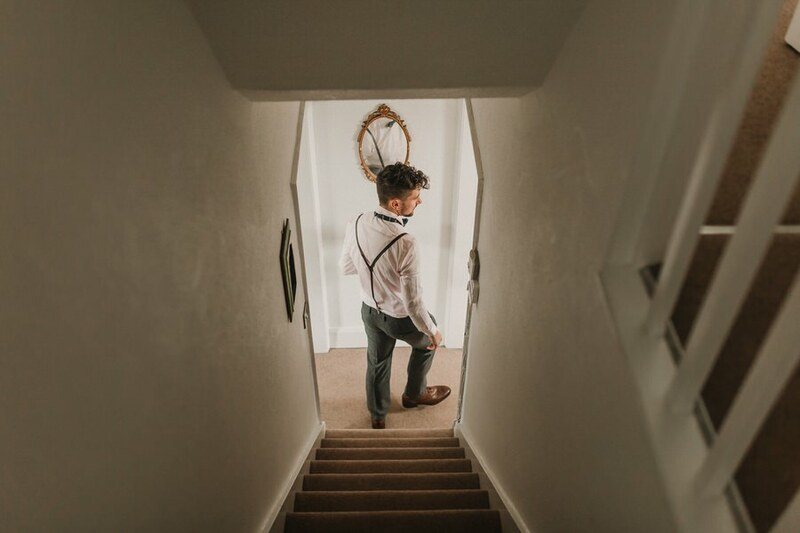 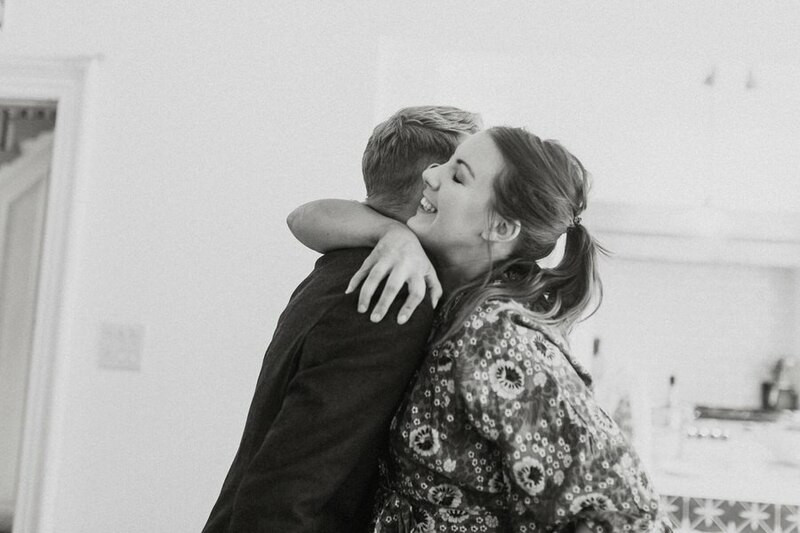 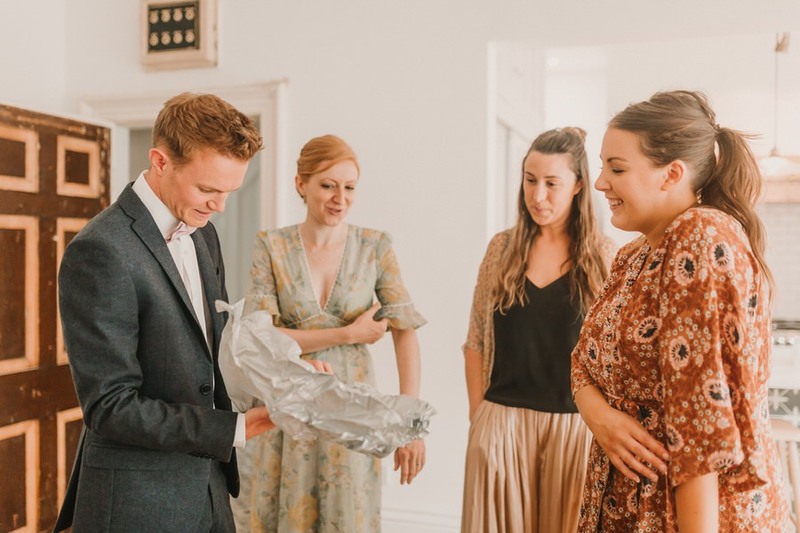 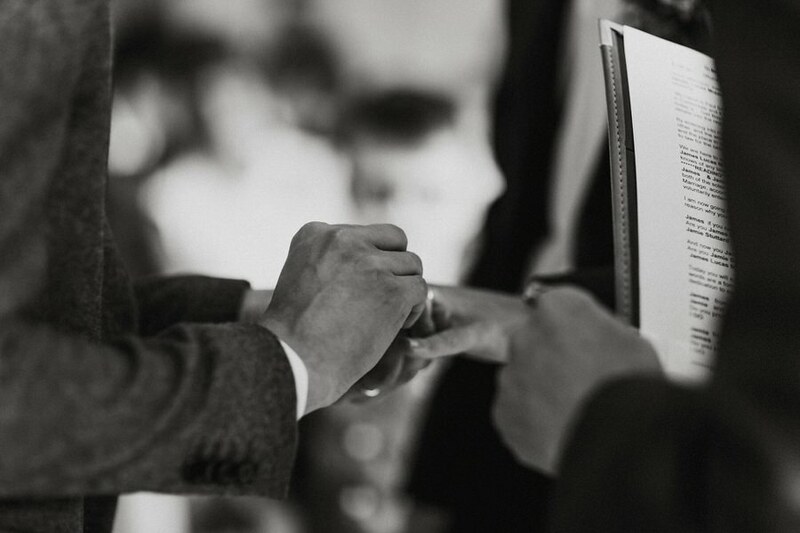 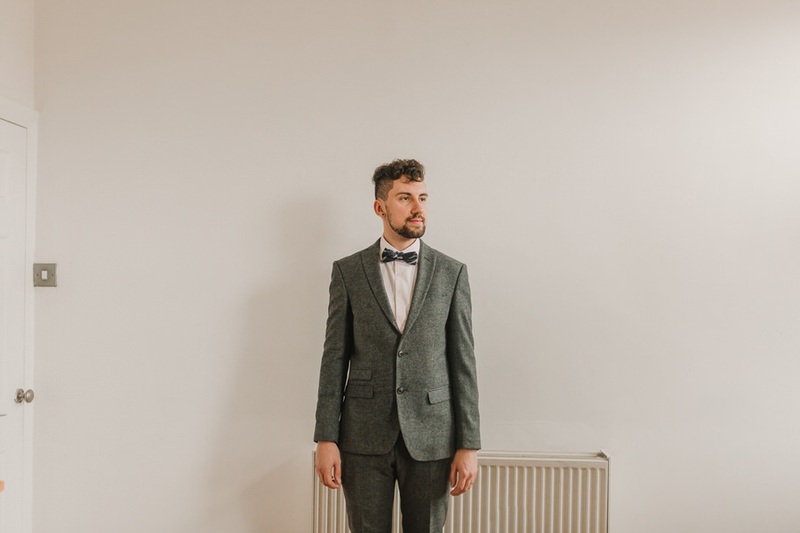 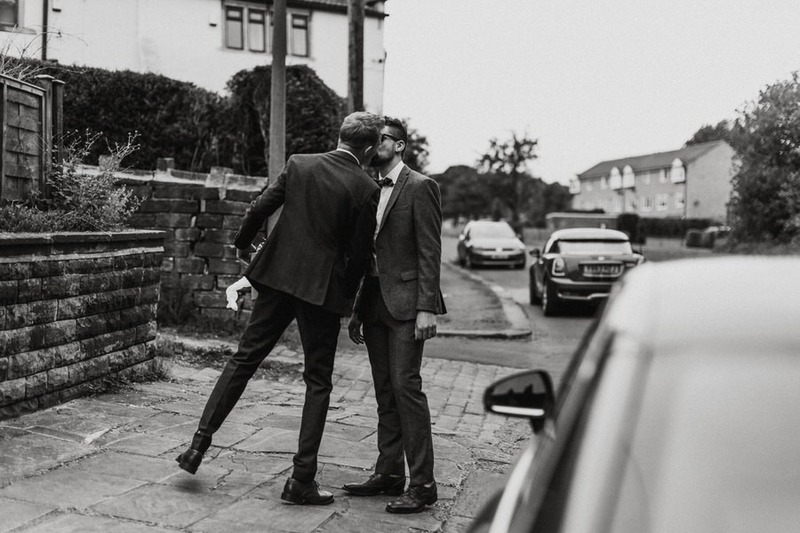 We had already visited the venue with her a few weeks before so a plan of action had been formed (who can say no to a stepping stone moment – even in a wedding suit!). 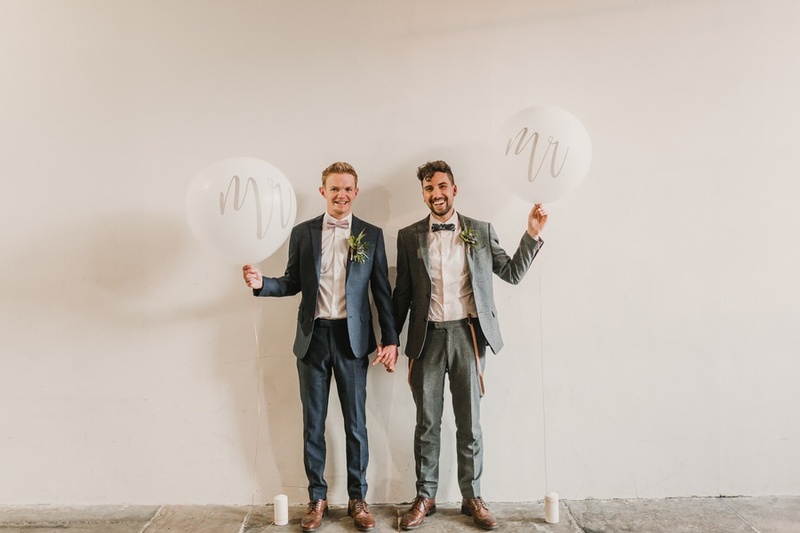 I have always been weirdly obsessed with helium balloons so I knew I wanted them prominent in some photos. 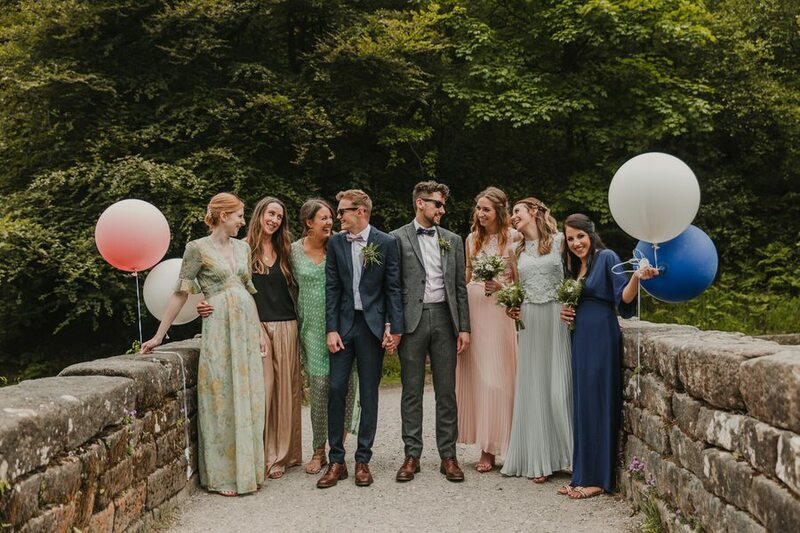 I love how they add height and interest to some of the group shots. 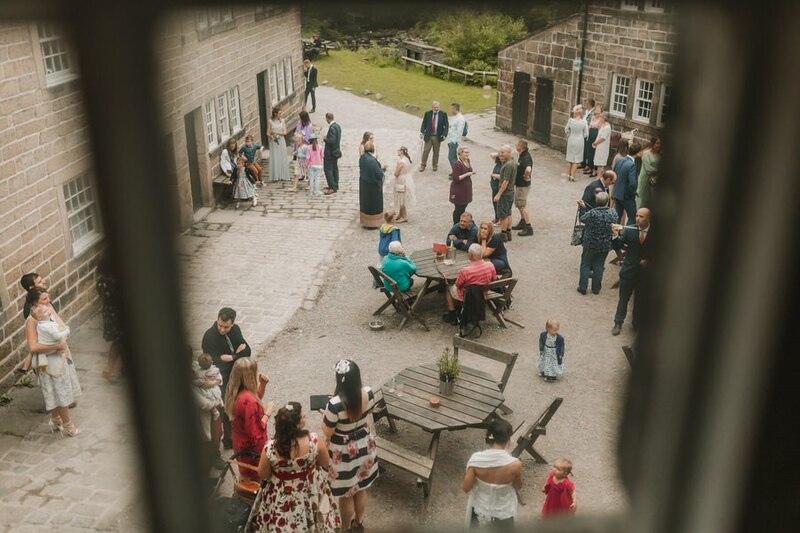 Gibson Mill roped off a large section outdoors for guests, more balloons, drinks and a bubble machine, which was a hit with the children. 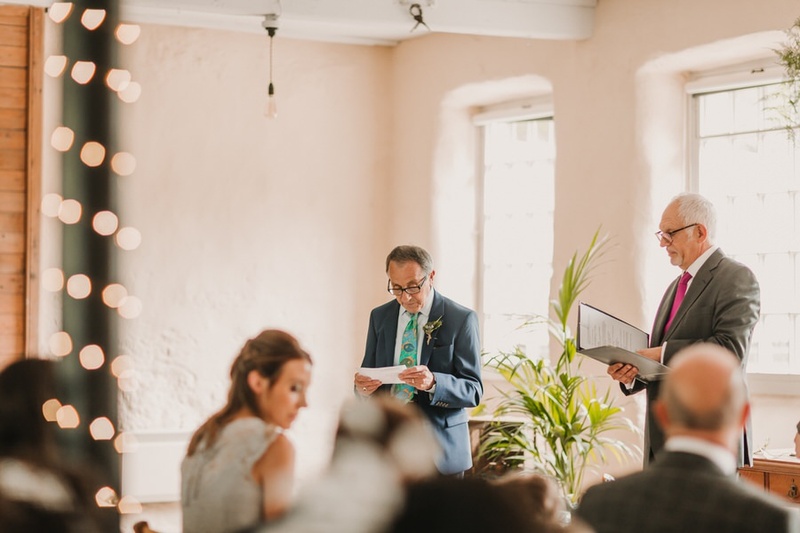 Next, we gave speeches and started Afternoon Tea by cutting our wedding cake, which was all supplied by The Han-Made Catering Co. 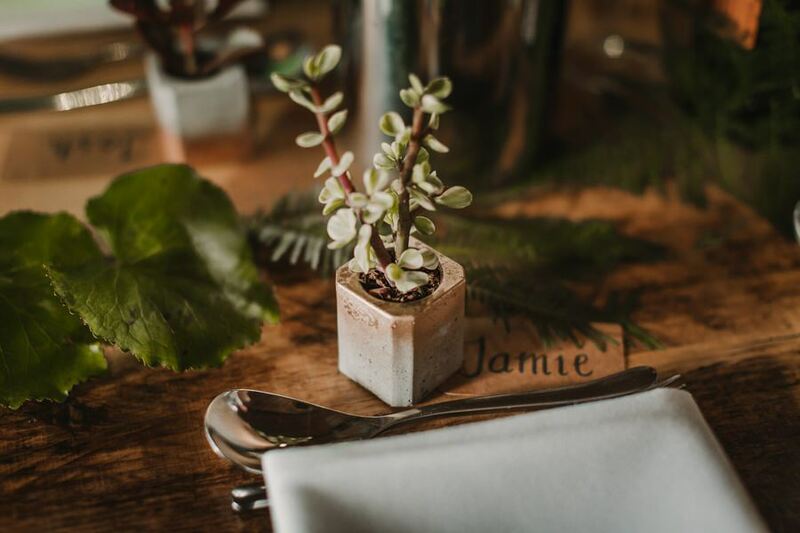 The semi-naked cake with succulents was a real talking point of the day, as was the buffet-style lunch, served on vintage crockery. 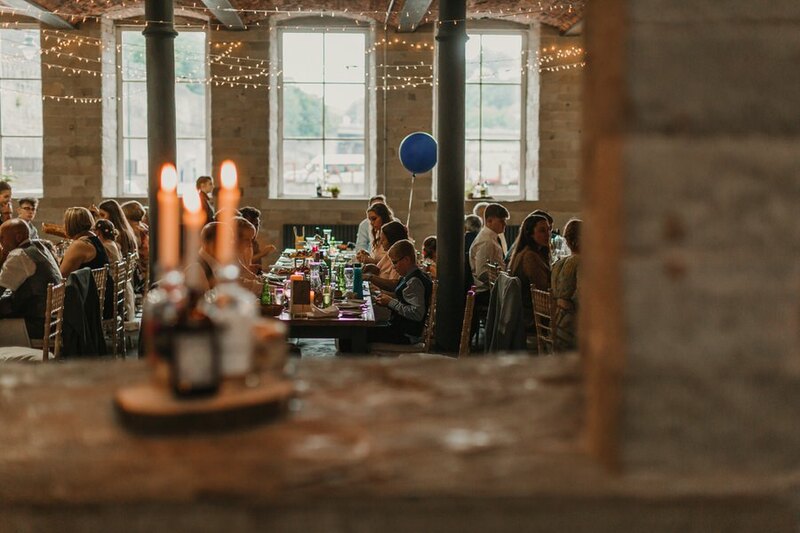 As a nod to Gibson Mill’s previous use as an entertainment emporium in the 1900s, we wanted this second room to have a quaint feel. 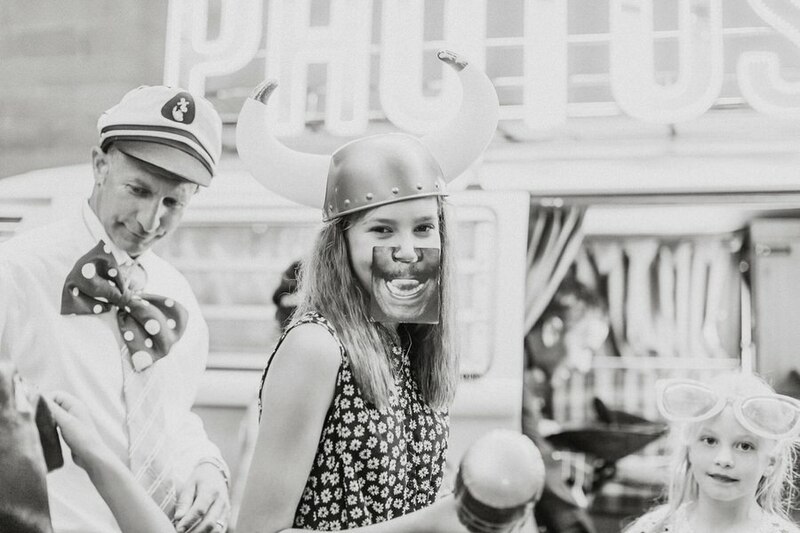 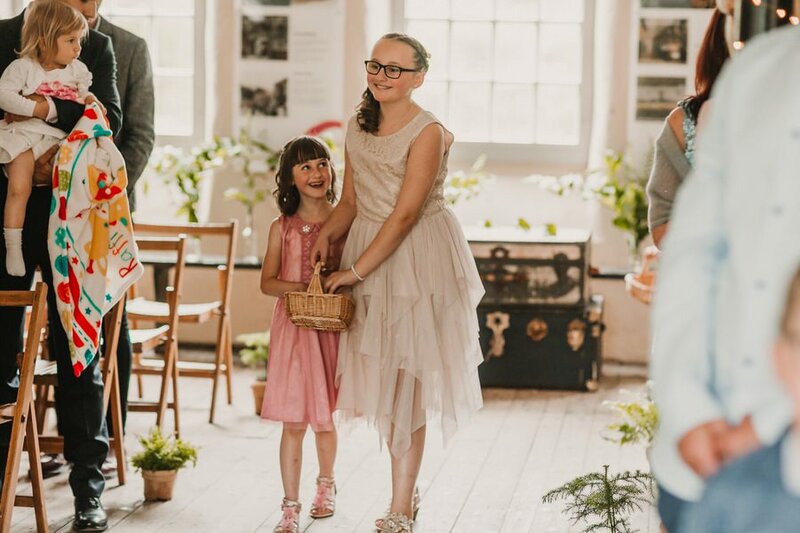 With a picnic-style, grass benched area, cute, decorated tables, dressing-up costumes and vintage games spread around the room, this was a lovely step back in time for our guests. 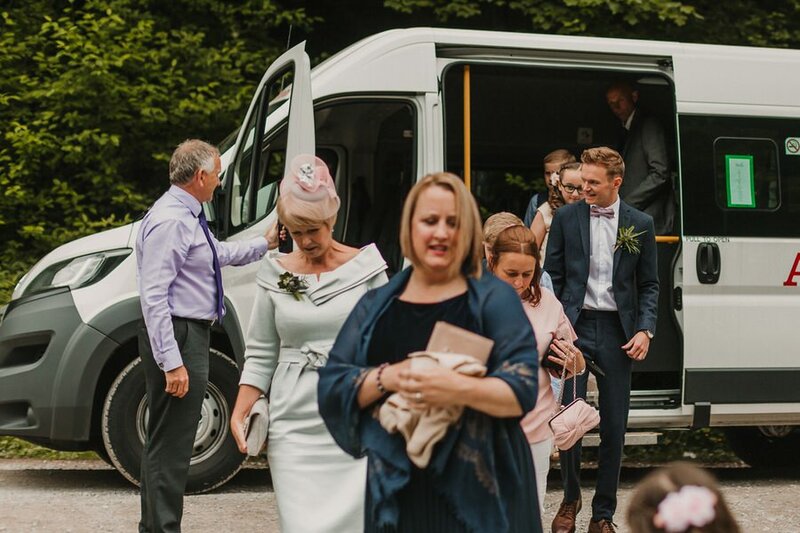 My parents surprised us on the day with our own transport to the evening venue from The Volkswagon Wedding Co. 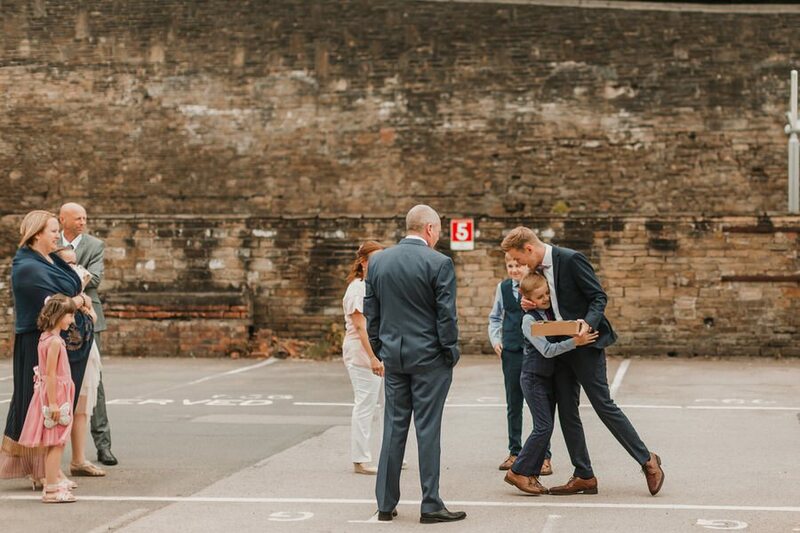 It gave us an opportunity to really breathe in the day, to spend some time together and, of course, to recreate our Save The Date Lego photoshoot! 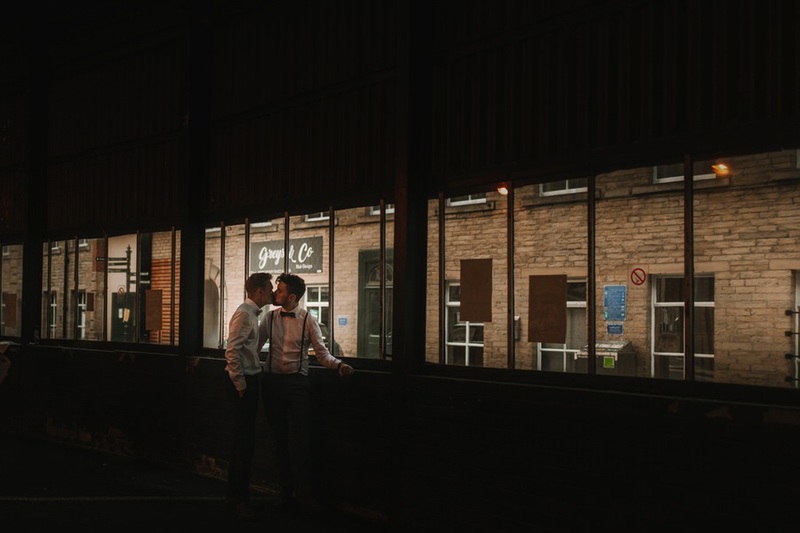 Our evening venue was the equally lovely Arches at Dean Clough Mill, Halifax. 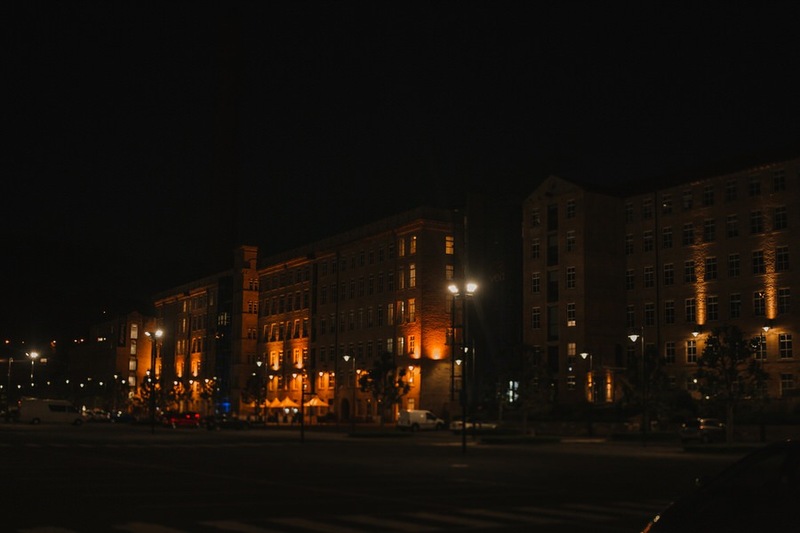 It is an impressive, industrial space with amazing, huge windows along one side. 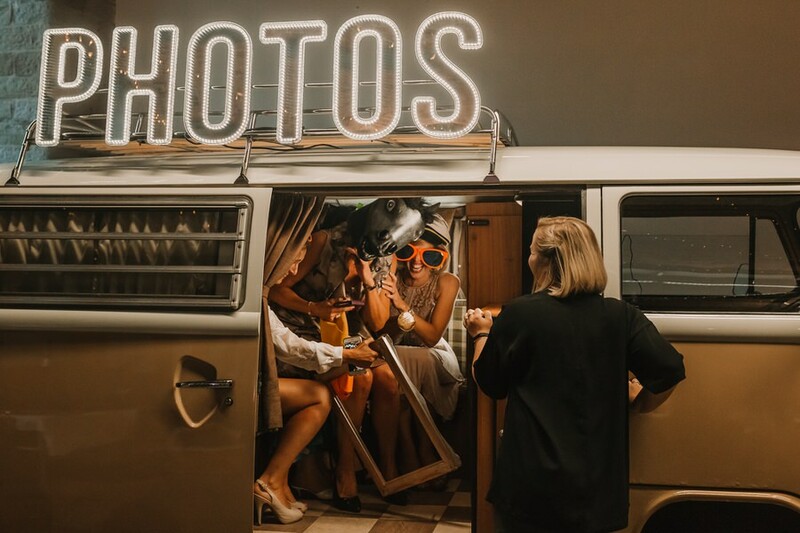 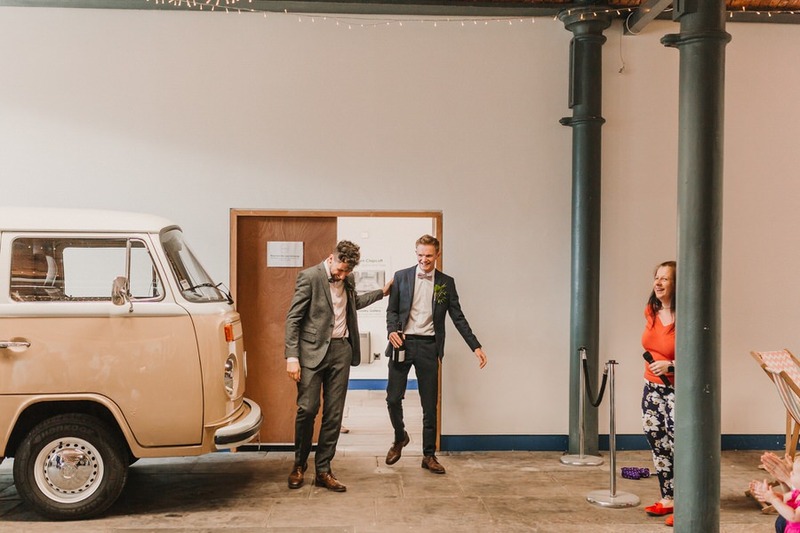 On arrival, we gave our guests time to explore the space – we had a photobooth (again from The Volkswagon Wedding Co.) and some games from Add Vintage, which went down a treat. 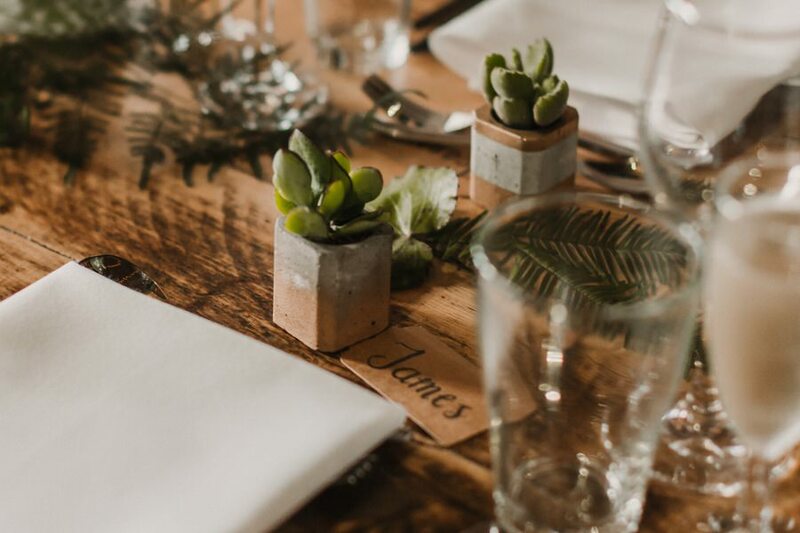 Add Vintage also supplied the amazing succulent favours and copper seating plan. 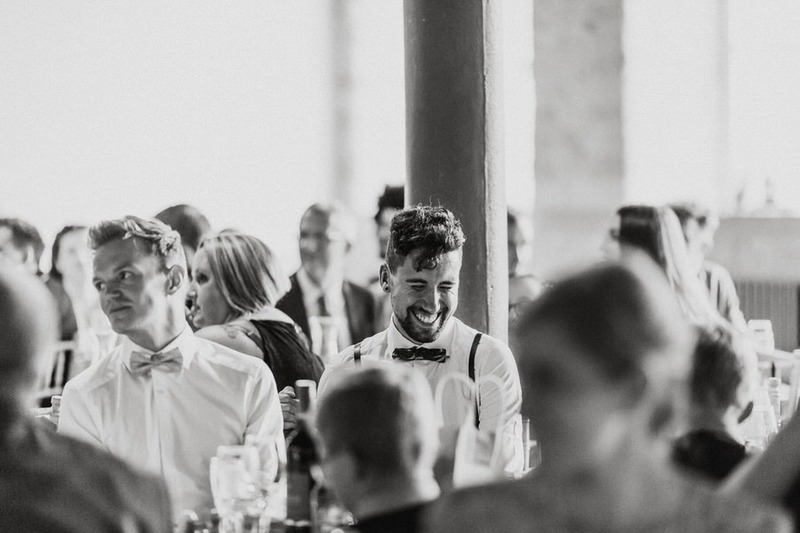 Each table was named after a number important to us (for example, Table 63 – the number of minutes it took us to break out an German-only escape room (we do not speak any German); Table 7845 – the length in metres of the Øresund Bridge (from the TV show ‘The Bridge’) and each had a little story and polaroid photo to accompany it. 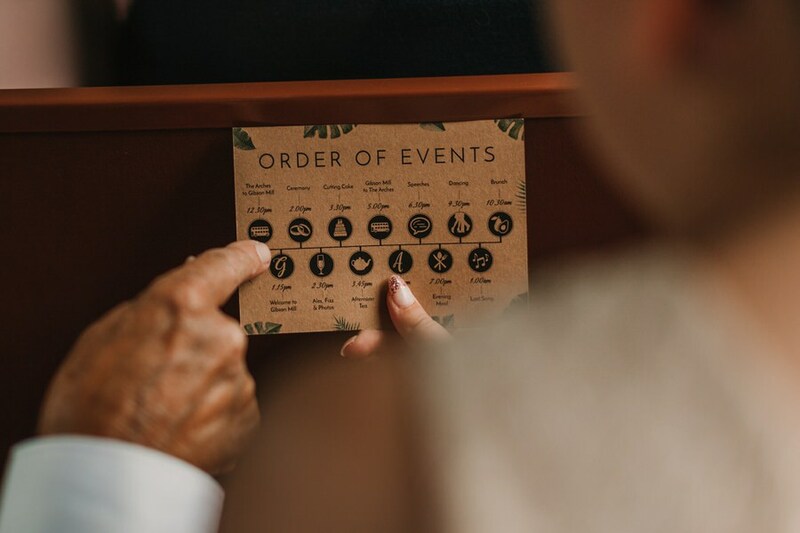 All of our stationery – invites, seating plan, order of ceremony, day plan – was wonderfully designed and supplied by Print Bureau in Hebden Bridge. 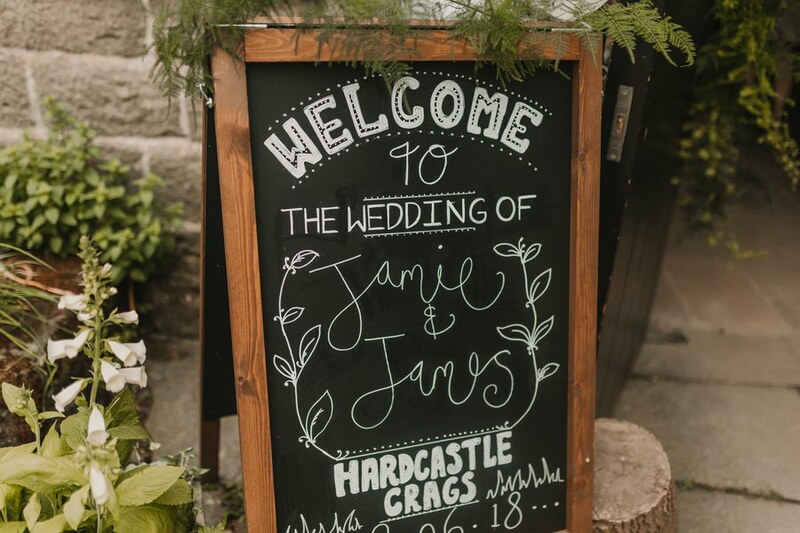 I taught myself some basic calligraphy to write place settings (thank you, YouTube tutorials!). 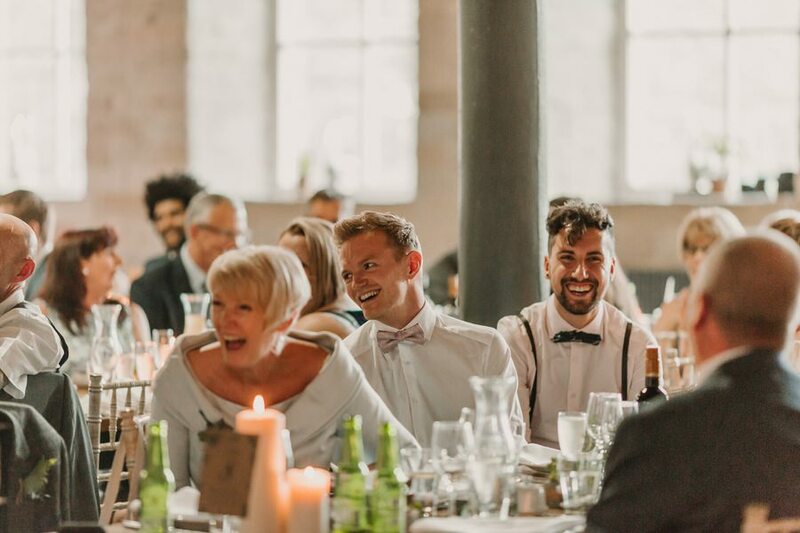 Following speeches (my dad and James’ mum), we ate on long, wooden tables. 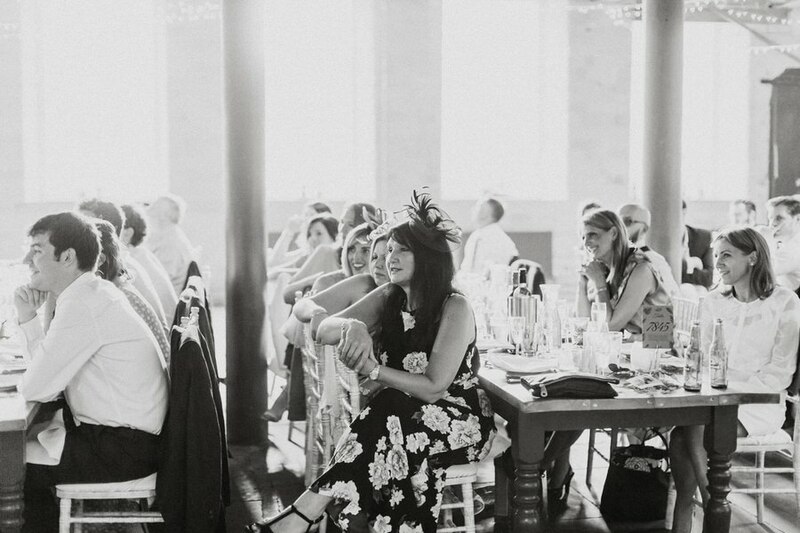 Preferring to be surrounded by those who love us, we chose not to have a traditional top table. 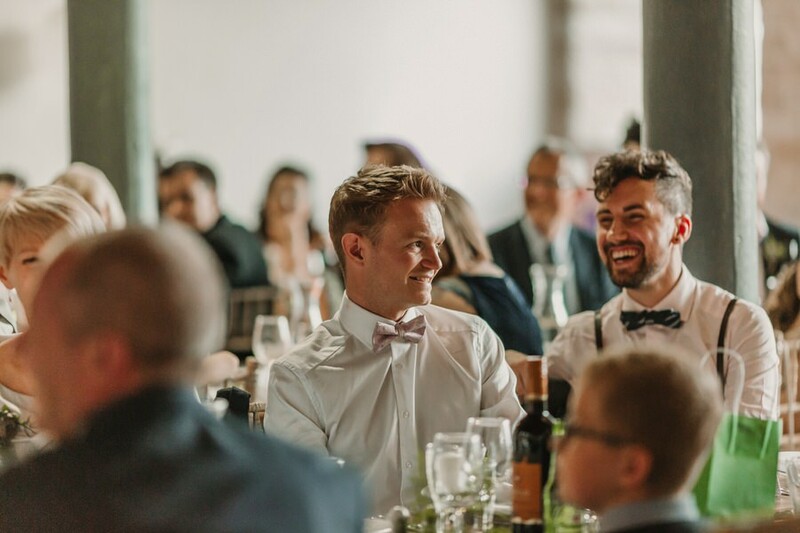 The food – catered by Eat Me, Drink Me – was delicious. 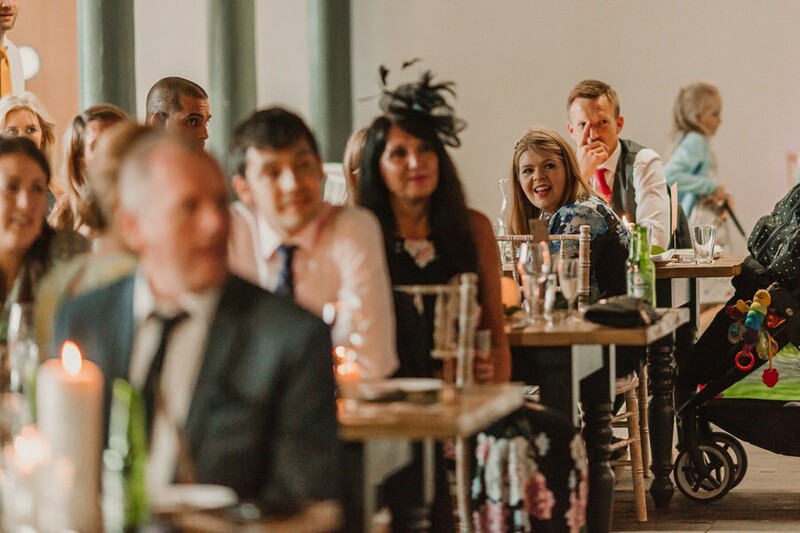 Our guests ate vegetarian sharing platters for starters, followed by roast chicken or goats cheese strudel and a trio of deserts. 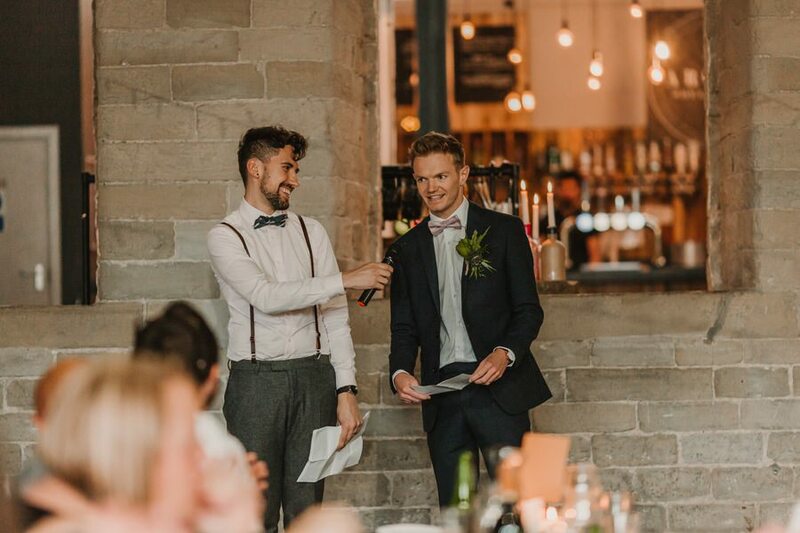 No-one can say they were not fed well at our wedding! 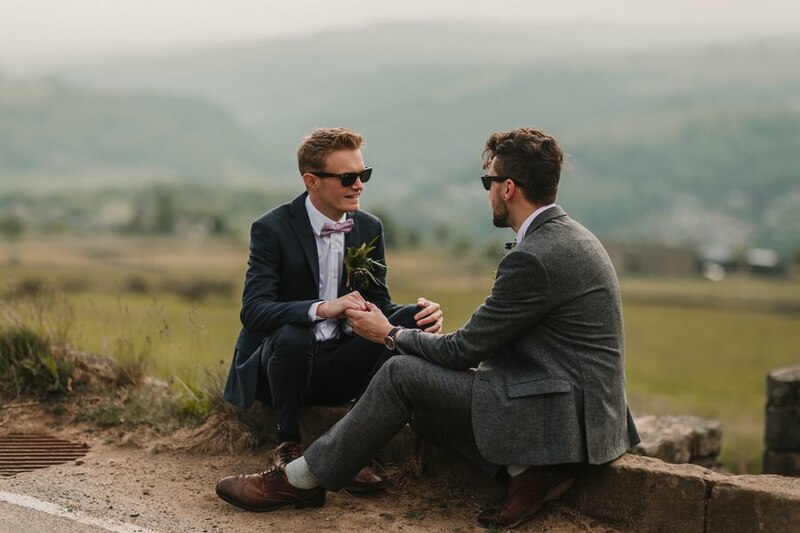 As two big music fans, the evening playlist was given just as much thought as our suits or table planning. 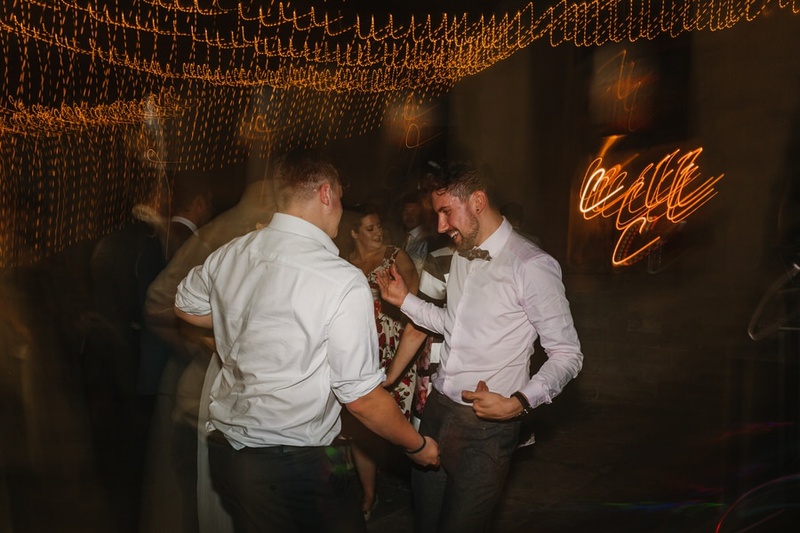 And what a playlist it was! 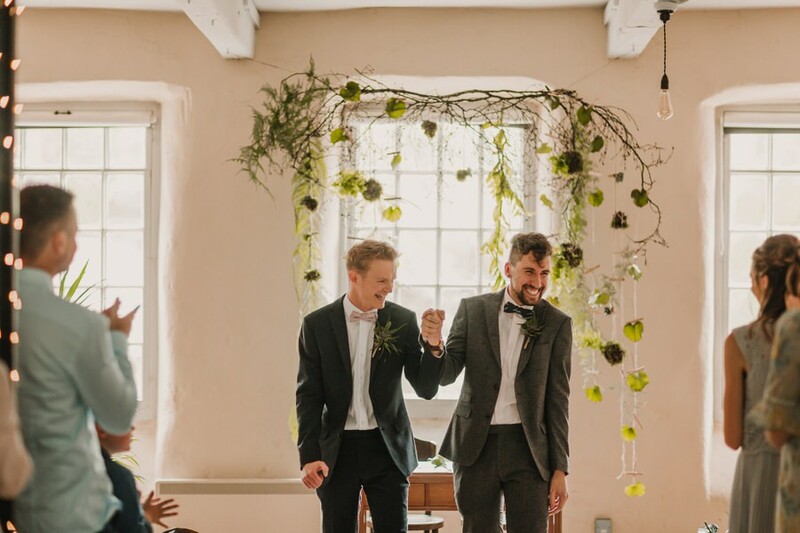 We debated for a long time whether to have a first dance or not (public affection vs. nice pictures) and eventually decided to have a short one – an acoustic verse and chorus of Sweet Female Attitude’s ‘Flowers’ – followed by the dance version. 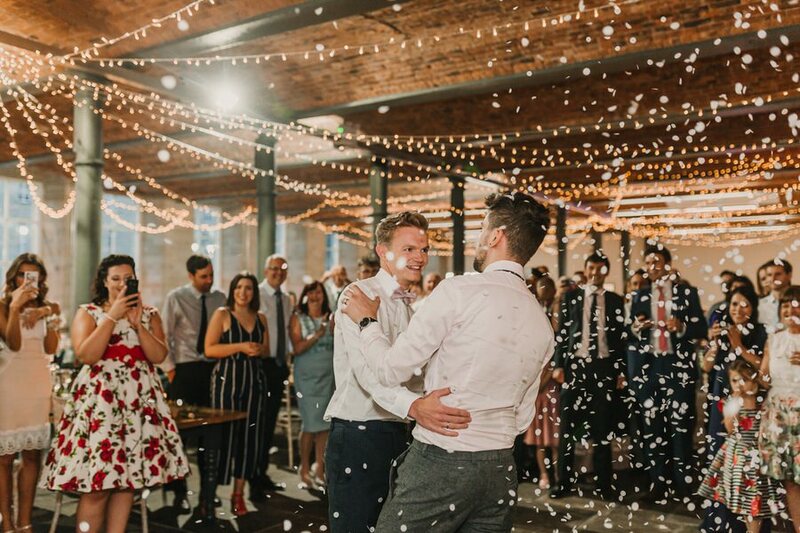 A brief (and hilarious) premature confetti canon explosion lightened the pressure and we’re glad we did it. 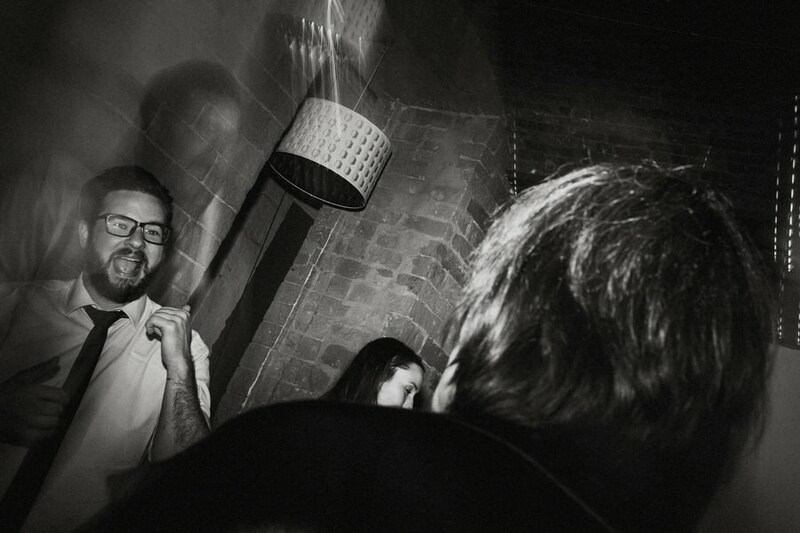 The dancefloor was the place to be all night, as well as the late photobooth, games area and, of course, the bar. 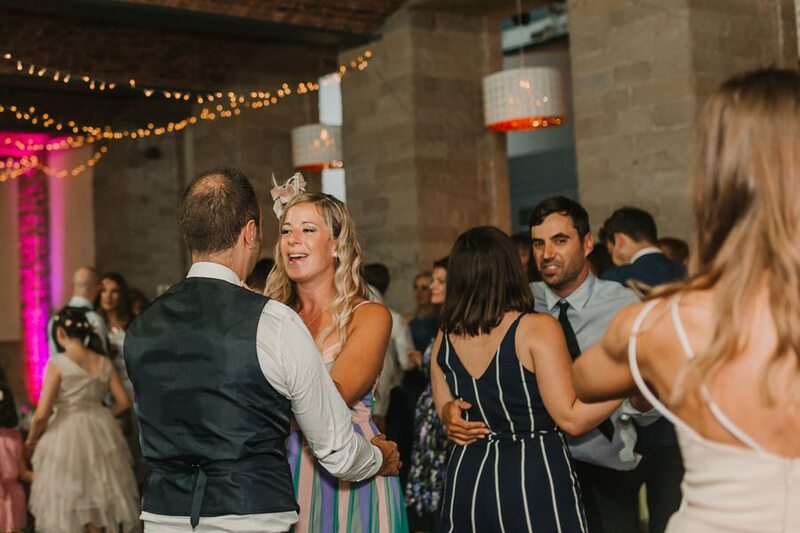 We partied hard until 1am and saw our guests again the following morning for a wedding debrief / hangover brunch in the morning, again catered by Eat Me, Drink Me. 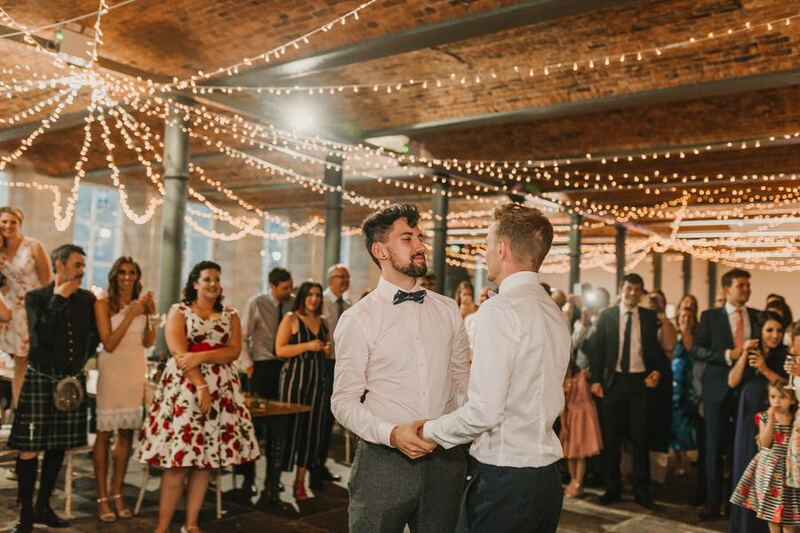 As cliché as it sounds, we, quite simply, had the best day and an amazing weekend. 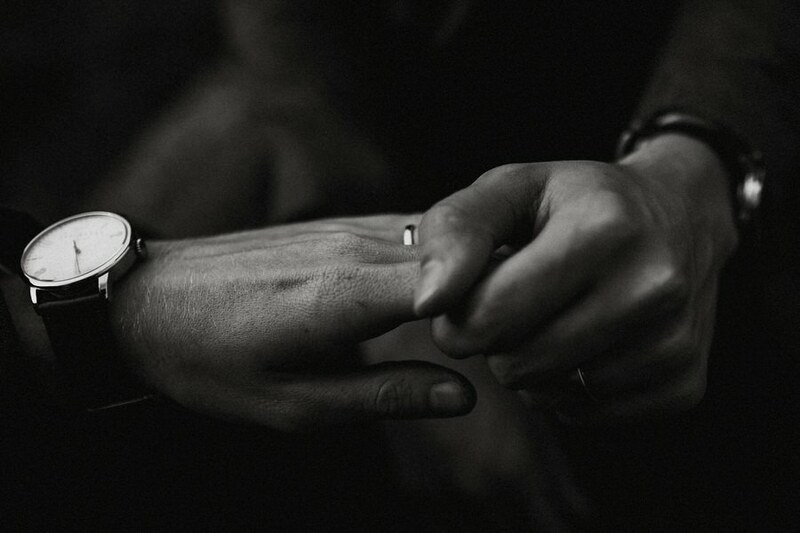 Everyone we loved was together and every single detail was carefully considered. 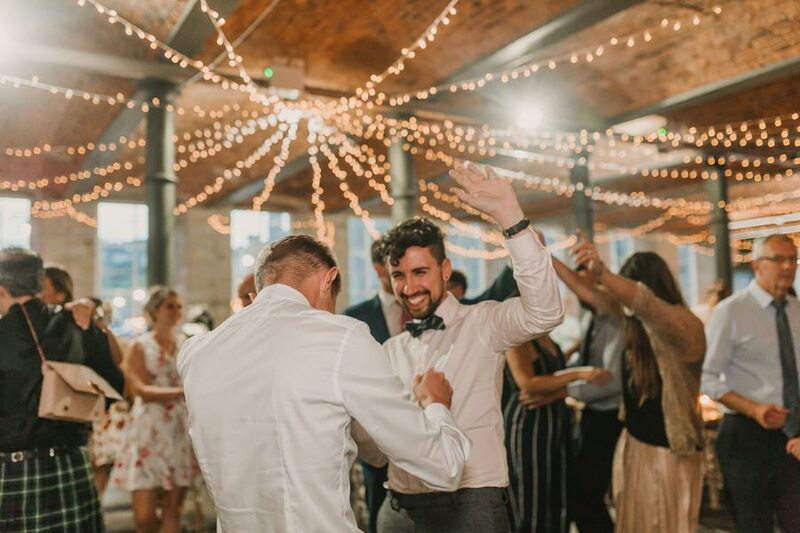 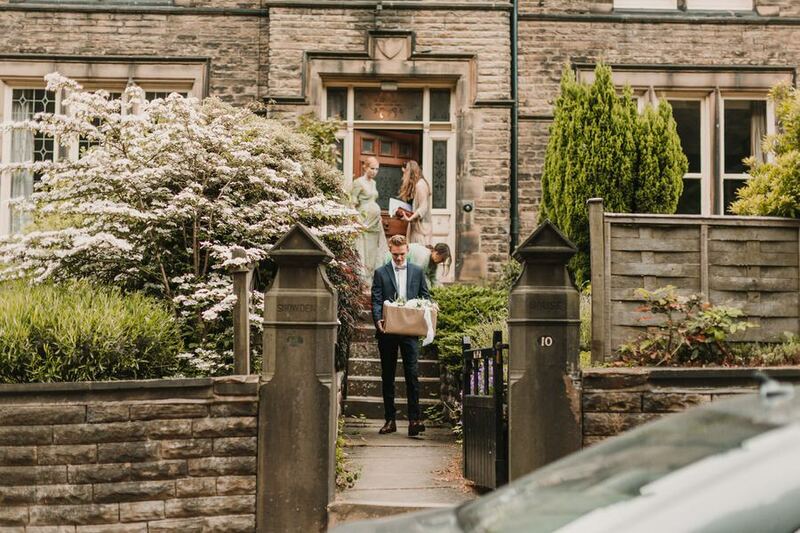 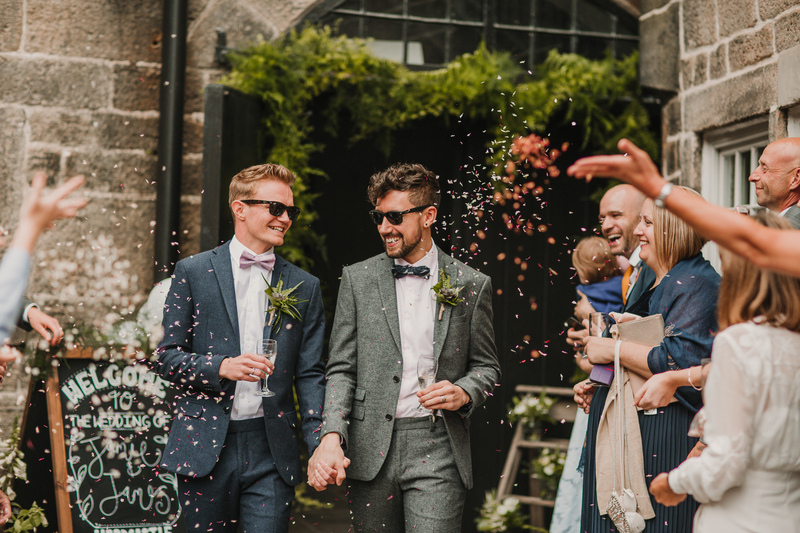 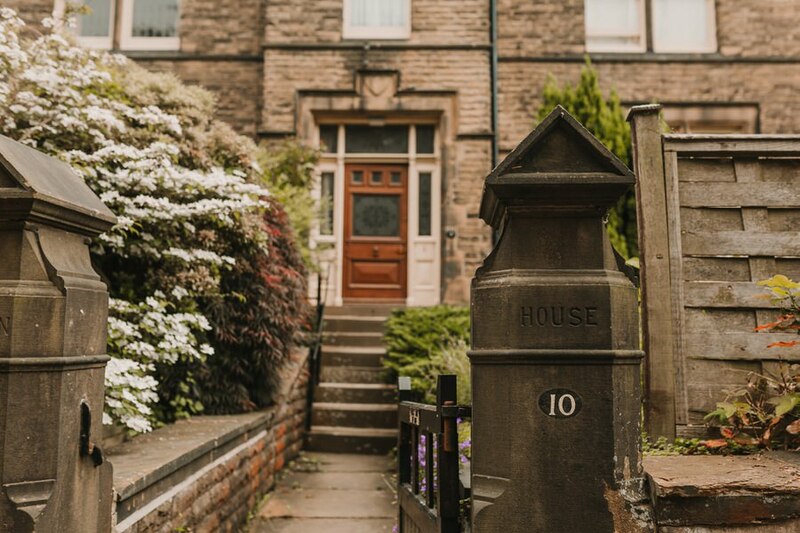 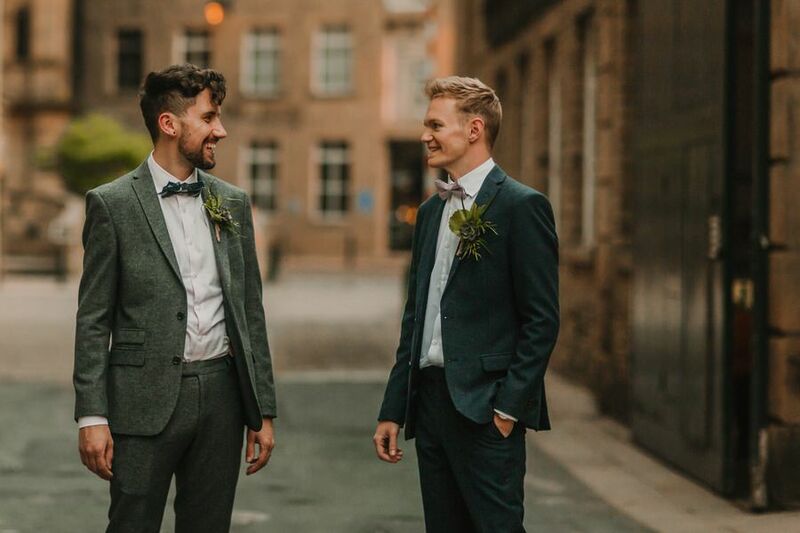 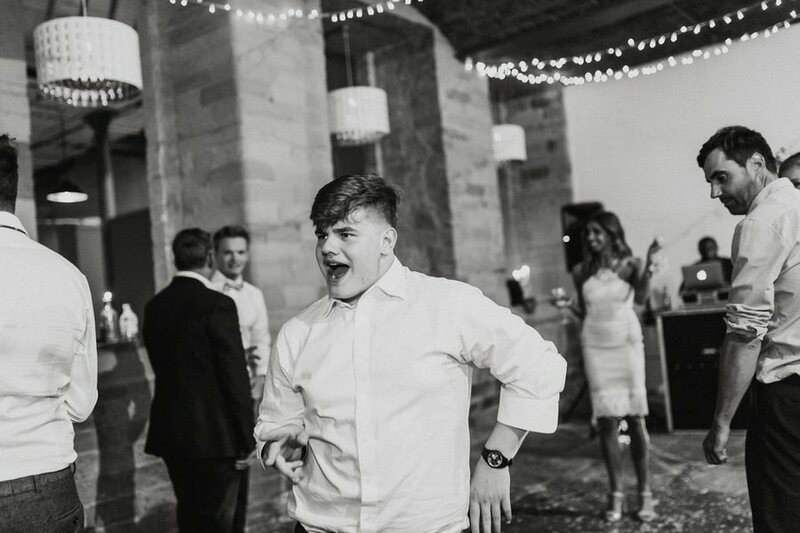 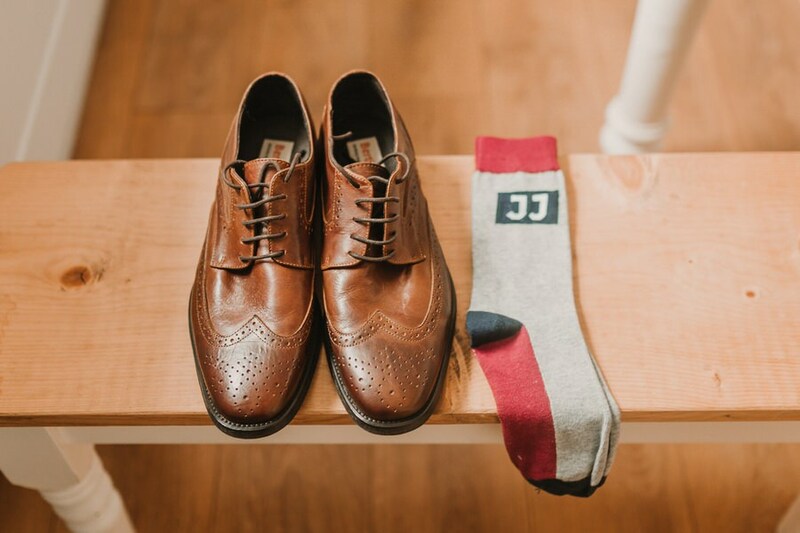 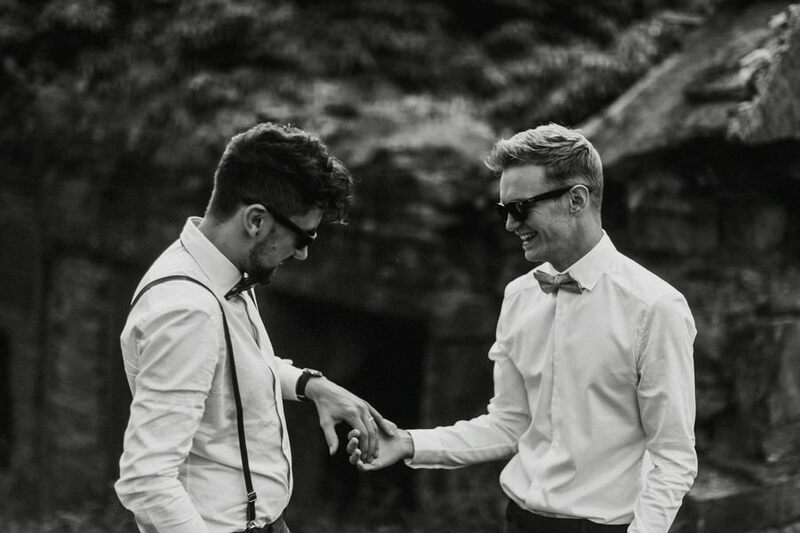 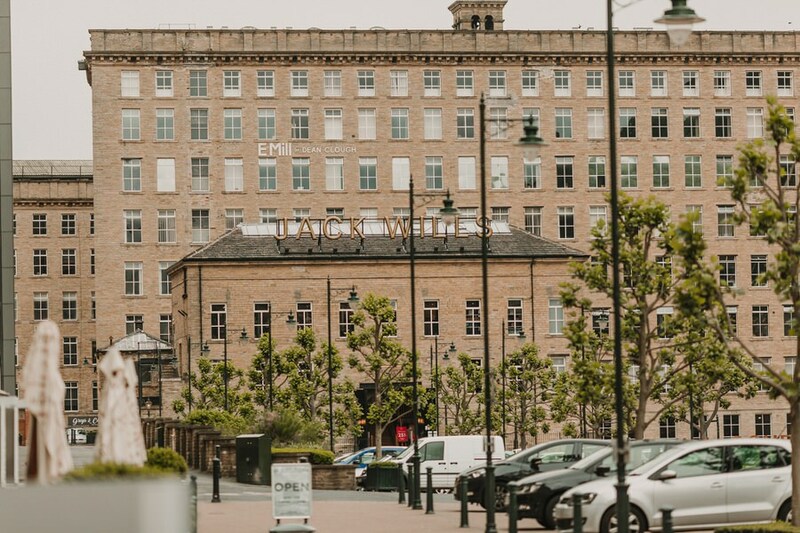 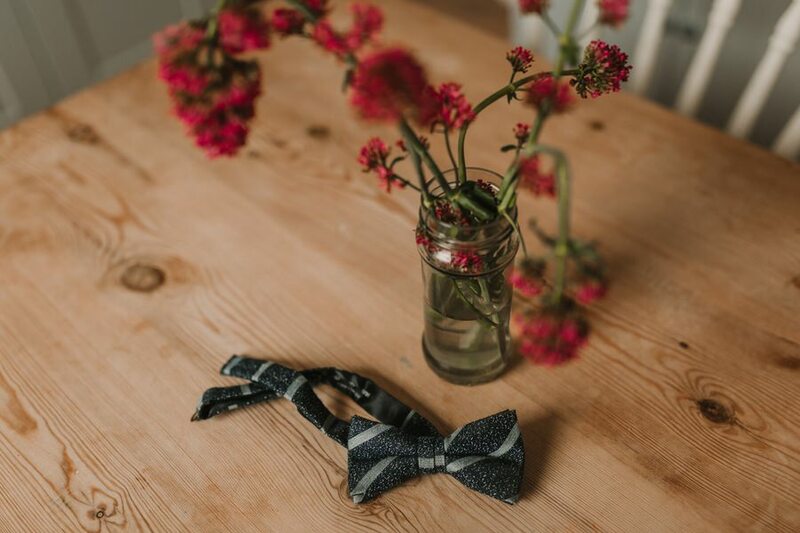 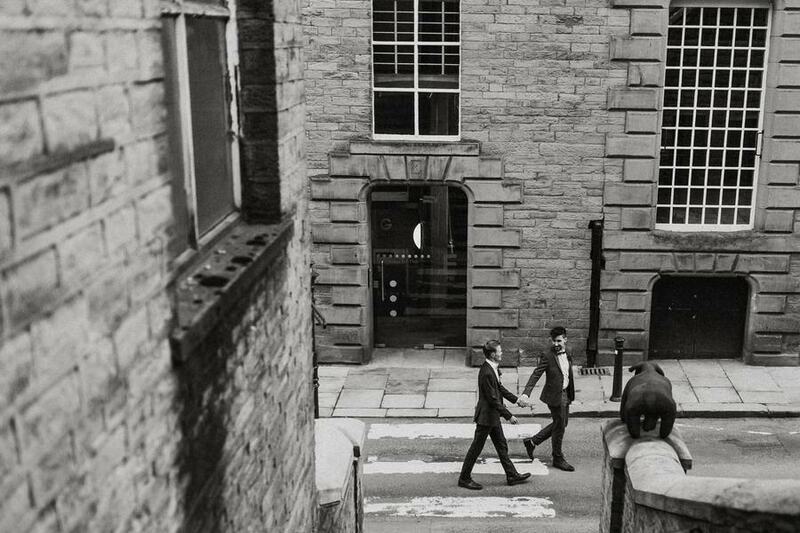 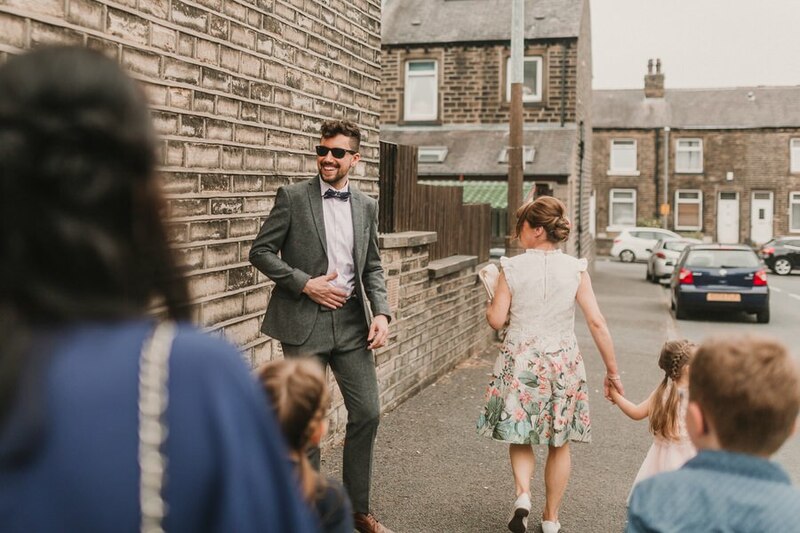 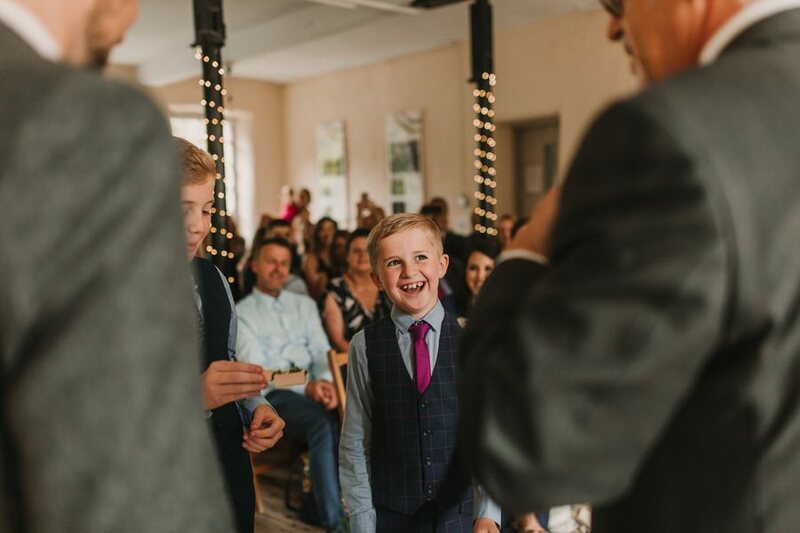 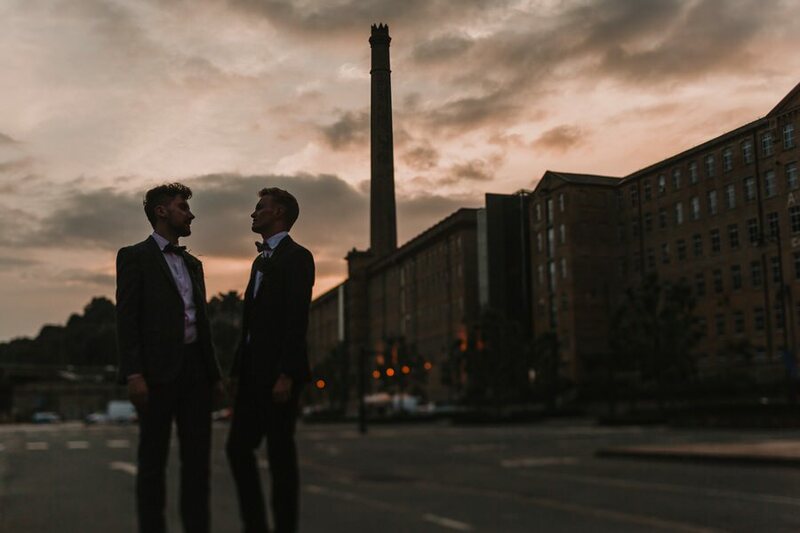 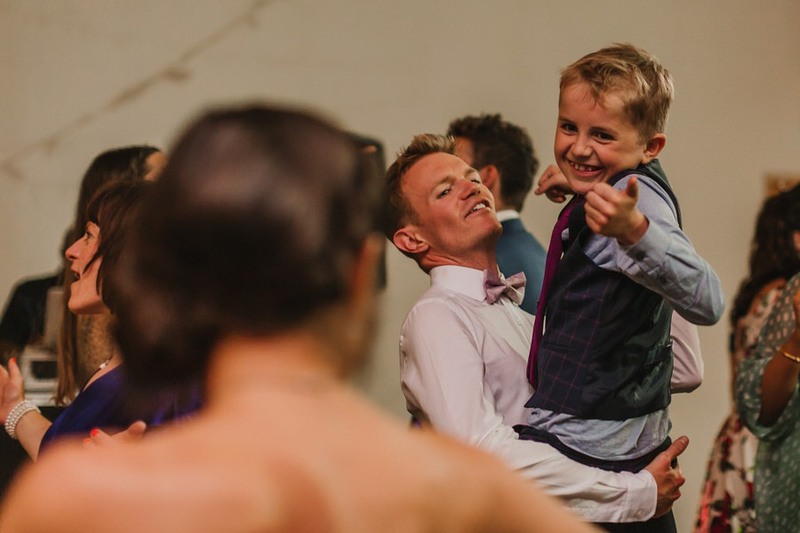 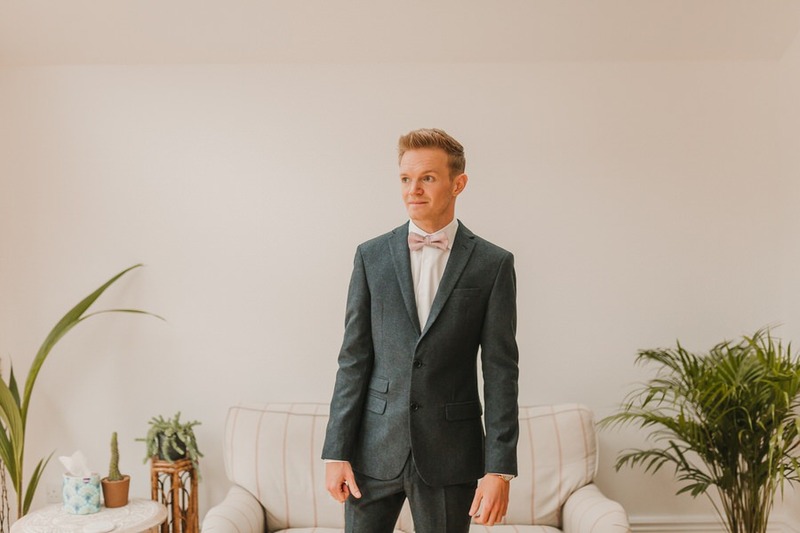 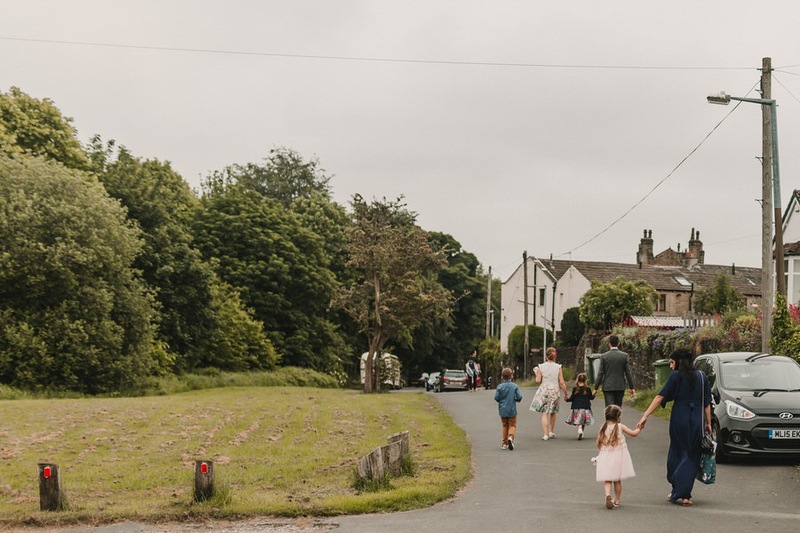 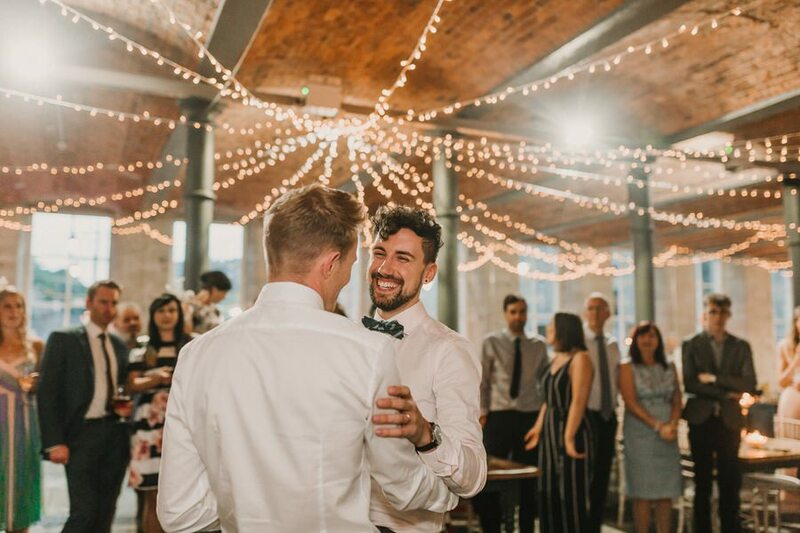 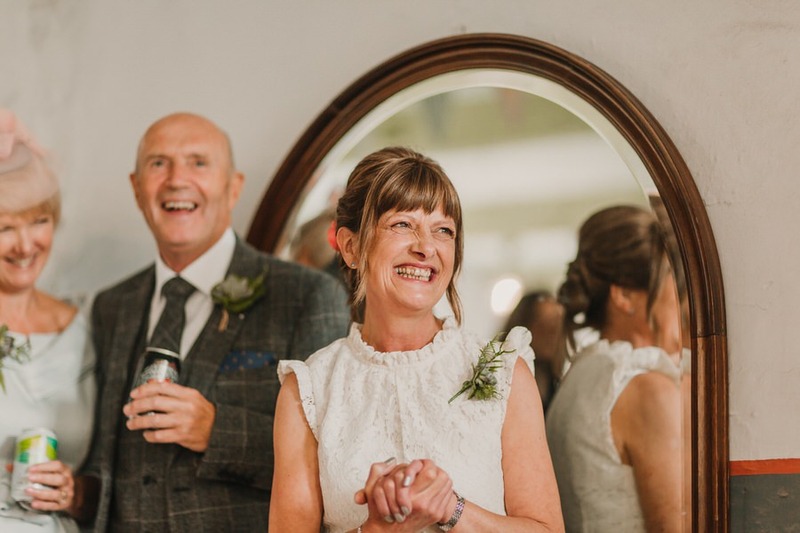 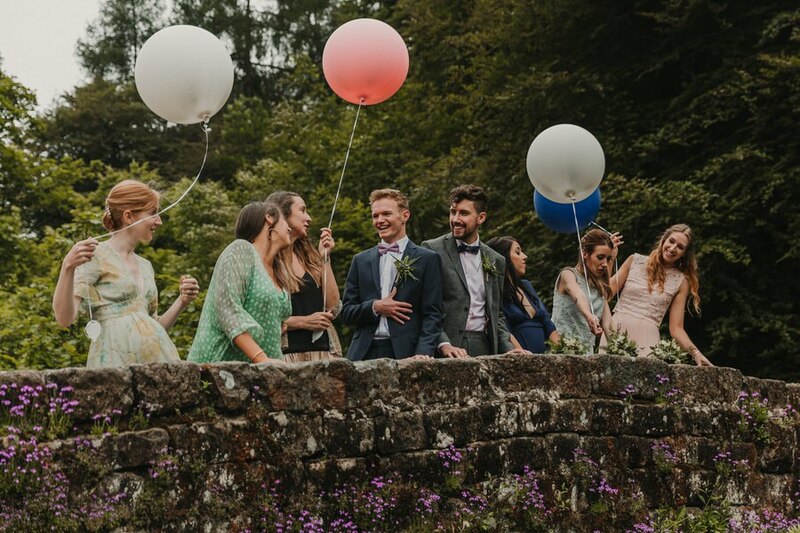 We stayed Yorkshire and really heighted the county in all its glory – from the picturesque, woodland beauty and vintage-feel of Gibson Mill to the grand, historic and industrial Arches, we found our local area had everything we needed to create our dream wedding. 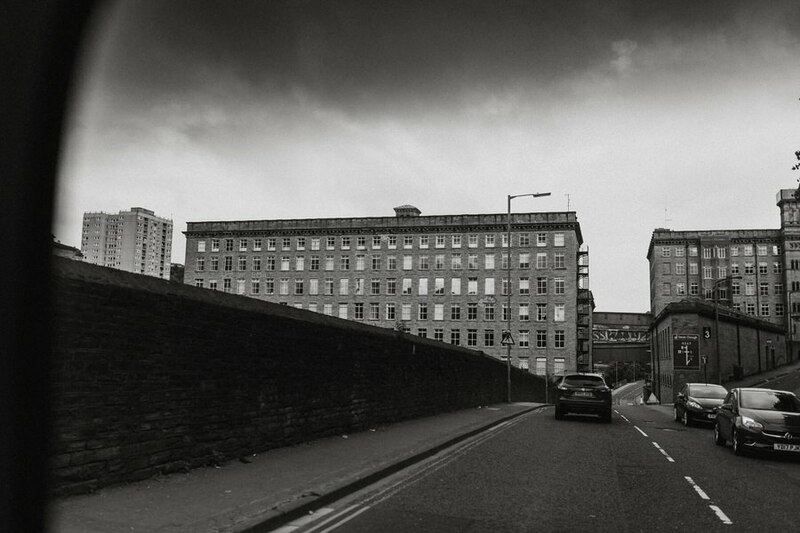 Why would we have ever gone anywhere else? 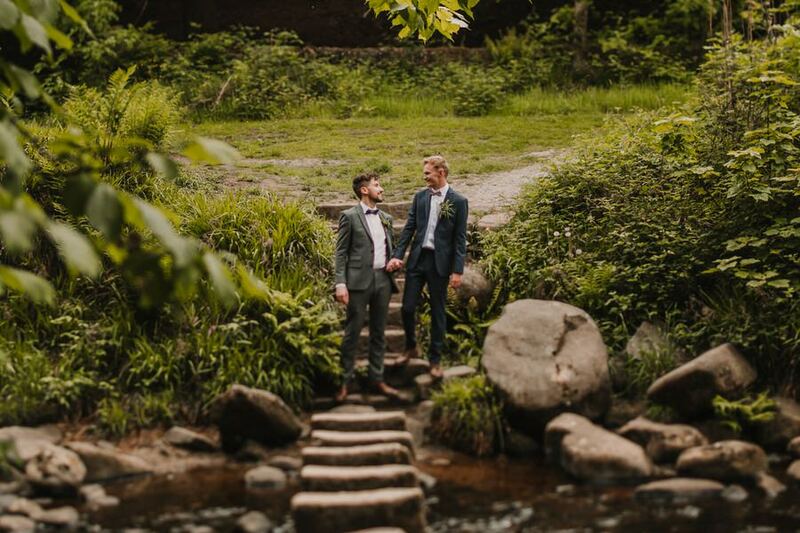 Jamie and James’ gorgeous botanical inspired wedding, took place at Gibson Mill, a National Trust site situated in the valley of HardCastle Crags, Hebden Bridge. 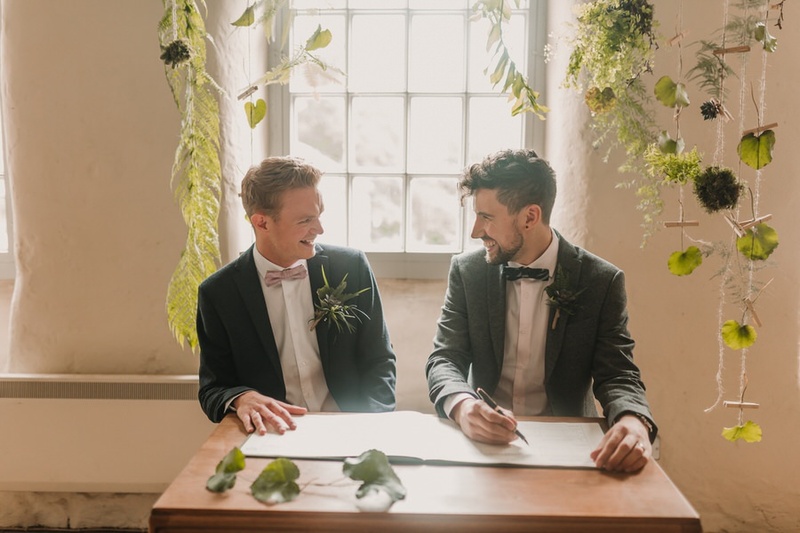 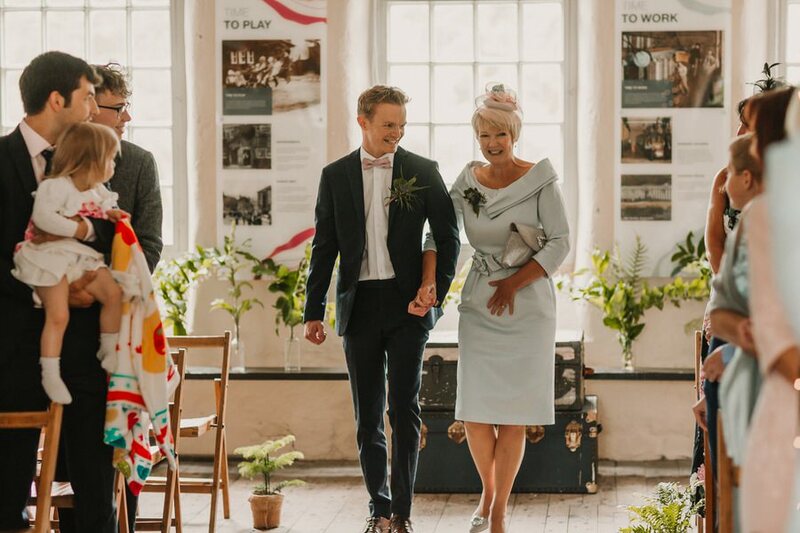 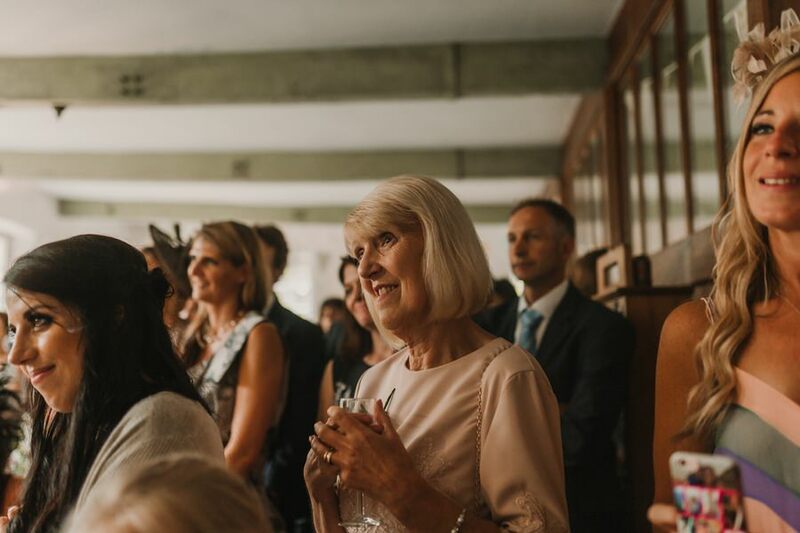 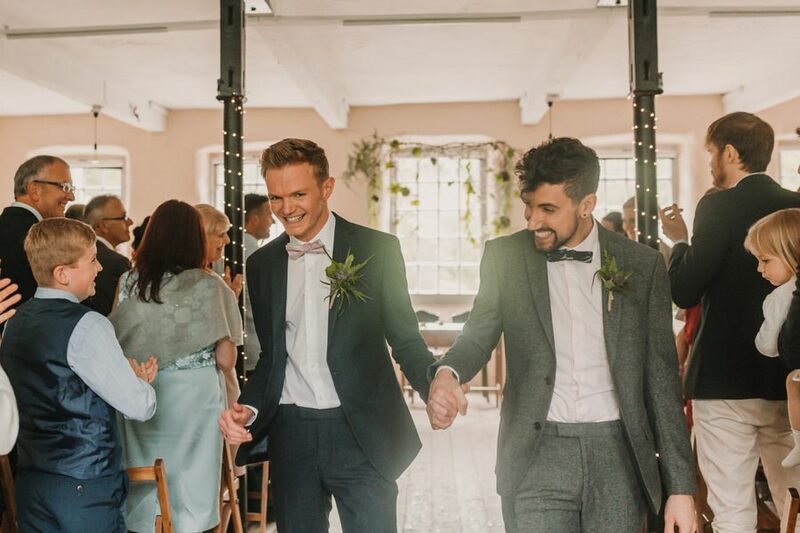 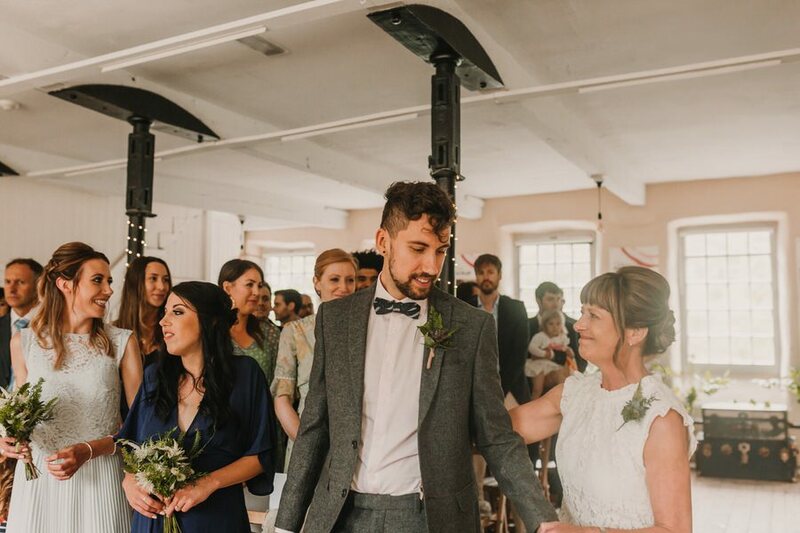 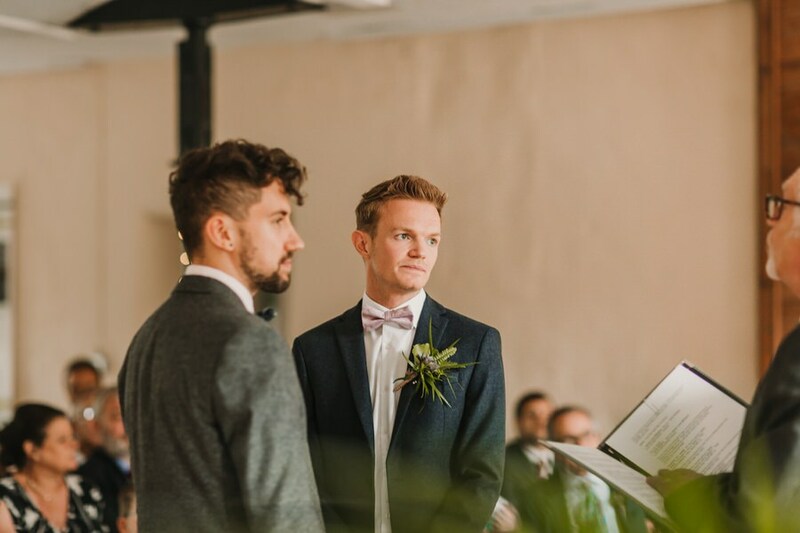 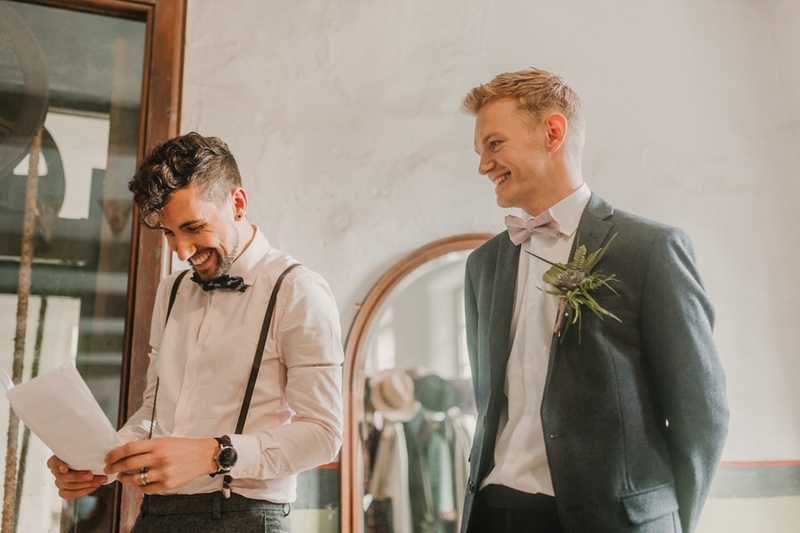 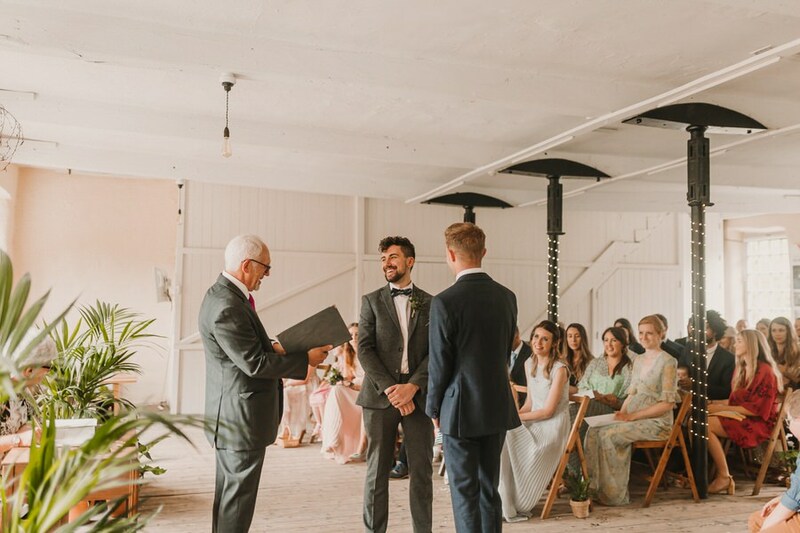 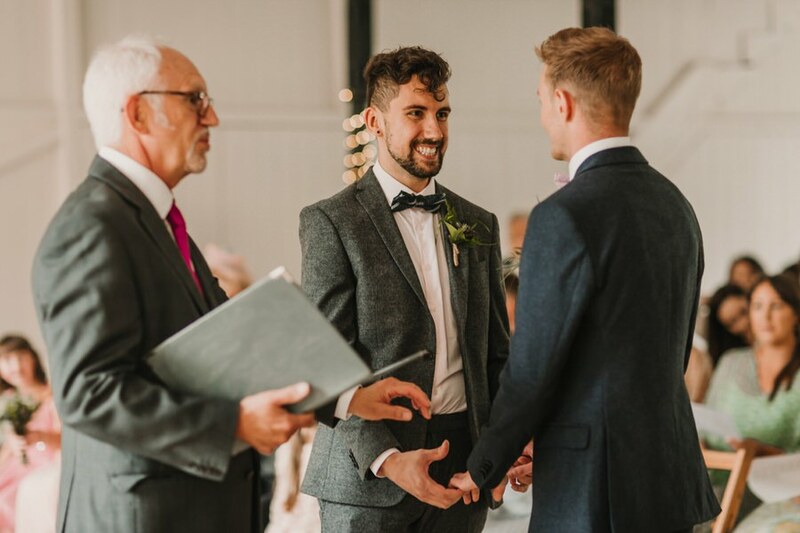 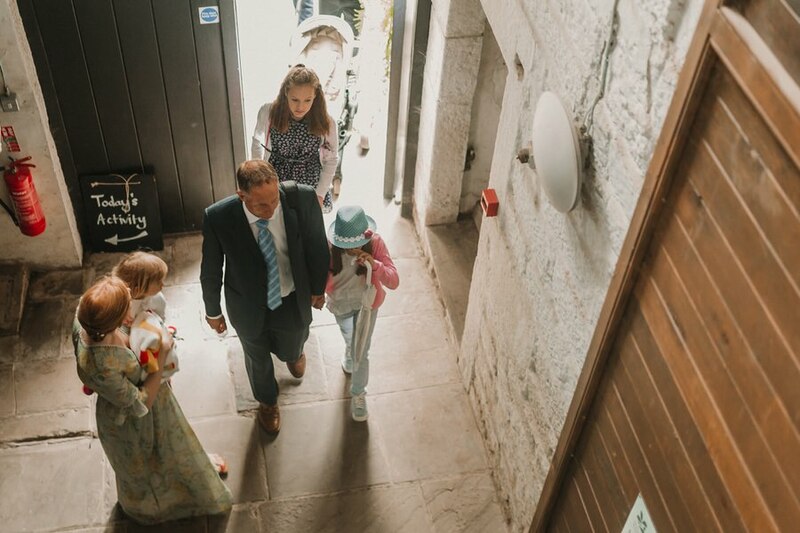 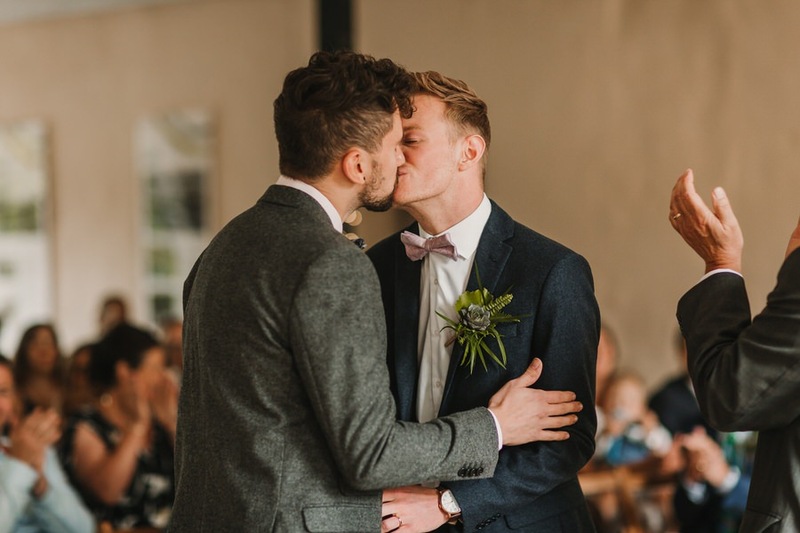 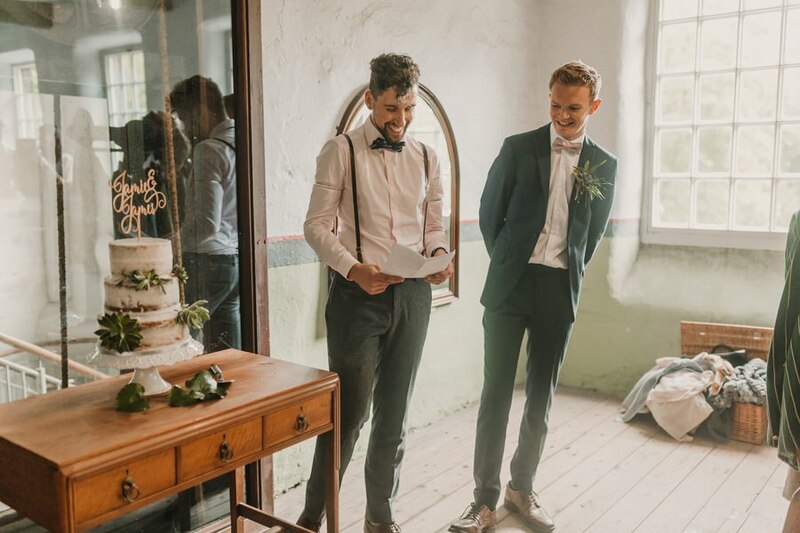 The ceremony took place in the upper floor of the mill which was adorned with plants and succulents and vintage wooden furniture, before heading down to another floor of the mill for afternoon tea, cake cutting and speeches. 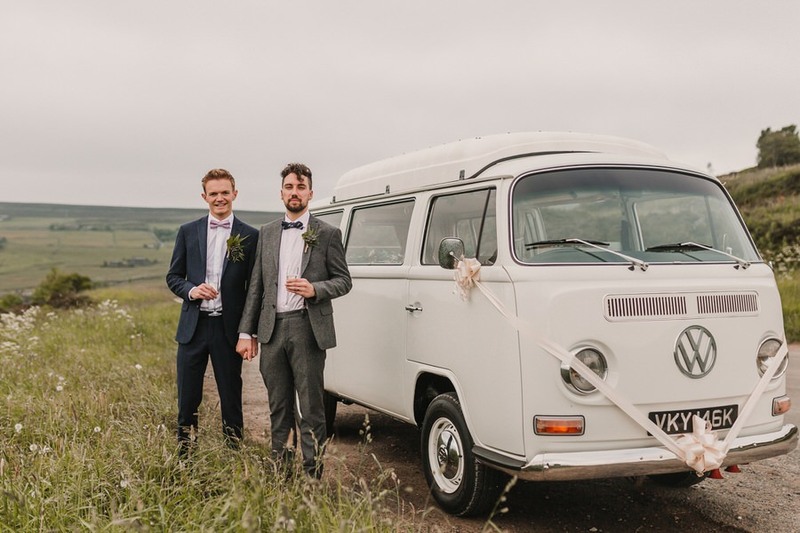 The reception part of the wedding was over in Halifax, so I went with the two grooms over onto the moortops for beautiful photographs with their campervan before making an entrance at Dean Clough’s ‘The Arches’. 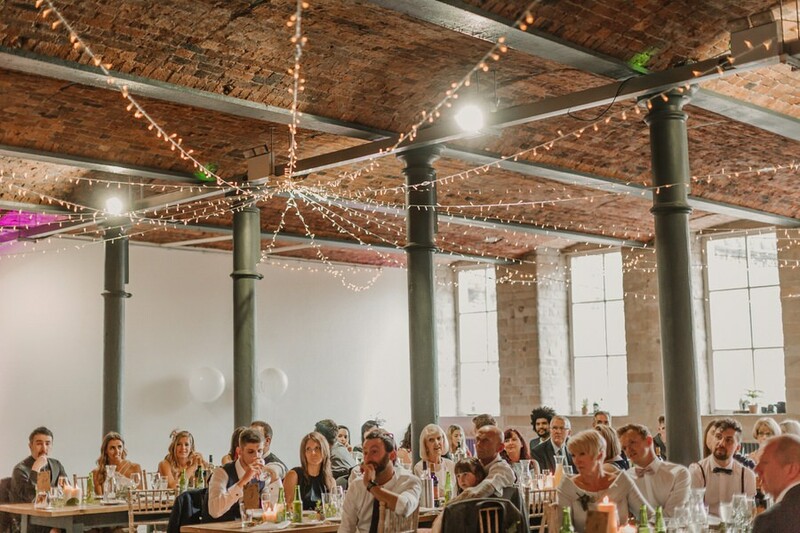 The Arches has a perfect blend of modern and industrial with long tables, white walls criss-crossing fairy lights across the ceilings. 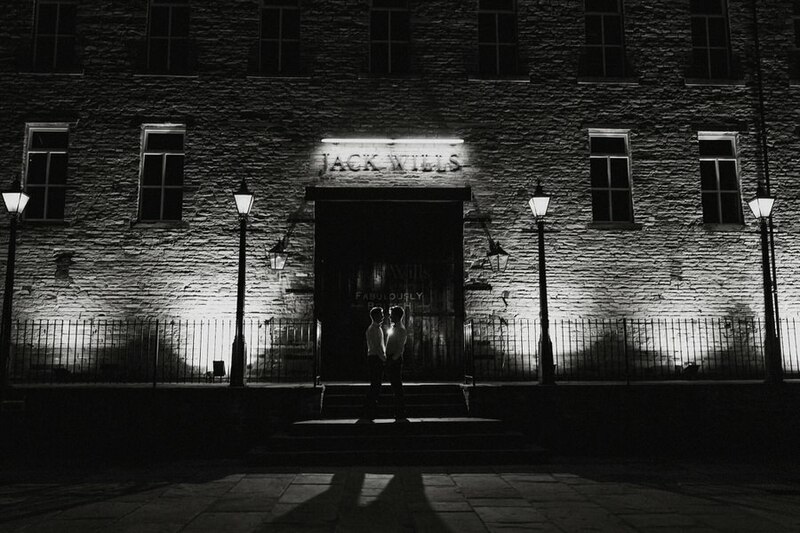 The boys wanted some photographs to show off the local architecture, so we had more photos of the modernised mills before heading back inside to dance the night away. 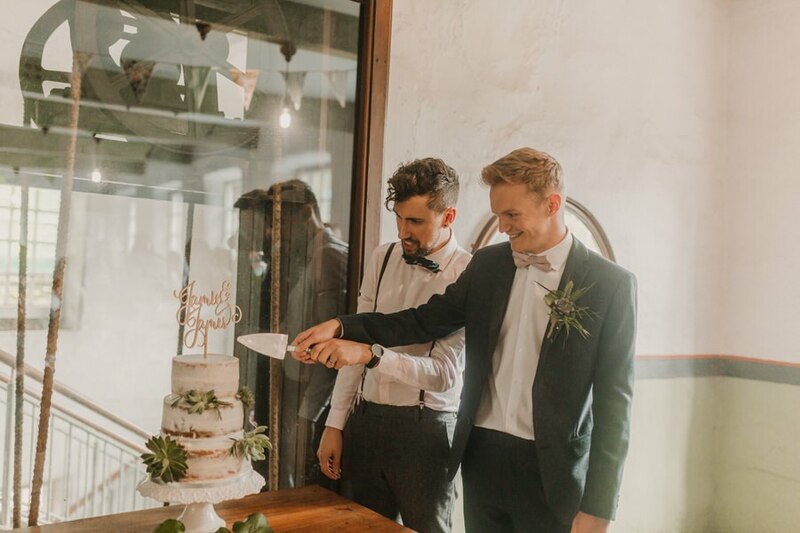 Cake: The Han-Made Catering Co. 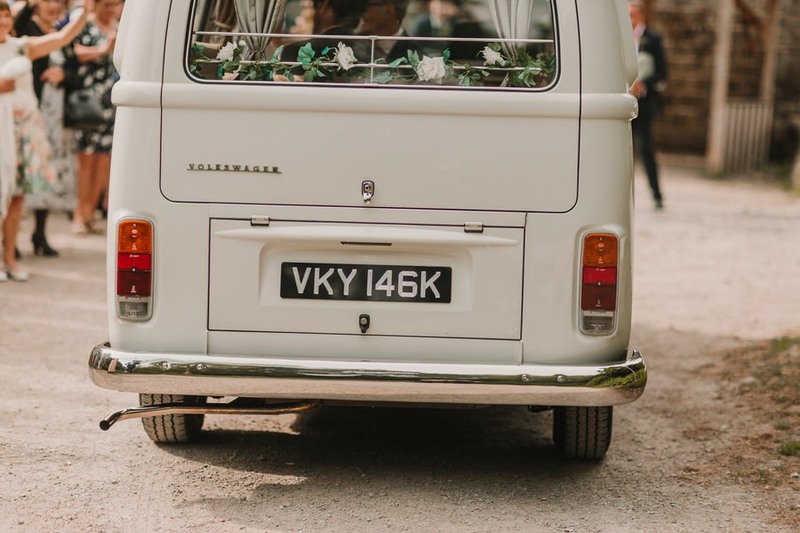 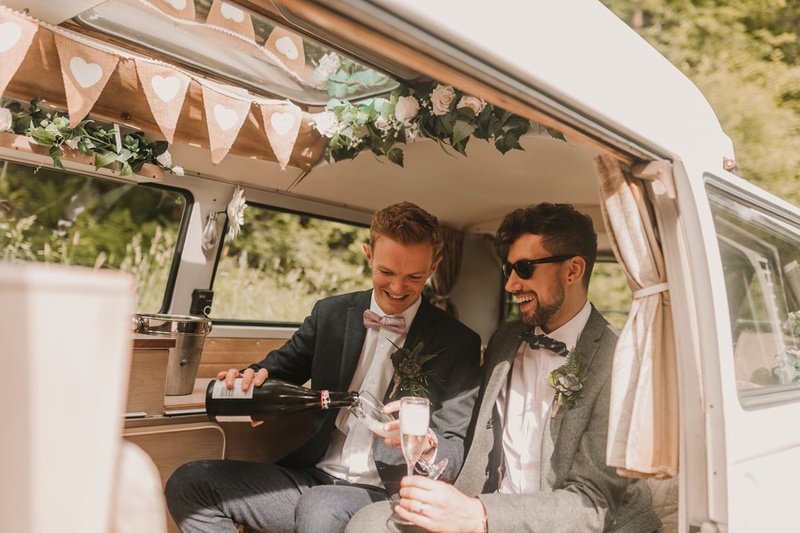 Afternoon Tea: The Han-Made Catering Co.
Campervan & Photo Booth: The Volkswagen Wedding Co. 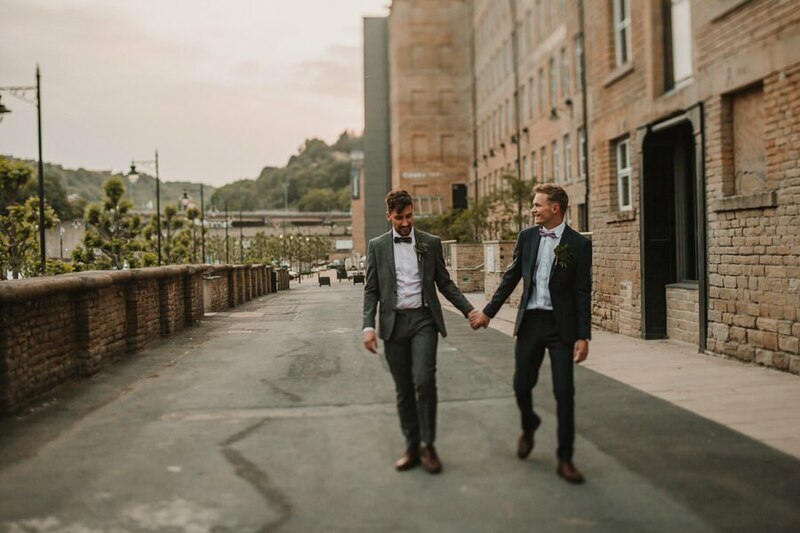 If you are planning a Gibson Mill wedding or a wedding at Dean Clough’s The Arches and need a Halifax or Leeds Wedding Photographer, please get in touch here in order to find out more about my services.